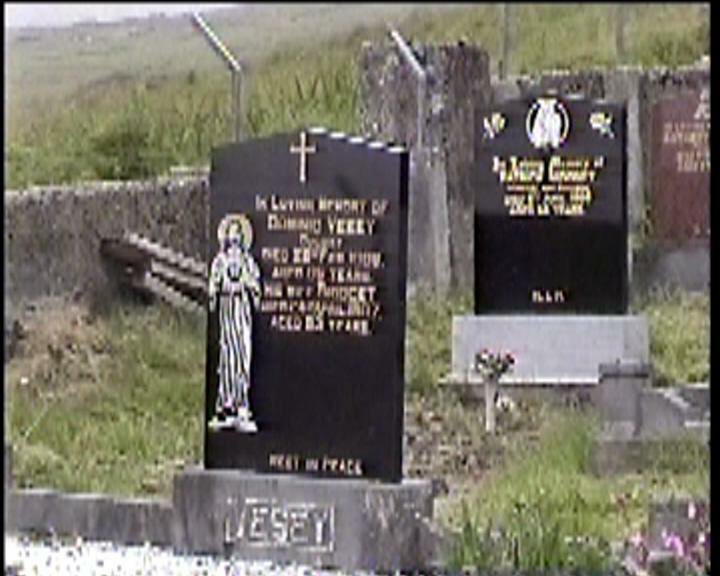 Slievemore Cemetery is located on Achill Island north of Keel and Dooagh at the base of Slievemore (An Sliabh Mór). I visited the cemetery in July of 2004 and videotaped headstones as I walked among the ruins, then transcribed these after returning. 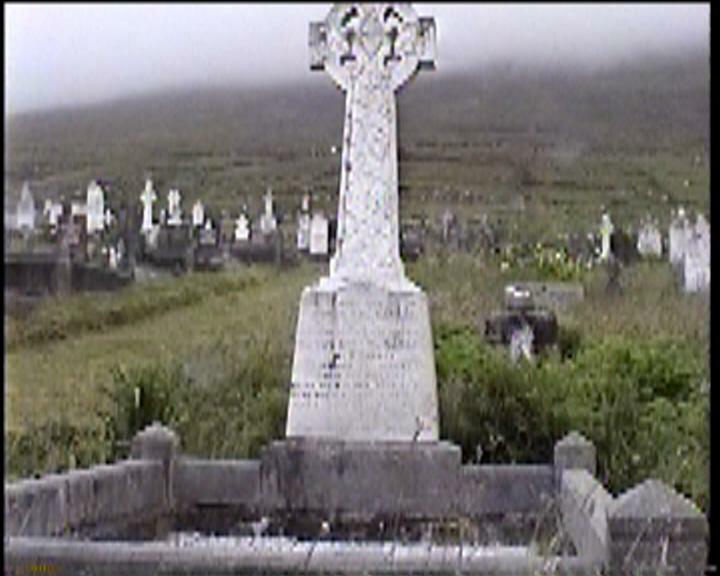 We were on a day trip around Achill and found the cemetery while looking for the Deserted Village which is just next to the cemetery at the base of the mountain. 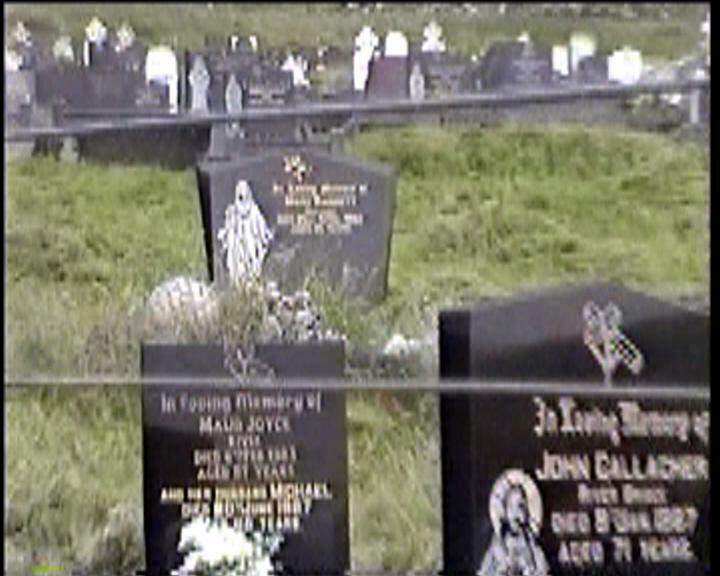 I have video captures (sorry, not the greatest quality) of all the graves with numbers. 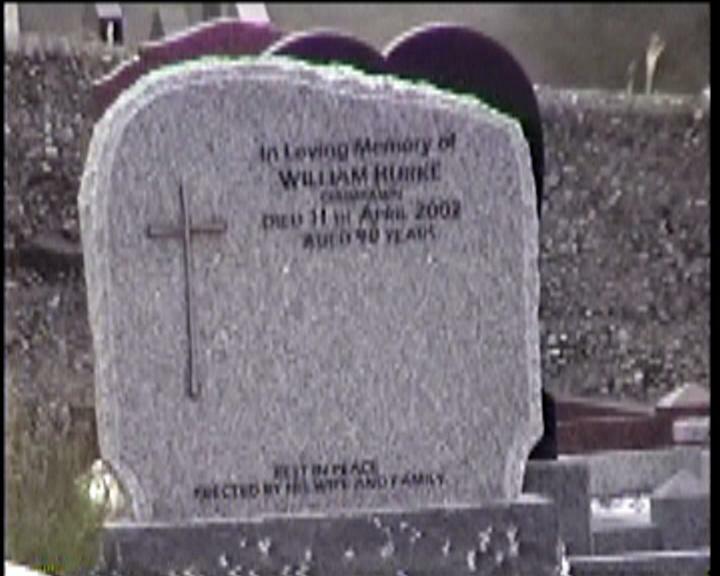 Click on the number to see a snapshot of the headstone. In Loving Memory of ? and her husband JOHN died 13th Jan. 2000 aged 84 years. In Loving Memory of BRIDGET MCNAMARA (nee BARRETT) Keel. Died 3 Dec. 1980 aged 82 years. Her husband JOHN died 11 Jan. 1987 aged 89 years. On their souls Sweet Jesus Have Mercy. Erected by ANNIE and NORA BARRETT Cleveland, Ohio. 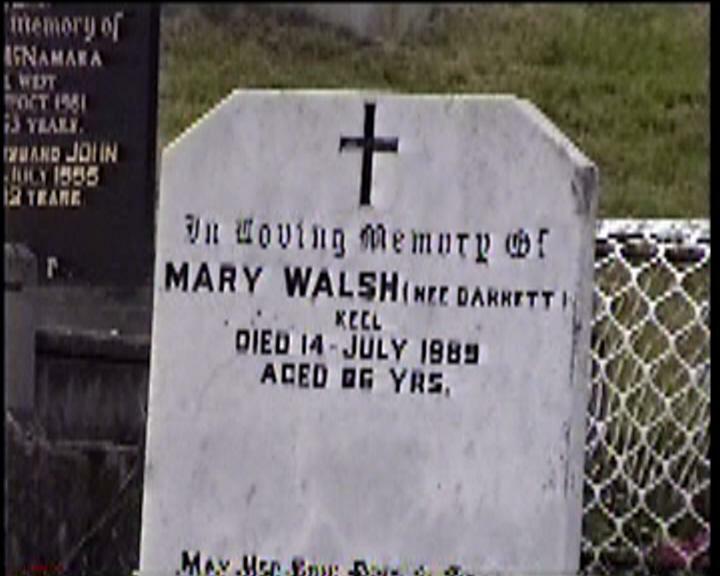 In Loving Memory of MARY WALSH (nee BARRETT) Keel Died 14 July 1989 aged 86 years. In Loving Memory of ANNIE BARRETT Cleveland, Ohio and Keel. Died 11 June 1990 aged 81 years. Our Lady of Knock pray for her. Erected by her sister NORA Cleveland, Ohio. 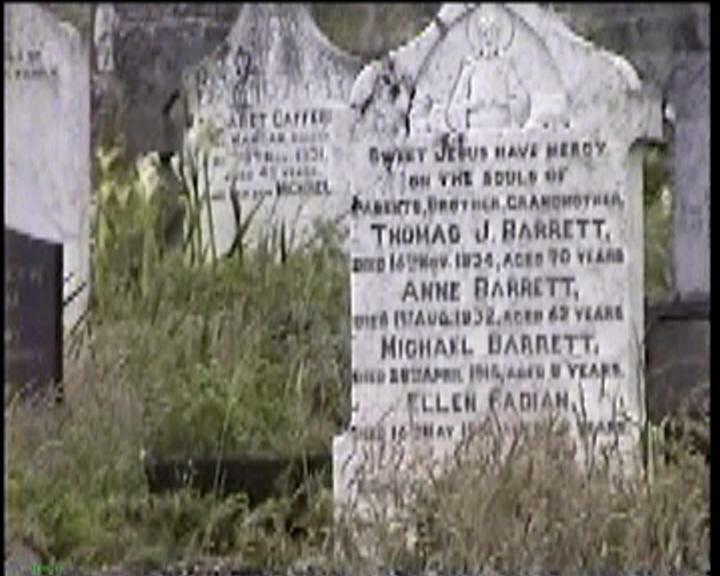 Sweet Jesus have mercy on the souls of Parents, Brother, Grandparents THOMAS J. BARRETT, died 16th Nov. 1934, aged 70 years. 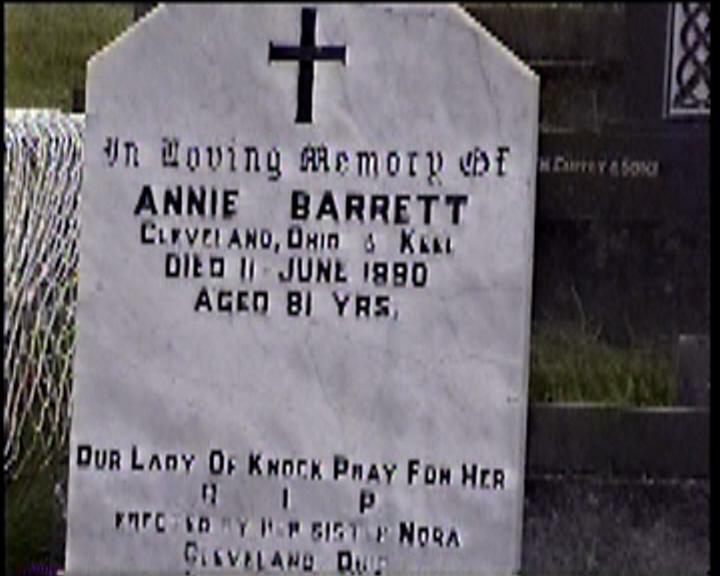 ANNE BARRETT, died 1st Aug. 1932 aged 62 years. 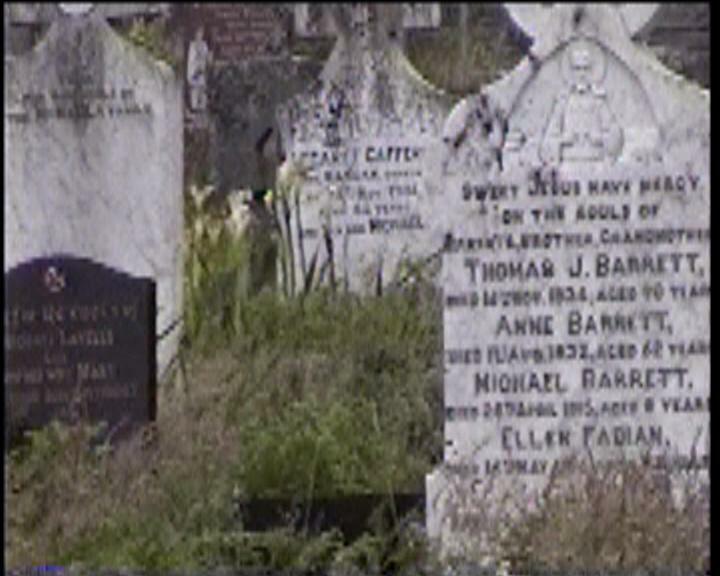 MICHAEL BARRETT, died 28th April 1915 aged 8 years. ELLEN FADIAN died 16th May 19? Aged ? years. 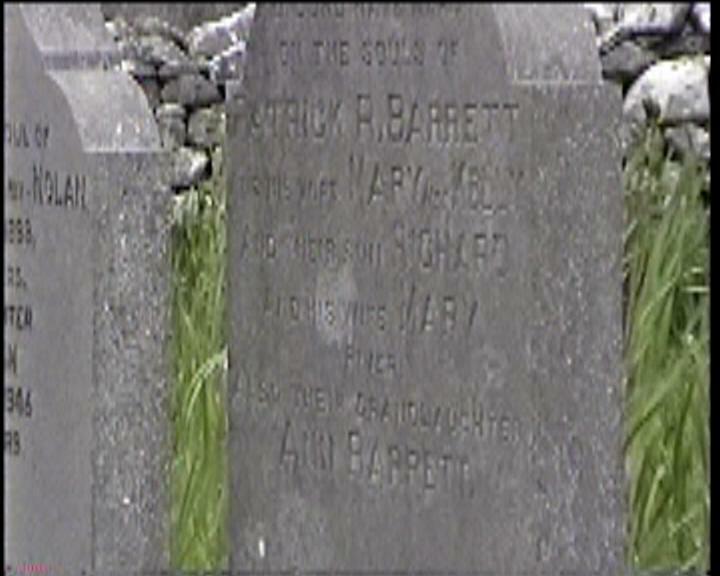 O Lord Have Mercy on the souls of PATRICK R. BARRETT and his wife MARY nee KELLY. And their son RICHARD and his wife MARY River. Also their granddaughter ANN BARRETT. 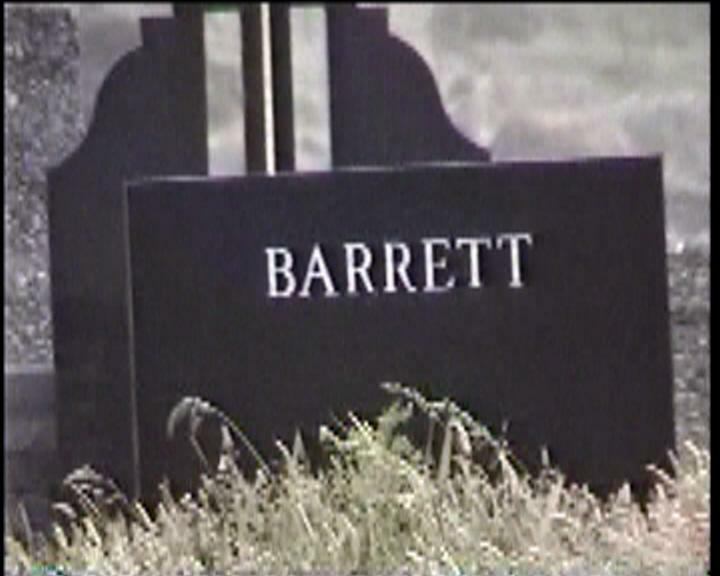 In Loving Memory of MARGARET BARRETT River. And her husband JAMES. 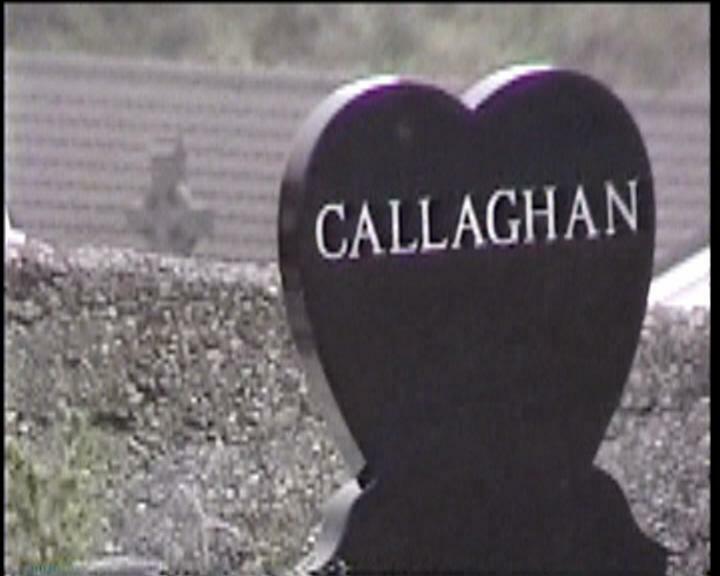 Also their daughter MARY GALLAGHER. In Loving Memory of MARY BARRETT Ballinock Died 23rd April 1983 aged 56 years. In Loving Memory of MARY BARRETT died 23rd April 1963 (could be 1983) aged 56 years. 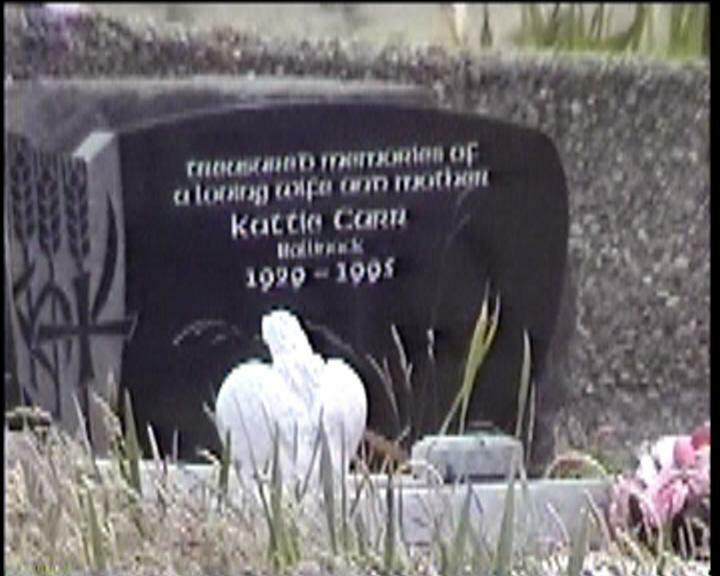 In Loving Memory of MAUREEN KELLY nee BRENNAN Pollagh and Yorkshire Died 28th March 1994. 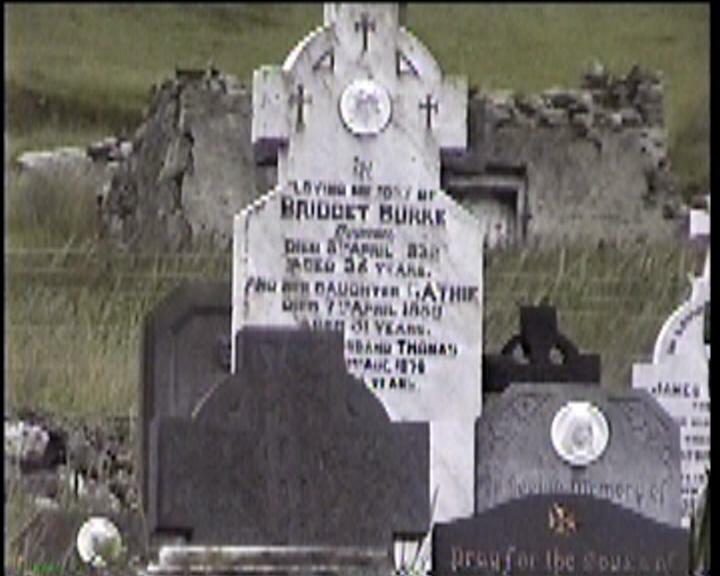 In Loving Memory of BRIDGET BURKE Dooagh Died 5th April 1932 aged 36 years. And her daughter CATHIE died 7th April 1958 aged 31 years. Her husband THOMAS died ? Aug. 1979 aged ? years. 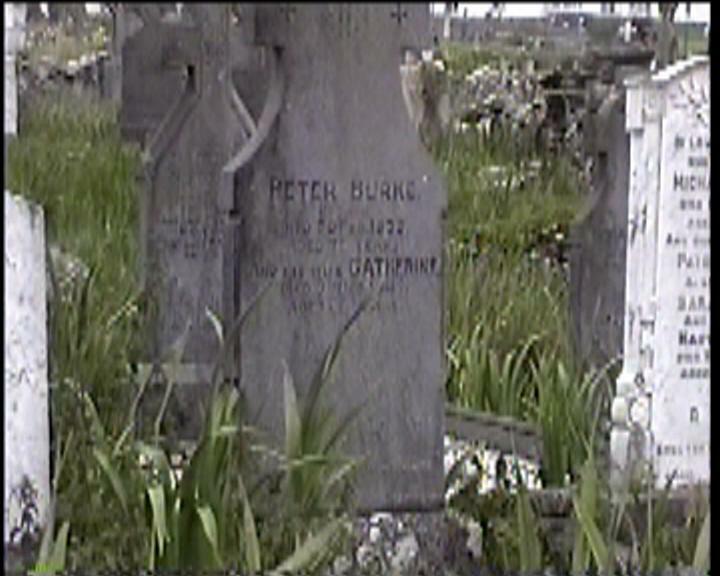 PETER BURKE Dooagh Died 26th Feb. 1933 aged 79 years. And his wife CATHERINE died 3rd Dec. 1947 aged ? In Loving Memory of our dear father MICHAEL MANGAN died 13th Mar. 1939 aged 76 years. And our Grandfather PATRICK BURKE. 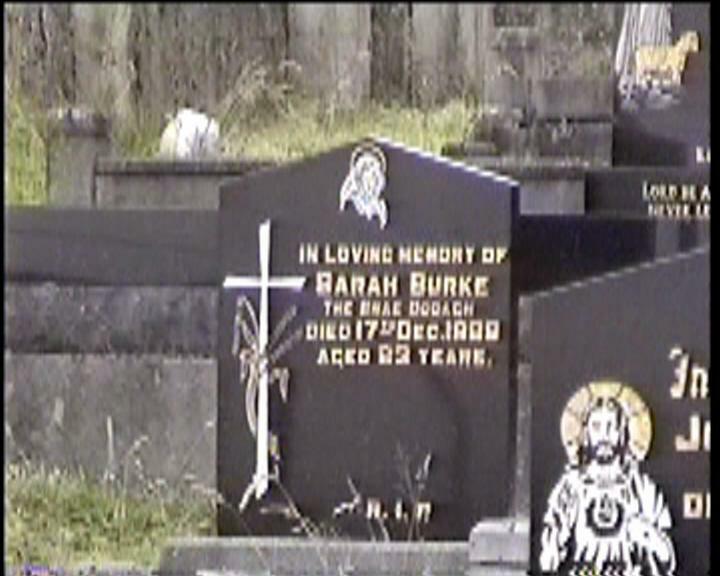 Also our aunt SARAH BURKE. And our mother MARY MANGAN died 11th Oct. 1957 aged 86 years. 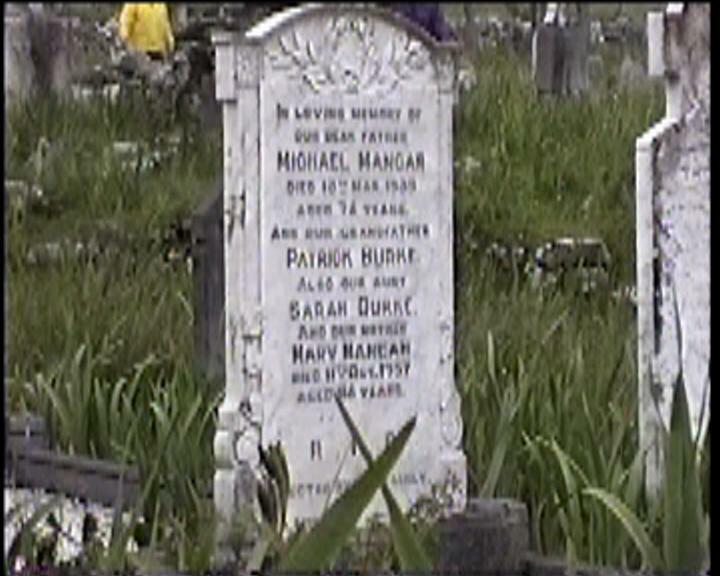 MICHAEL BURKE Dooagh Died 15th Sep. 1942 aged 43 years. 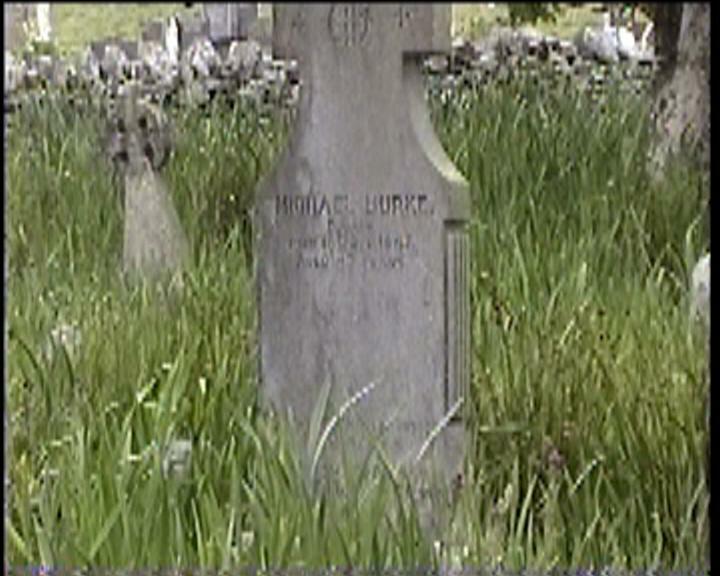 Pray for the souls of THOMAS BURKE Pollagh Died 13th Dec. 1949 aged 76 years. 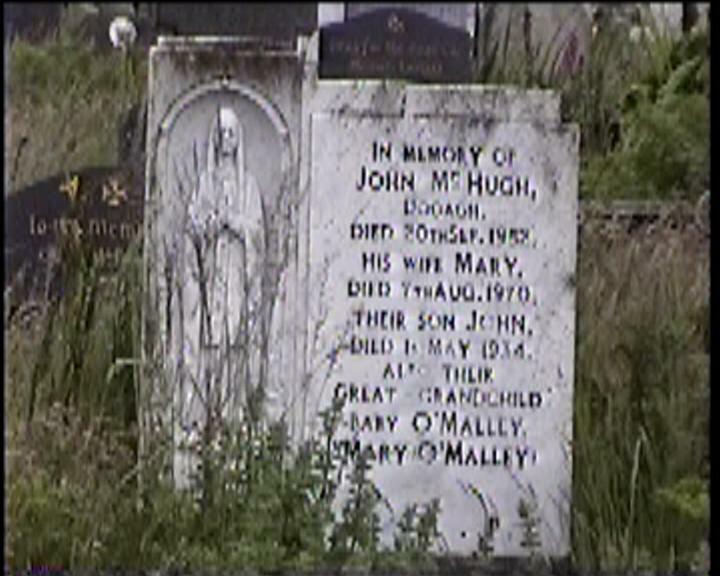 And his wife MARY died 21 Jan. 1949 aged 73 years. Also their children JULIA and MAUD and his mother JULIA BURKE. In Loving Memory of BRIDGET ALICE BURKE Dooagh. Died 21st Sept. 1987 aged 89 years. And her husband SONNY died 9th July 1993 aged 90 years. In Loving Memory of SARAH BURKE, The Brae, Dooagh. Died 17th Dec. 1989 aged 83 years. In Loving Memory of PATRICK CAFFERKEY Dugort East. Died 5th June 1940 aged 57 years. 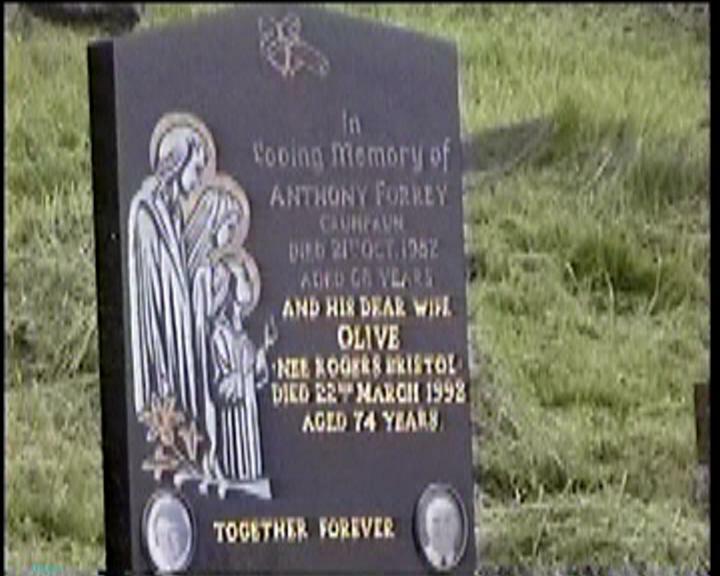 And his wife ANNE (nee FORRY) died 5th Sept. 1986 aged 90 years. 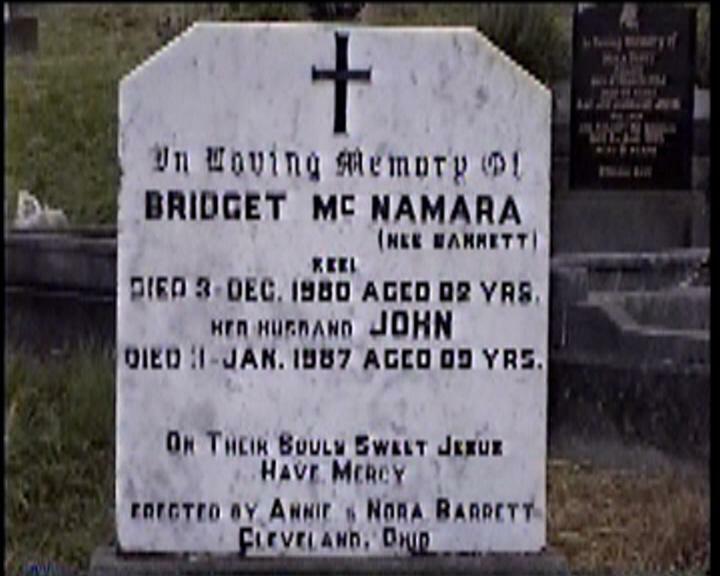 And his sister BRIDGET died 17th Feb. 1941 aged 68 years. 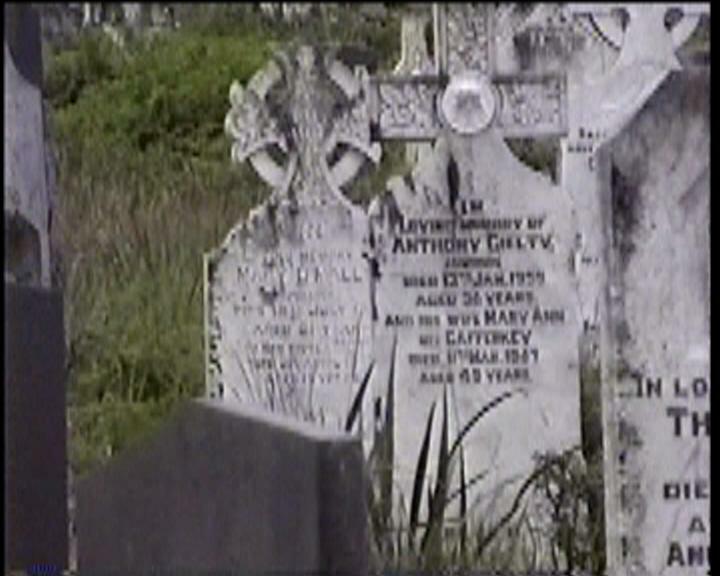 In Loving Memory of ANTHONY GIELTY Dooagh Died 13th Jan. 1959 aged 56 years. 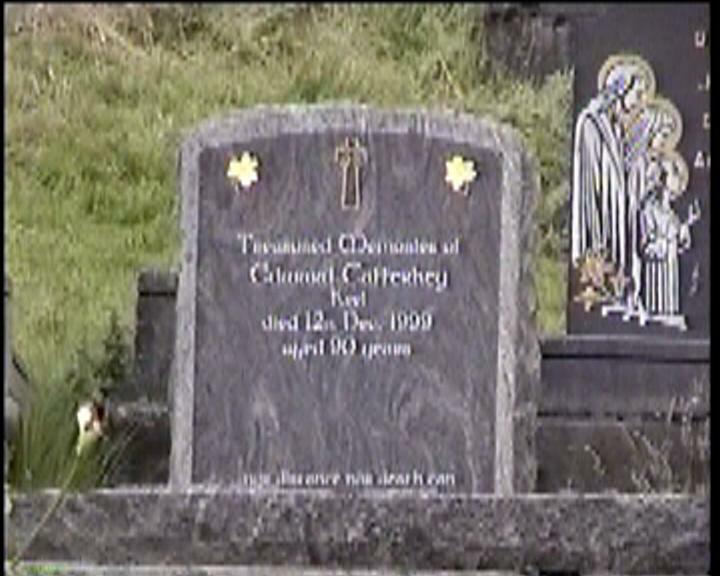 And his wife MARY ANN nee CAFFERKEY died 11th Mar. 1967 aged 45 years. 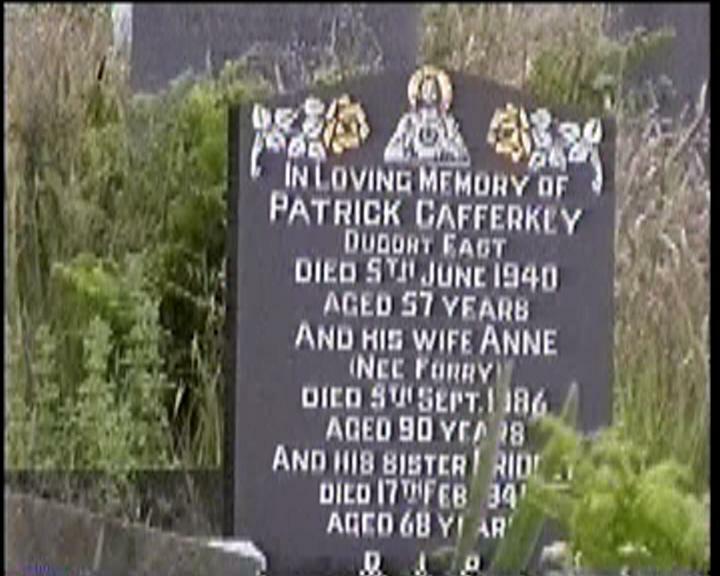 In Loving Memory of PATRICK CAFFERKEY Dooagh Died Jan. 1967 aged 34 years. And his wife BRIDGET. Mother ANNE MCNAMARA. Sister CATHERINE. And daughter ANN GIELTY. 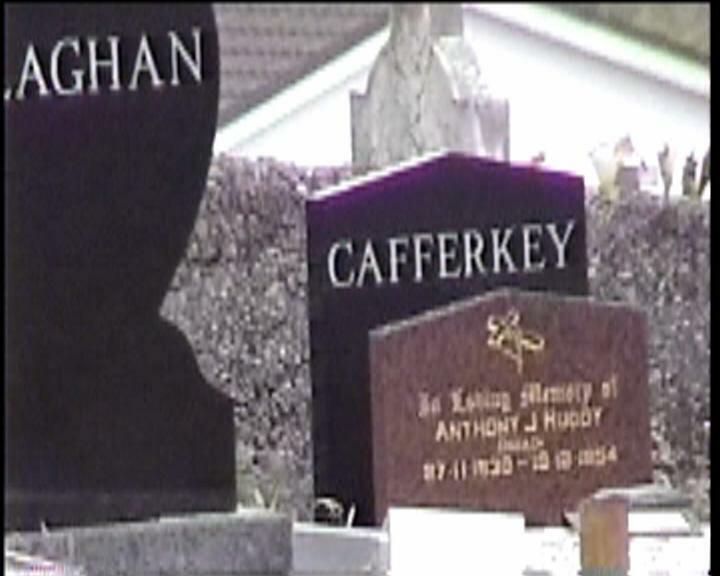 MARGARET CAFFERKEY nee MANGAN Dooagh. Died 5th Nov. 1931 aged 42 years. And her son Michael. In Loving Memory of MAUD CAFFERKEY Dooagh. Died 24th May 1978 aged 58 years. And her husband ANTHONY died 9th March 1991 aged 71 years. 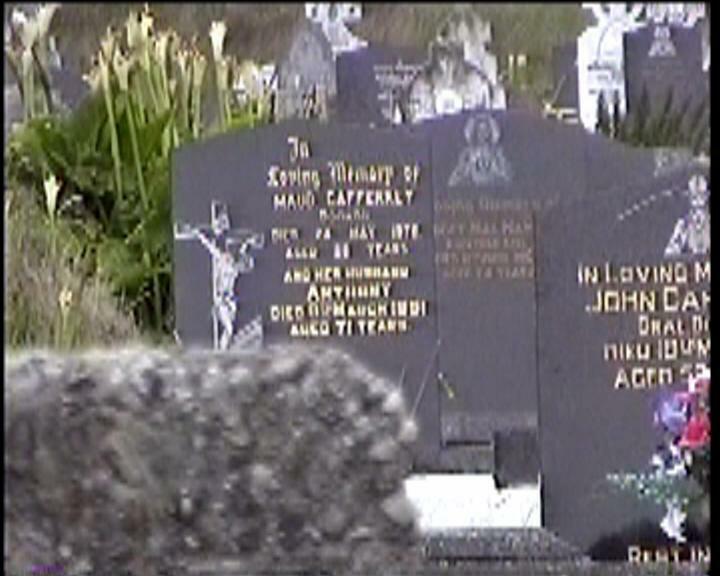 In Loving Memory of JOHN CAFFERKEY Brae, Dooagh. Died 18th March 1986 aged 52 Years. 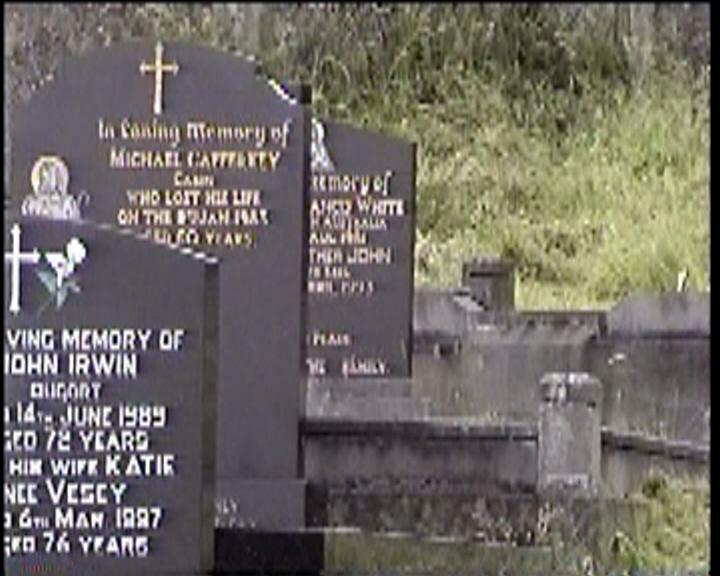 In Loving Memory of MICHAEL CAFFERKEY Cabin Who lost his life on the 9th Jan. 1983 aged 60 years. 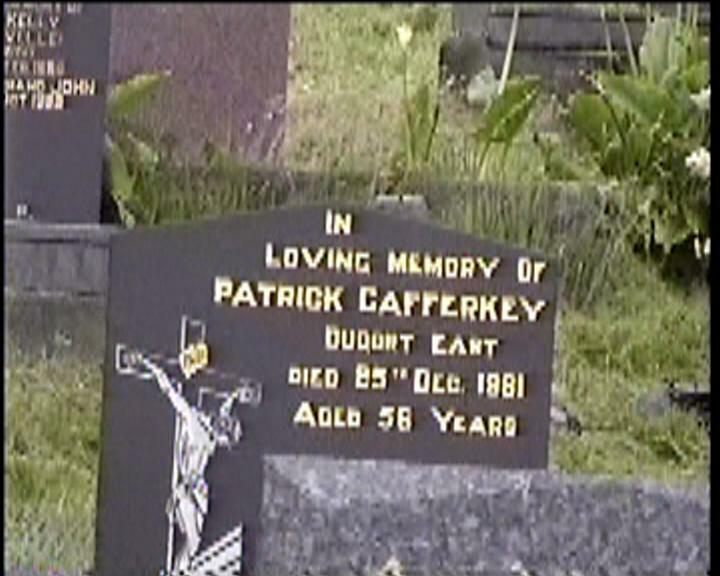 In Loving Memory of PATRICK CAFFERKEY Dugort East Died 25th Dec. 1981 aged 56 years. 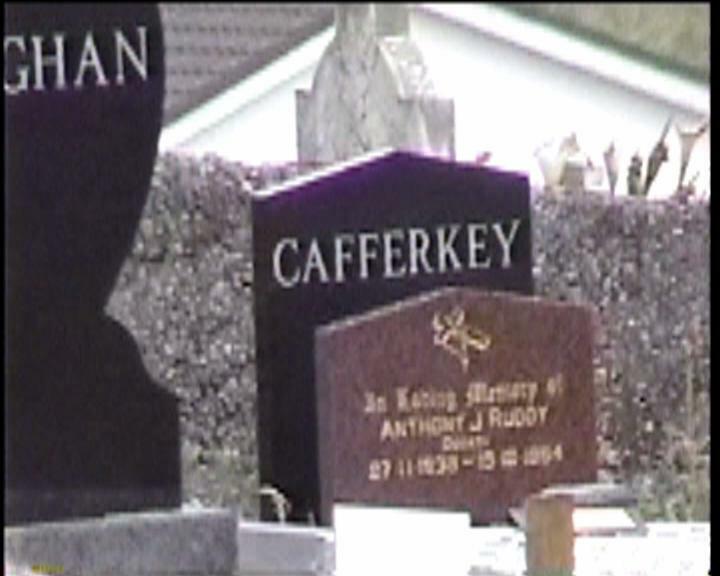 Treasured Memories of EDWARD CAFFERKEY Keel Died 12th Dec. 1999 aged 90 years. 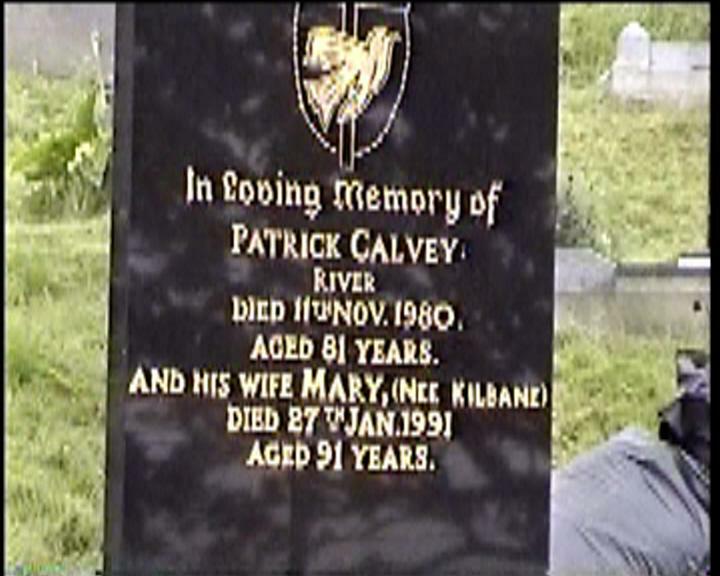 In Loving Memory of PATRICK CALVEY River Died 11th Nov. 1980. Aged 81 years. 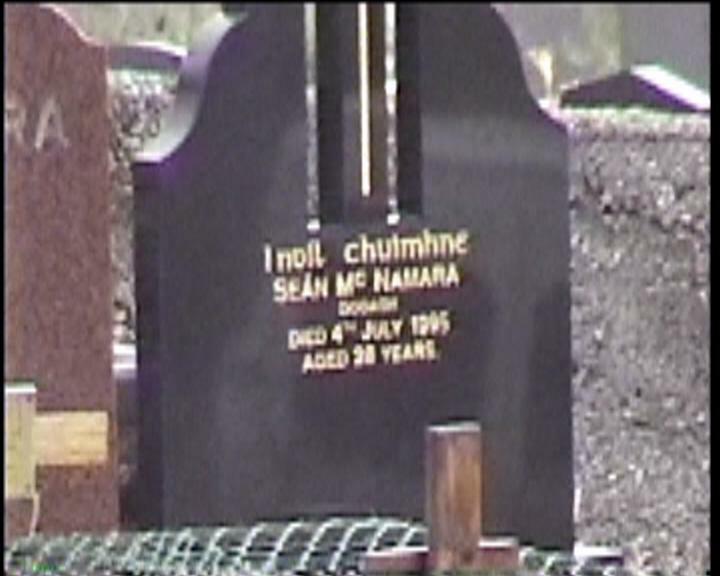 And his wife MARY (nee KILBANE) died 27th Jan. 1991 aged 91 years. 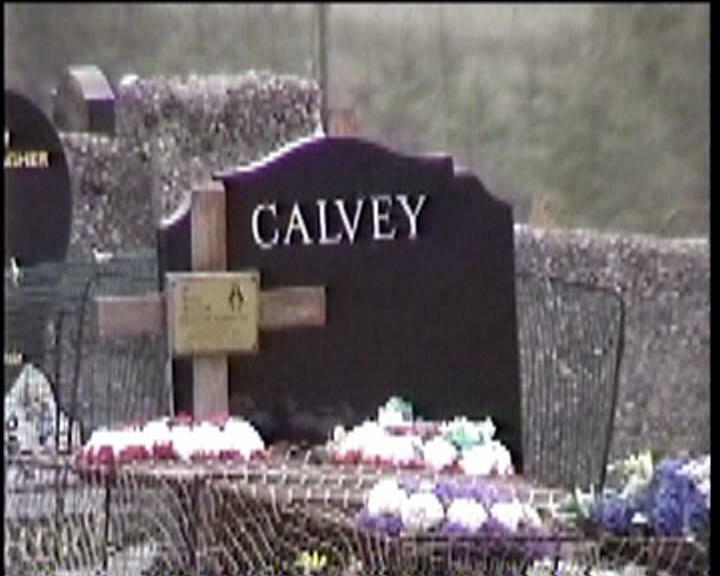 Pray for the Souls of MICHAEL CALVEY River. Died 7th Jan. 1975 aged 77 years. 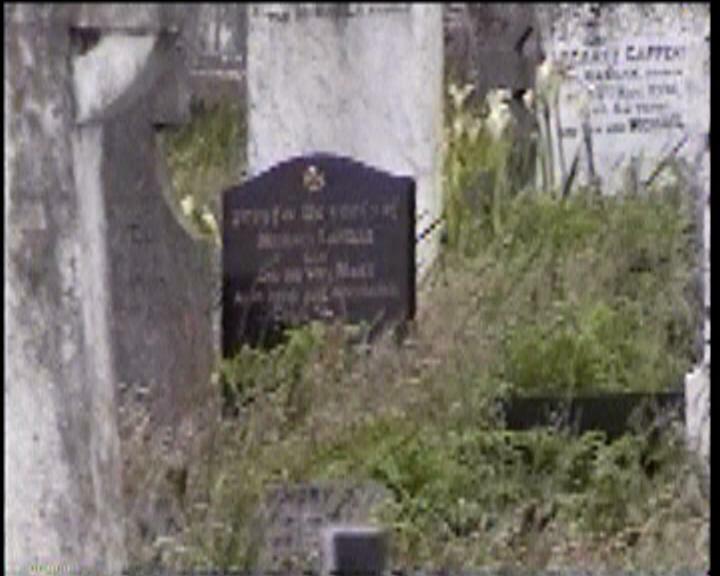 And his wife CATHERINE (nee ENGLISH) died 22nd May 1990 aged 86 years. 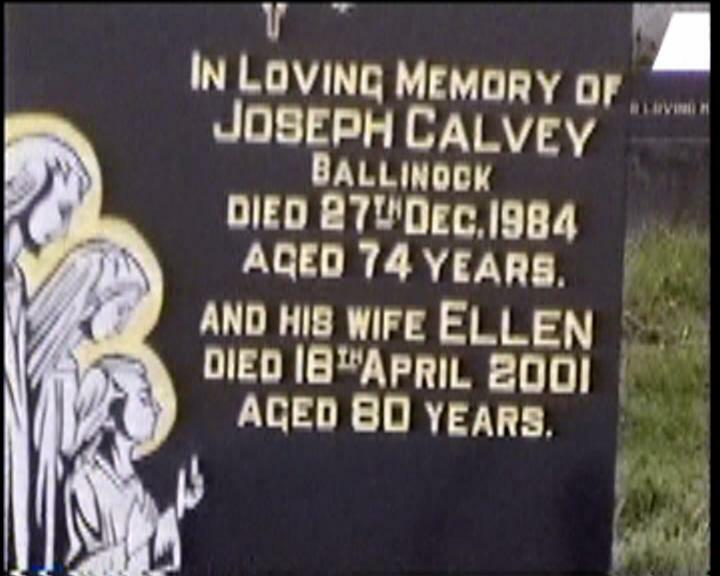 In Loving Memory of JOSEPH CALVEY Ballinock Died 27th Dec. 1984 aged 74 years. And his wife ELLEN died 18th April 2001 aged 80 years. In Loving Memory of THADY CLEARY Cabin. His son PATRICK. Also his infant children. And his mother JULIA. In Loving Memory of BRIGID CORRIGAN Cabin Died 10th Jan. 1980. RIP. Erected by her Loving Sisters, Brother, and Husband. 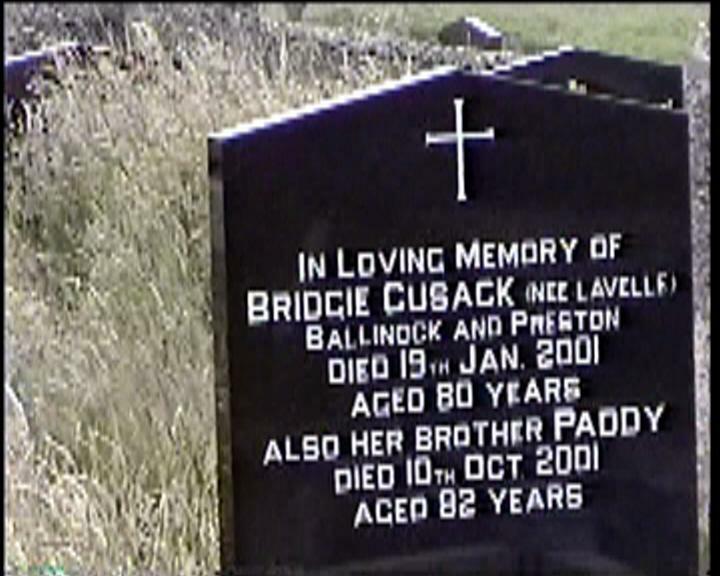 In Loving Memory of BRIDGIE CUSACK (nee LAVELLE) Ballinock and Preston. Died 19th Jan. 2001 aged 80 years. 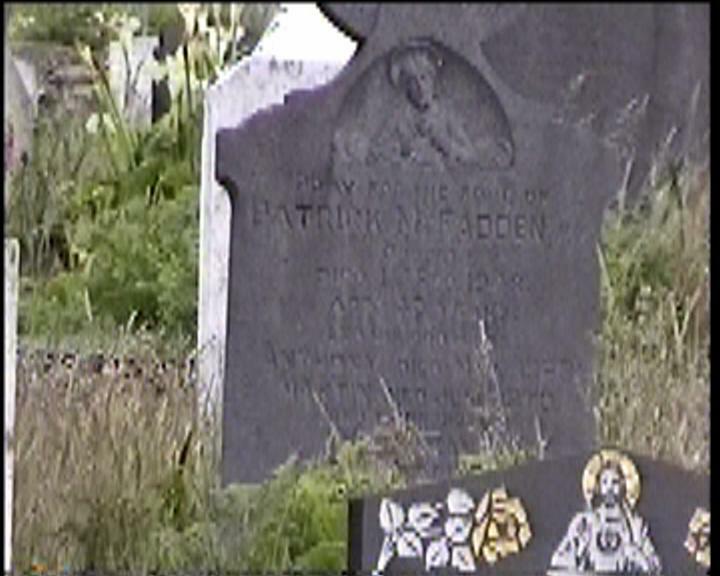 Also her brother PADDY died 10th Oct. 2001 aged 82 years. 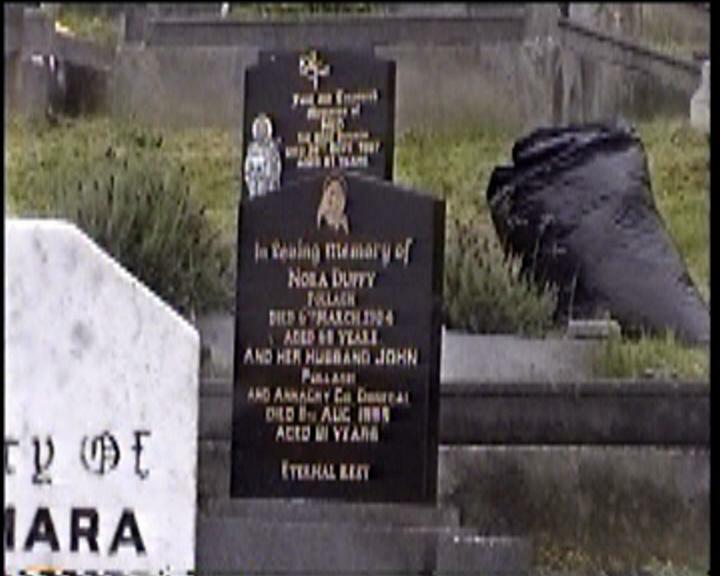 In Loving Memory of NORA DUFFY Pollagh. Died 6th March 1984 aged 68 years. 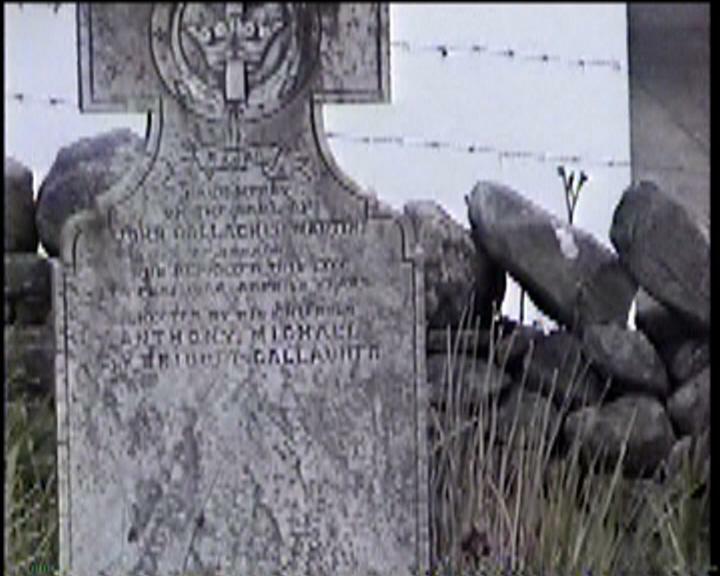 And her husband JOHN Pollagh and Annacry, Co. Donegal. Died 11th Aug. 1995 aged 81 years. Lord Have Mercy on the soul of THOMAS FADDEN died 27 Feb. 1917 aged 100 years. 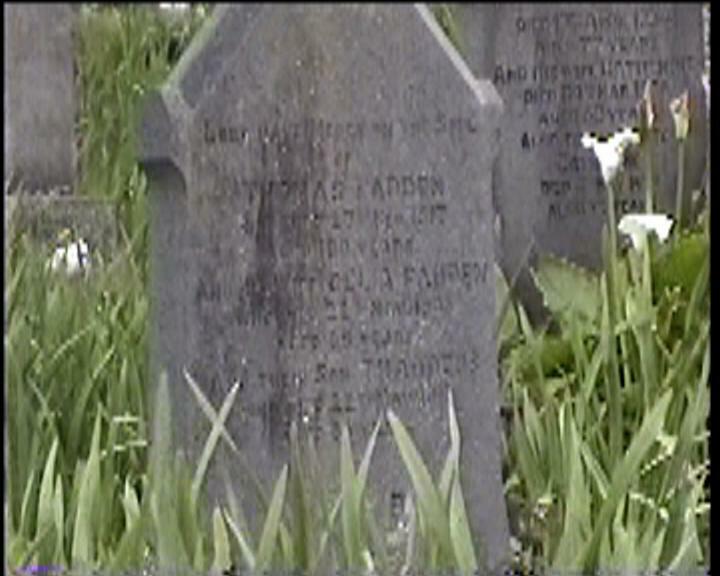 And his wife CELIA FADDEN who died 20 Nov.1906 aged 69 years. 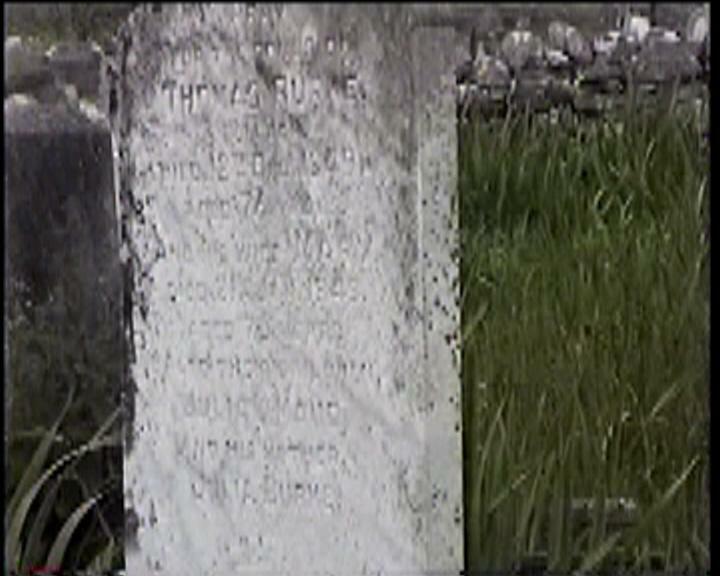 And their son THADDEUS who died 22 May 1911 aged 35 years. 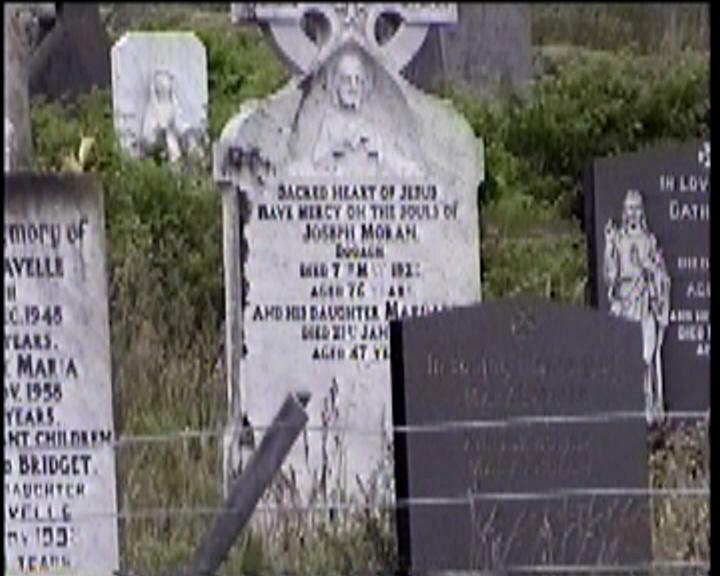 Pray for the soul of BRIDGET MCHUGH nee NOLAN Died 22nd Aug. 1898 aged 88 years. 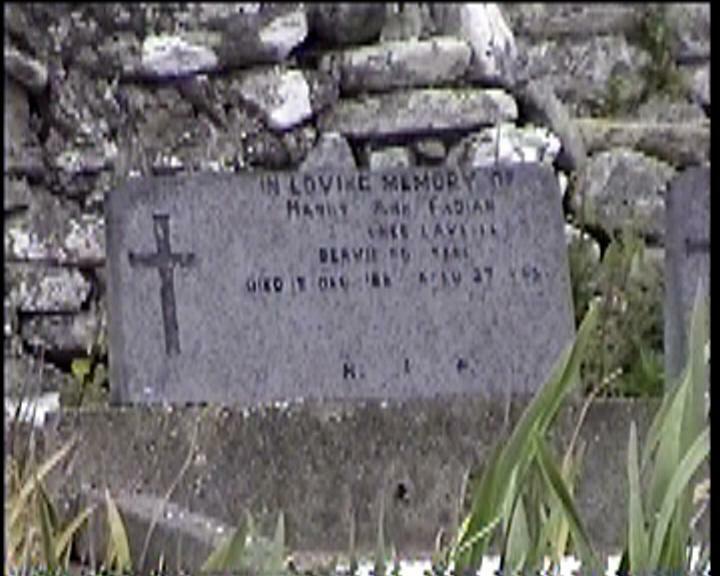 And her daughter CELIA FADIAN died 13th April 1946 aged 87 years. Erected by her daughter CELIA MCFADDEN nee MCHUGH. In Loving Memory of NANCY ANN FADIAN (nee LAVELLE) Dervie Rd. Keel. Died 12 Dec. 188? Aged 27 years. 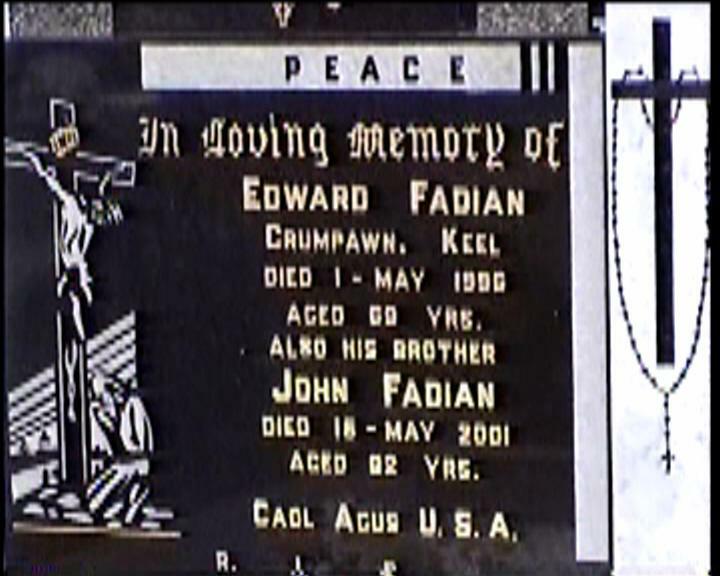 In Loving Memory of EDWARD FADIAN Crumpawn, Keel. 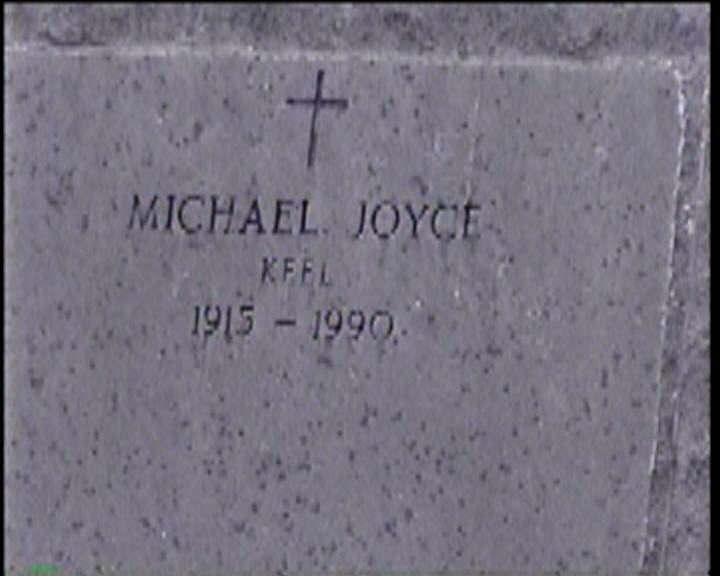 Died 1 May 1996 aged 69 years. 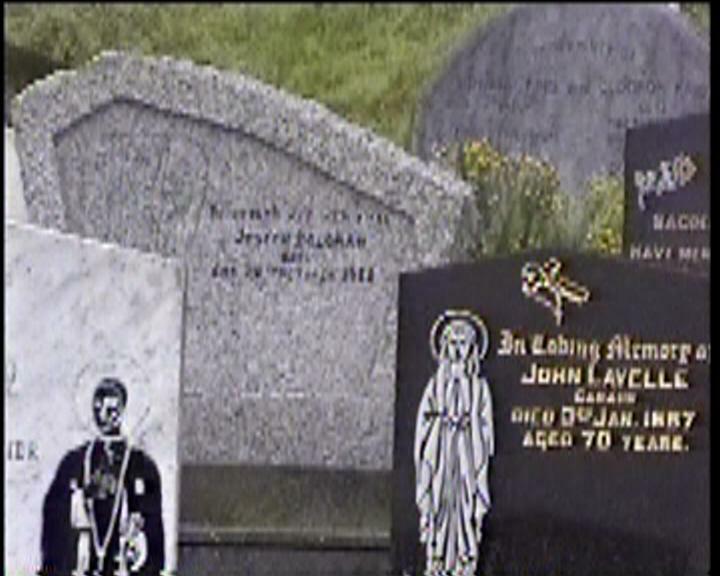 Also his brother JOHN FADIAN died 16 May 2001 aged 82 years. Caol Agus U. S. A. Erected by the Fadian Brothers. In Loving Memory of PATRICK WEIR Keel Died 5th Jan. 1970 aged 69 years. ANNIE (nee FADIAN) Died 13th Nov. 1993 aged 86 years. 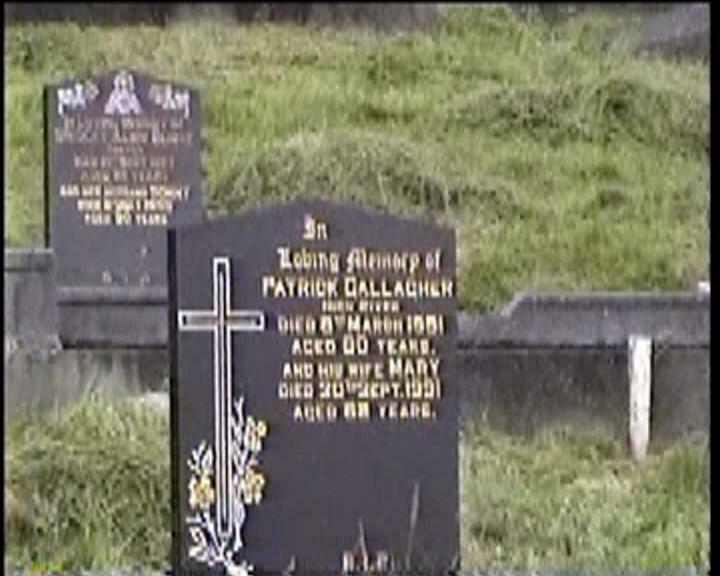 In Loving Memory of PAT GALLAGHER Ballinock Who died 1894 Aged 67 years. And his wife NANCY aged 65 years. His son NEIL and daughters MARY, ANNE, MARGARET, and CATHERINE and their niece MARY FADDIAN who died Nov.12 1912 aged 34 years. 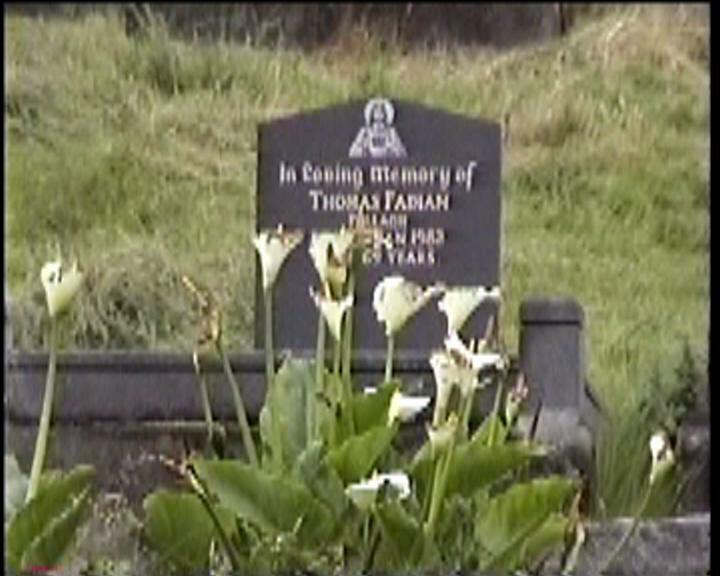 In Loving Memory of THOMAS FADIAN Pollagh Died ? Jan. 1982 aged 69 years. 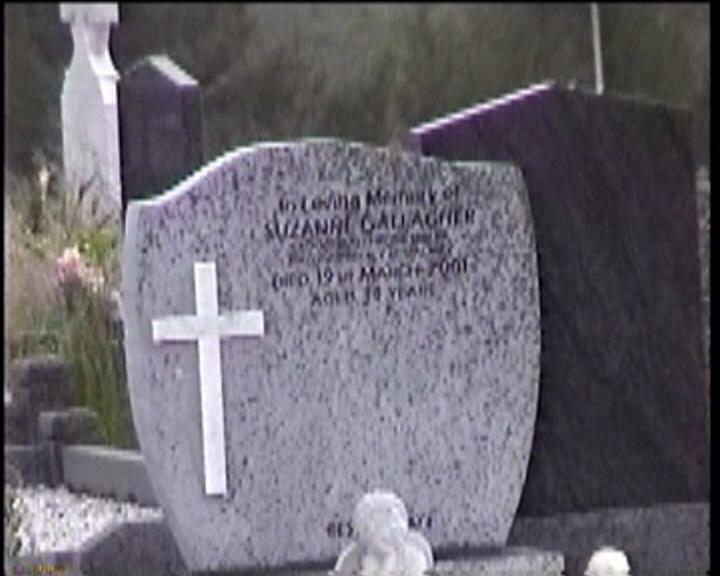 In Loving Memory of BRIDGET GALLAGHER Ballinock Died 2nd March 1990 aged 84 years. 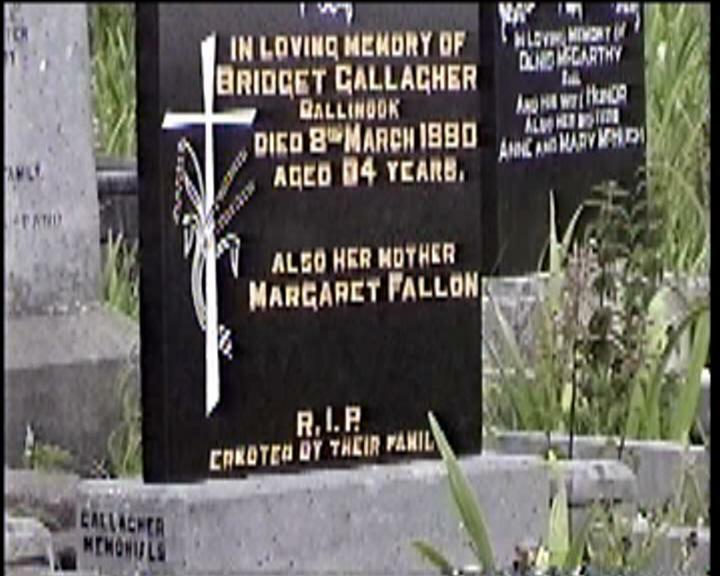 Also her mother MARGARET FALLON. 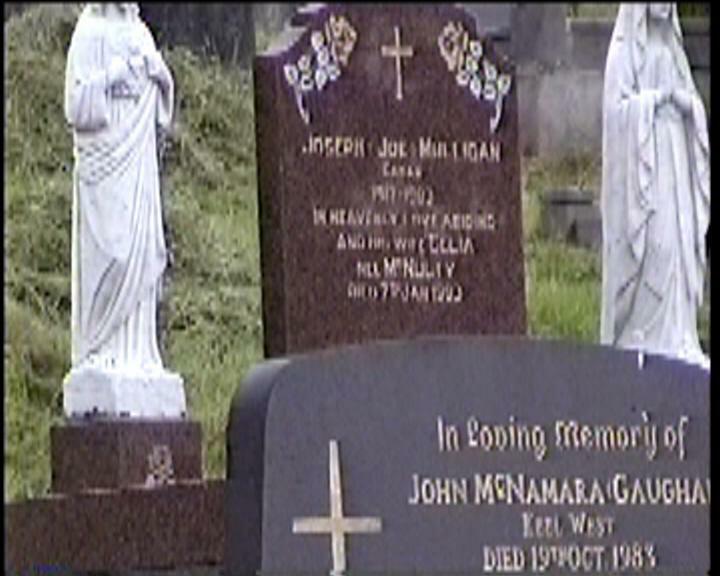 In Loving Memory of MICHAEL GALLAGHER (JAMES) Keel Died 24th March 1994 aged 80 years. 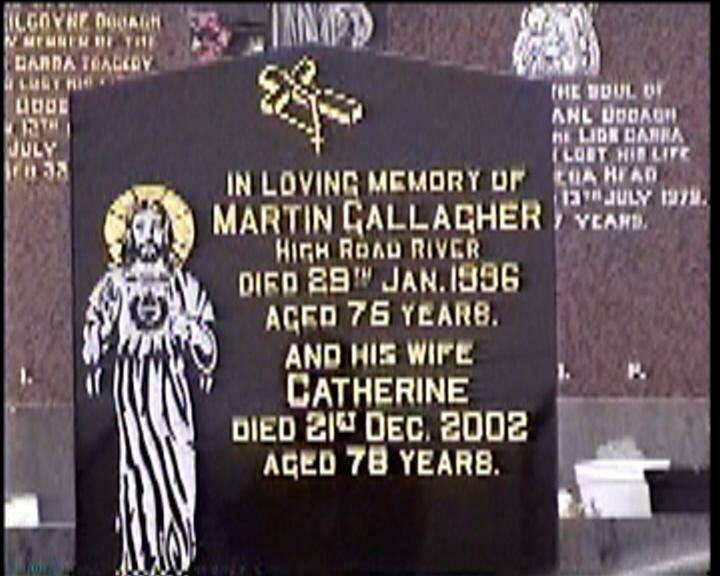 In Loving Memory of MARTIN GALLAGHER High Road River Died 29th Jan. 1996 aged 75 years. 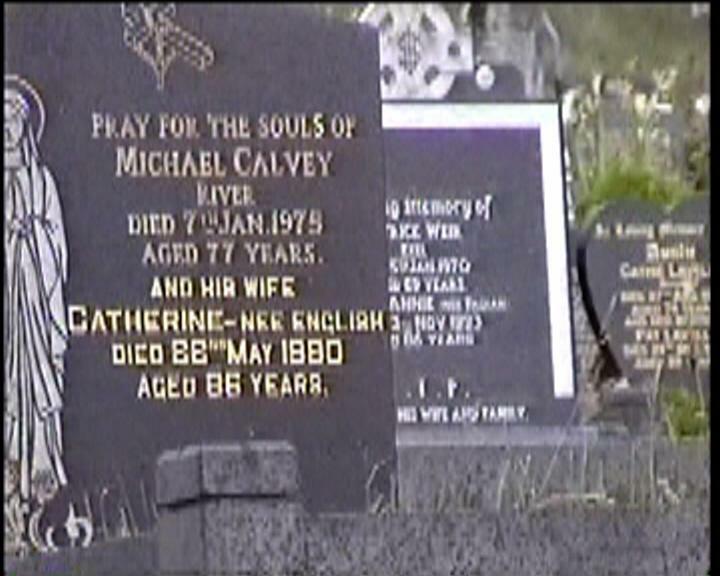 And his wife CATHERINE died 21st Dec. 2002 aged 78 years. 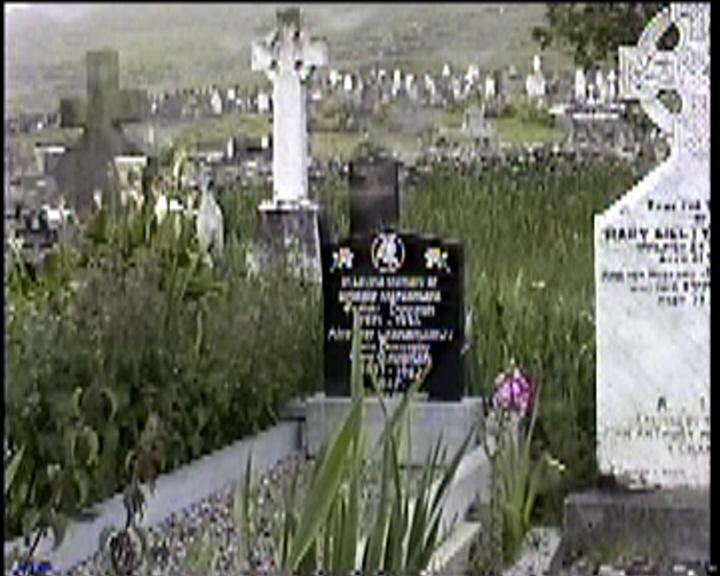 In Loving Memory of MARTIN GALLAGHER (OWEN) Ballinasally Died 7th April 1944 aged 77 years. In Loving Memory of FARRELL GALLAGHER River. Died 19th April 1934 aged 77 years. And his wife CATHERINE who died 24th Mar. 1935 Aged 63 years. 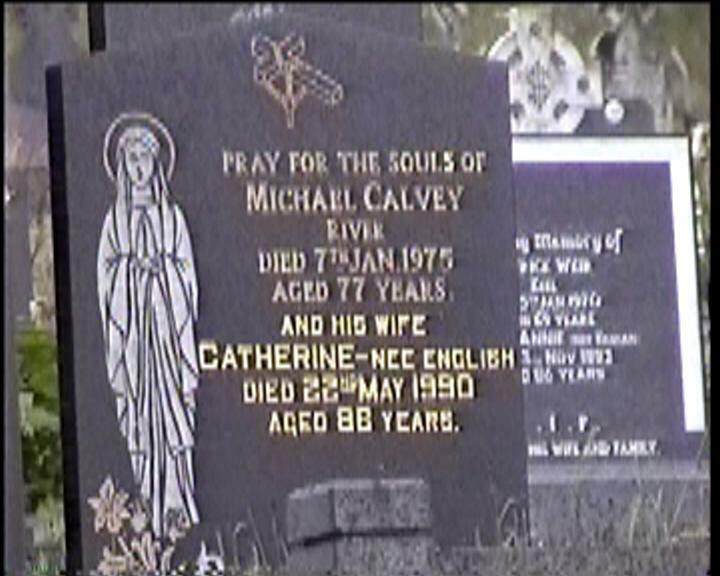 And his daughter CATHERINE died 4th May 1977 aged 74 years. 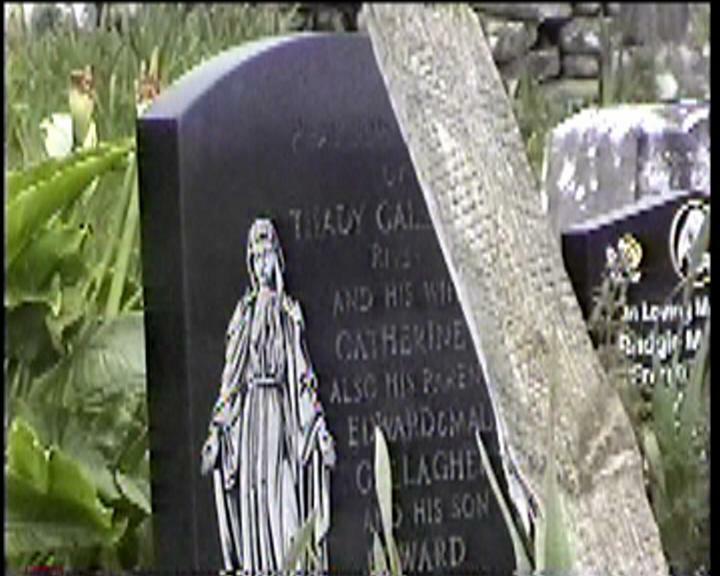 Pray for the souls of THADY GALLAGHER River and his wife CATHERINE also his parents EDWARD & MAUDE GALLAGHER and his son EDWARD. 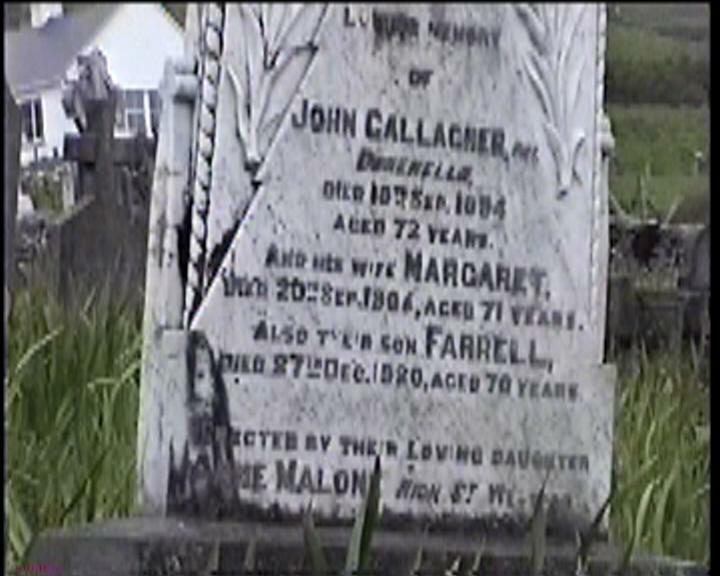 In Loving Memory of JOHN GALLAGHER (PAT) Dukenella Died 18th Sep. 1894 aged 72 years. 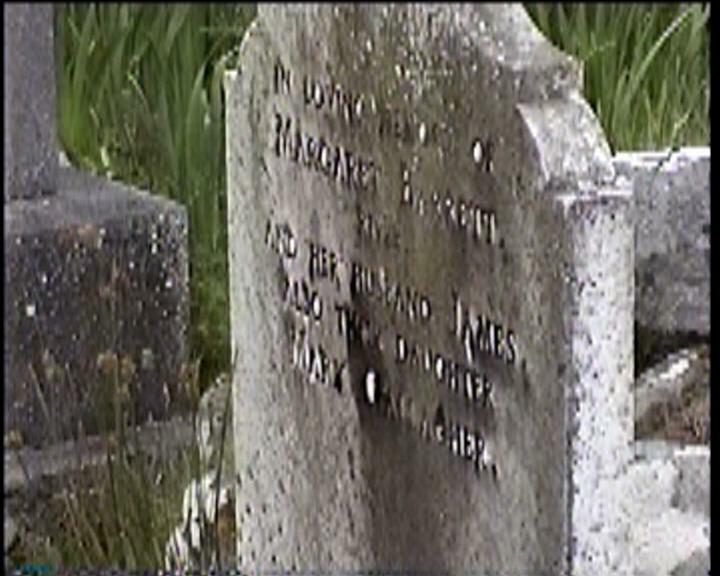 And his wife MARGARET died 20th Sep. 1906 aged 71 years. Also their son FARRELL died 27th Dec. 1920 aged 70 years. Erected by their loving daughter ANNE MALONE, High St., Westport. 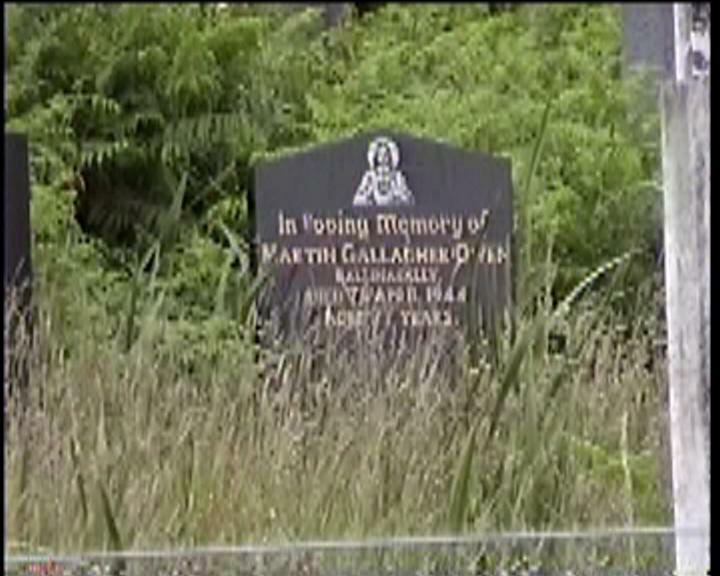 Lord Have Mercy on the Souls of JOHN GALLAGHER “MARTIN” who departed this life 1904 aged 58 years. Erected by his children ANTHONY, MICHAEL, and BRIDGET GALLAGHER. 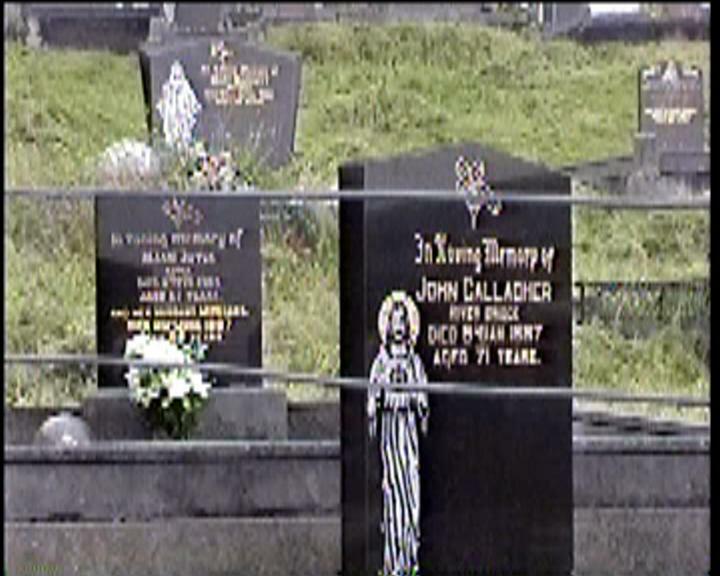 In Loving Memory of JOHN GALLAGHER River Died 9th Jan. 1987 aged 71 years. 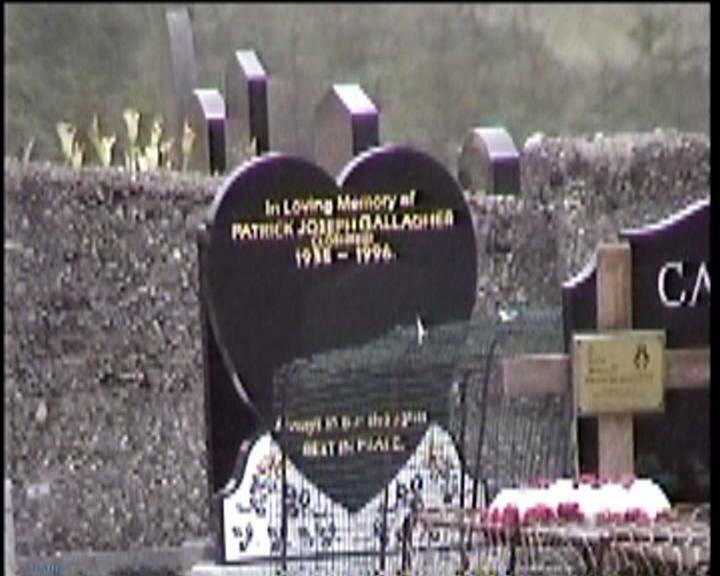 In Loving Memory of PATRICK GALLAGHER High River Died 9th March 1991 aged 80 years. 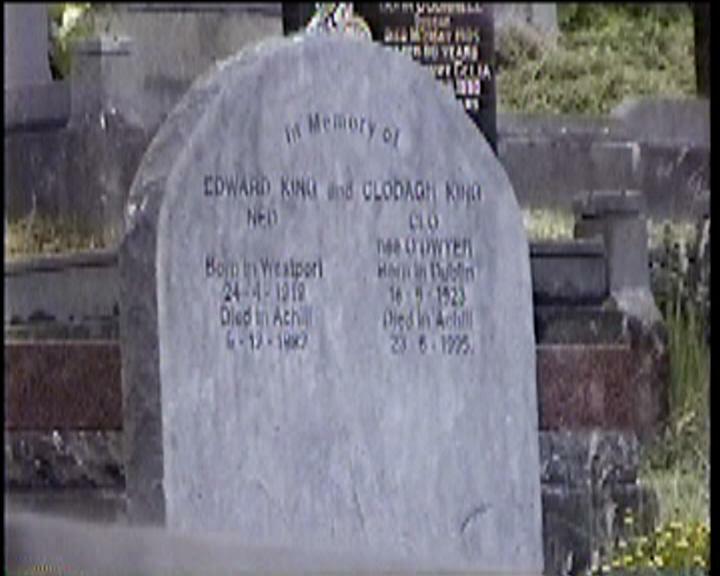 And his wife MARY died 30th Sept. 1991 aged 82 years. 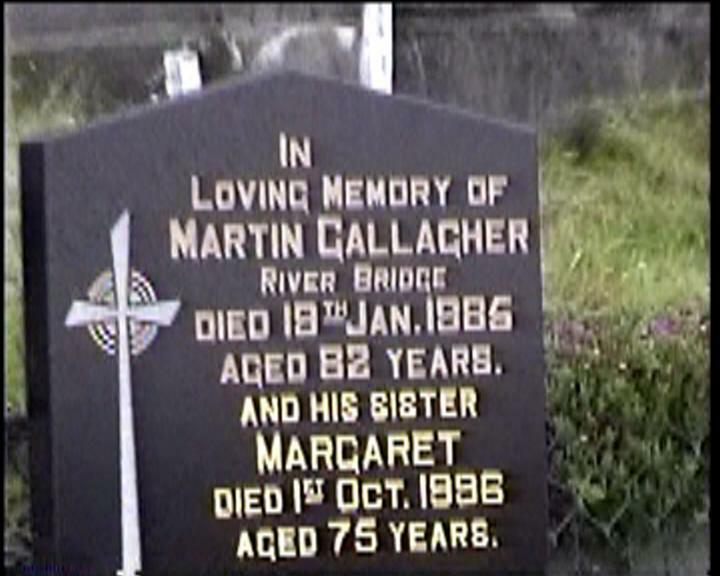 In Loving Memory of MARTIN GALLAGHER River Bridge. Died 19th Jan. 1986 aged 82 years. 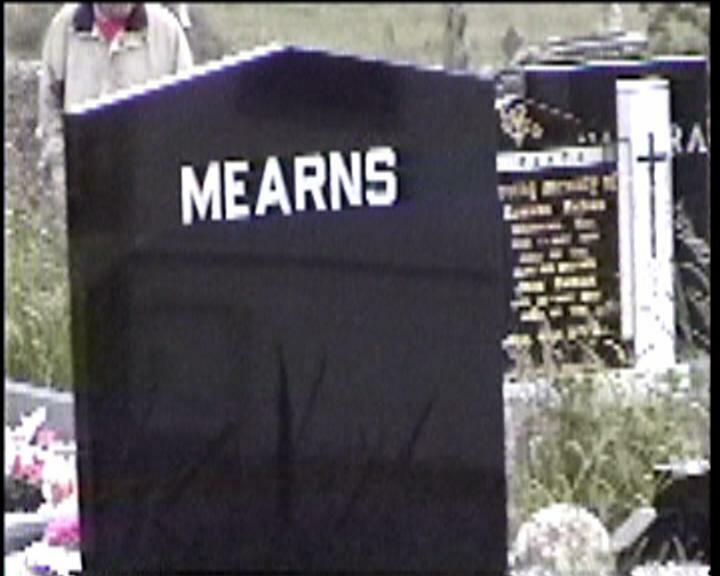 And his sister MARGARET died 1st Oct. 1996 aged 75 years. 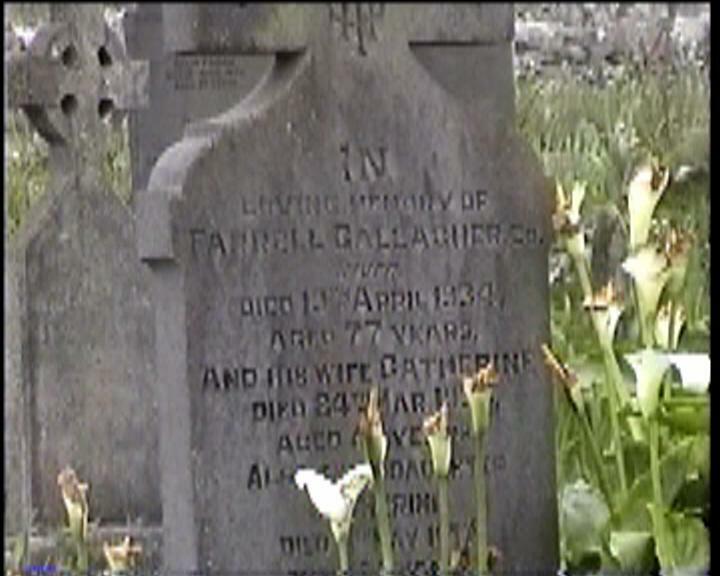 In Loving Memory of PAT GALLAGHER Ballinock Who died 1894 Aged 67 years. And his wife NANCY aged 65 years. His son NEIL and daughters MARY, ANNE, MARGARET, and CATHERINE and their niece MARY FADDIAN who died Nov. 12 1912 aged 34 years. In Loving Memory of BRIDGIE MCNAMARA (FRANK) Dooagh. 1921-1936. Also her Grandmother KATE DONNELLY (nee GAUGHAN) 1837-1952. 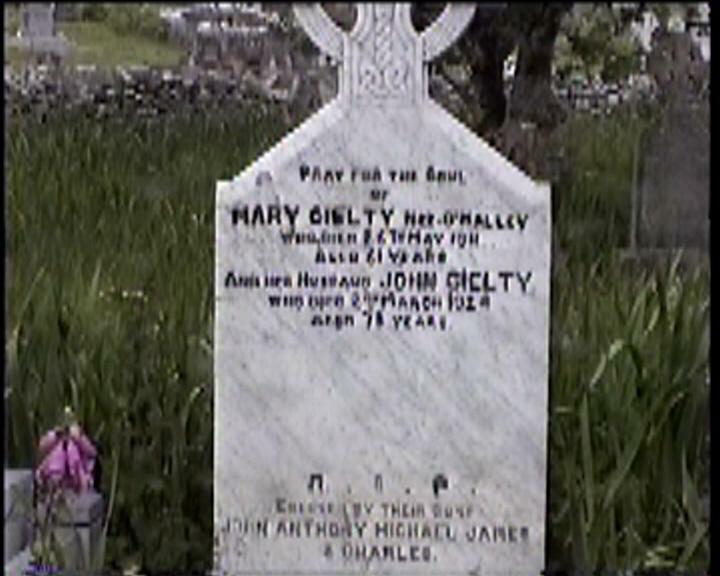 Pray for the soul of MARY GIELTY nee O’MALLEY who died 26th May 1911 aged 61 years. And her husband JOHN GIELTY who died 2nd March 1924 aged 78 years. Erected by their sons JOHN, ANTHONY, MICHAEL, JAMES, and CHARLES. Pray for the souls of ANNE MCNAMARA Pollagh. Died 18th Feb. 1919 aged 33 years. And her mother BRIDGET MCNAMARA nee GIELTY Died 23 Feb. 1893 aged 35 years. 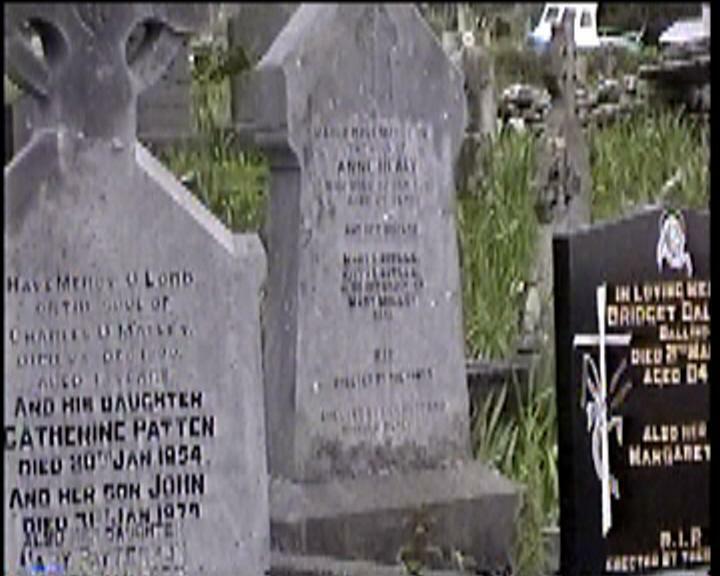 Also her uncle JAMES GIELTY Dooagh died 15th Dec. 1894. Erected by her sister MARY U.S.A. 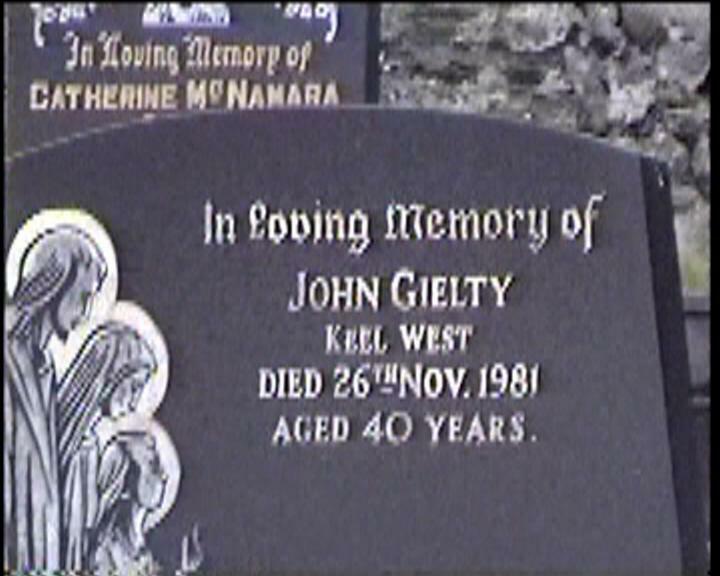 In Loving Memory of JOHN GIELTY Keel West. Died 26th Nov. 1981 aged 40 years. 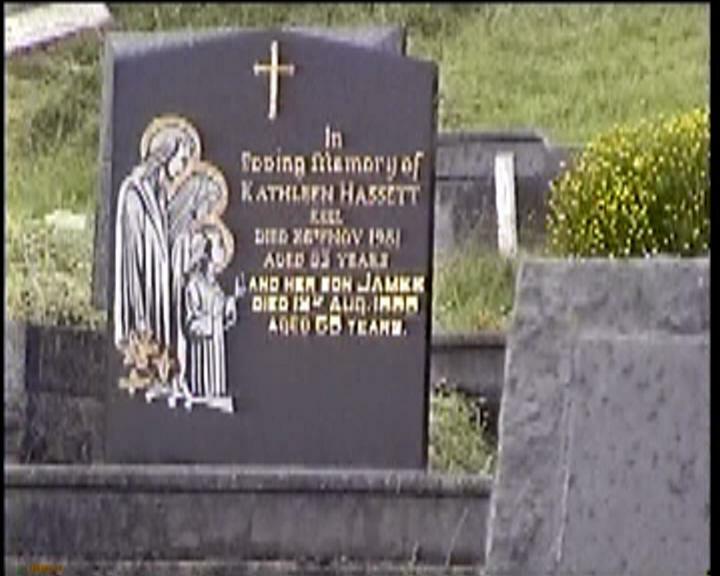 In Loving Memory of KATHLEEN HASSETT Keel Died 26th Nov. 1981 aged 83 years. 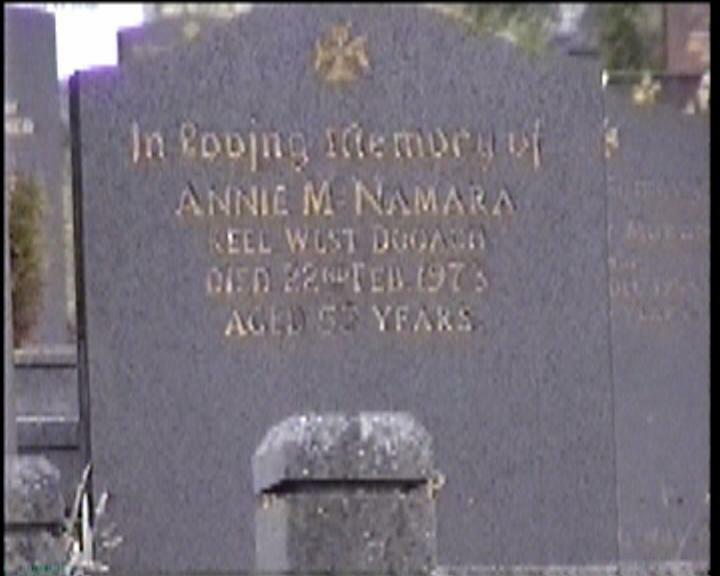 And her son JAMES died 13th Aug. 1998 aged 69 years. 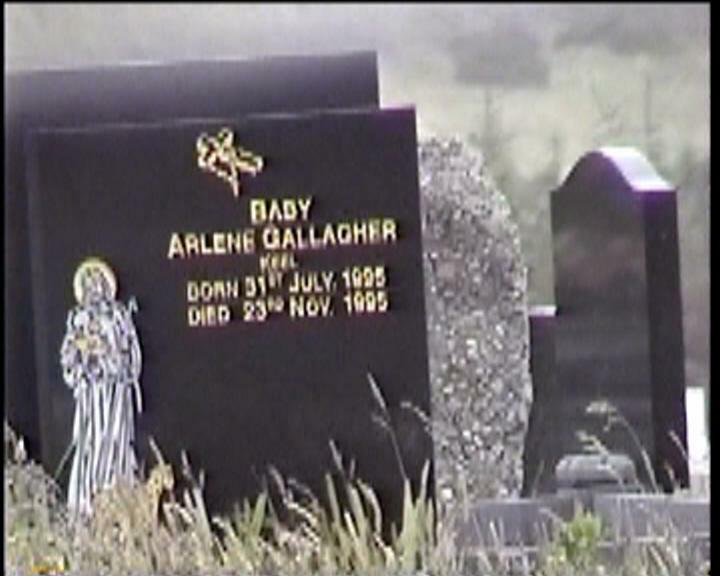 O Lord Have Mercy on the Soul of ANNE HEALY who died 10th Jan. 1888 Aged 27 years. 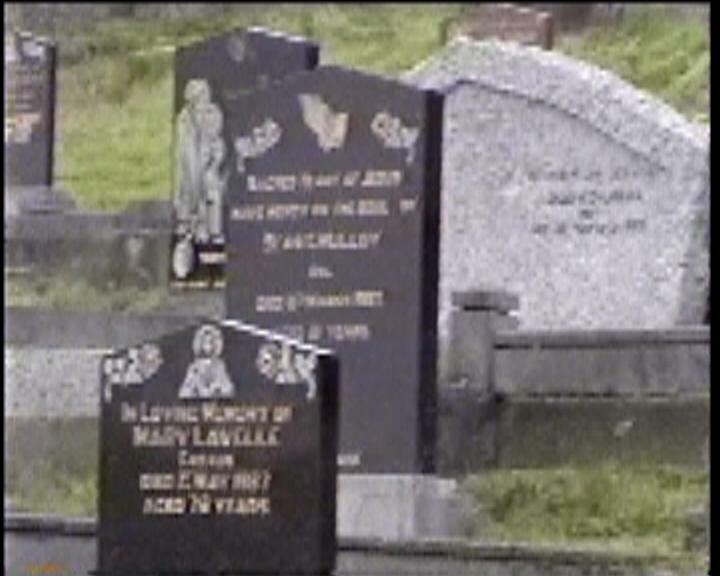 And her sisters MARY LAVELLE, KITTY LAVELLE, also her daughter MARY MOLLOY Keel. Erected by her husband WILLIAM HEALY. 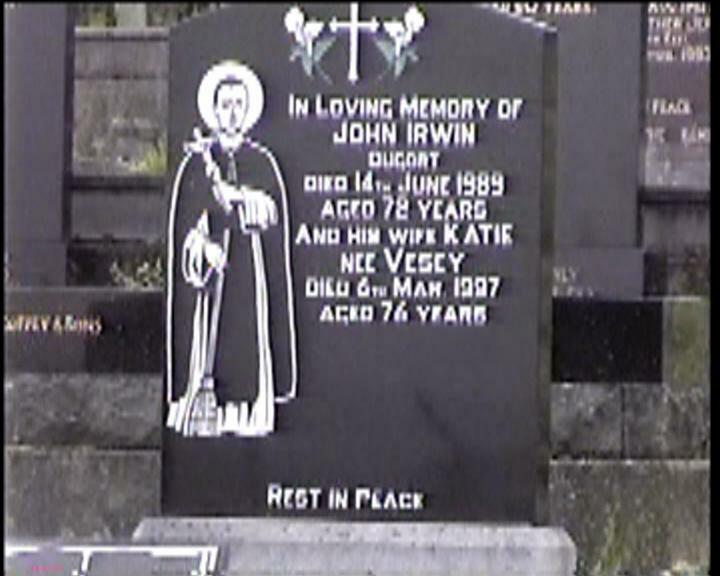 In Loving Memory of JOHN IRWIN Dugort Died 14th June 1989 aged 72 years. And his wife KATIE nee VESEY died 6th Mar. 1997 aged 76 years. 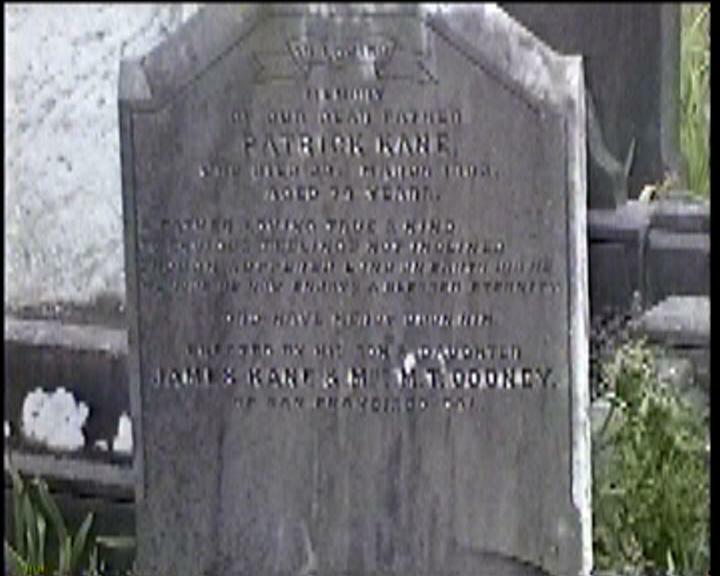 In Loving Memory of our Dear Father PATRICK KANE who died 29th March 1903 aged 74 years. “A father loving true and kind, To envious feelings not inclined. Though suffered long on earth did he, we hope he now enjoys a blessed eternity.” Erected by his son and daughter JAMES KANE and Mrs. M. T. COONEY of San Francisco, Cal. 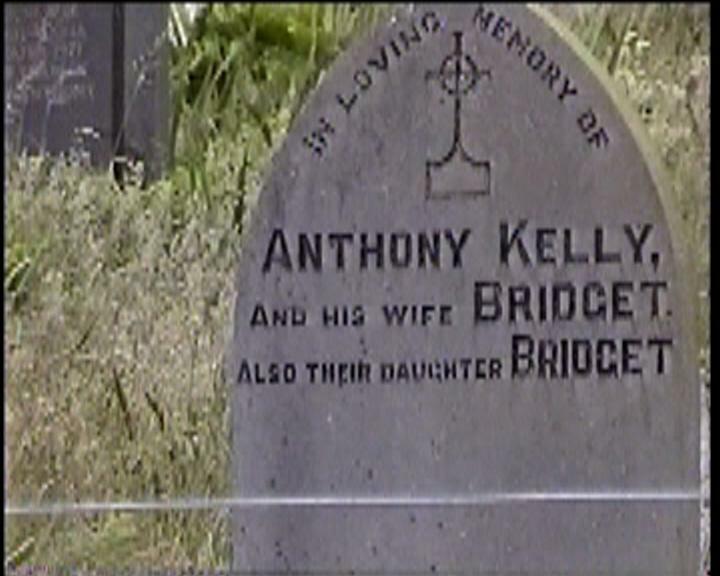 In Loving Memory of ANTHONY KELLY and his wife BRIDGET also their daughter BRIDGET. 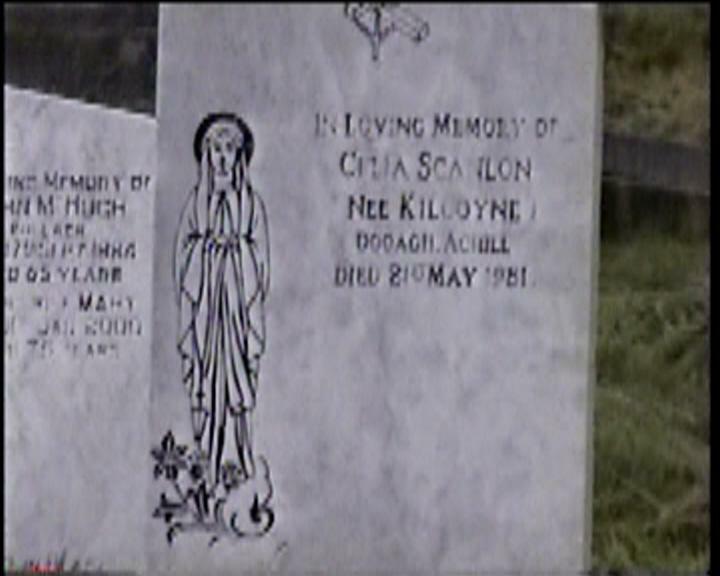 In Loving Memory of MARY KELLY (nee LAVELLE) Keel West Died 23rd Feb. 1989. 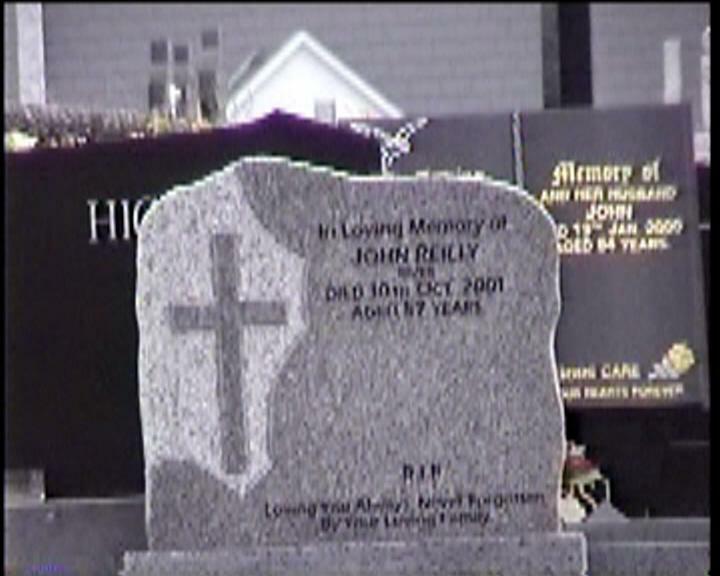 And her husband JOHN died 19th Oct. 1992. In Loving Memory of ANNIE KILBANE Dukinella? Died 16th Mar. 1982 aged 92 years. 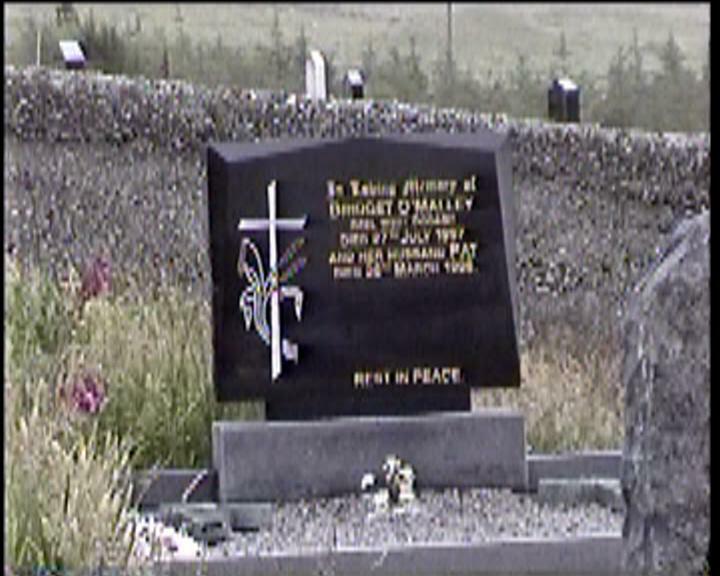 And her daughter BRIDGET O’MALLEY died 19th Dec. 1986 aged 68 years. 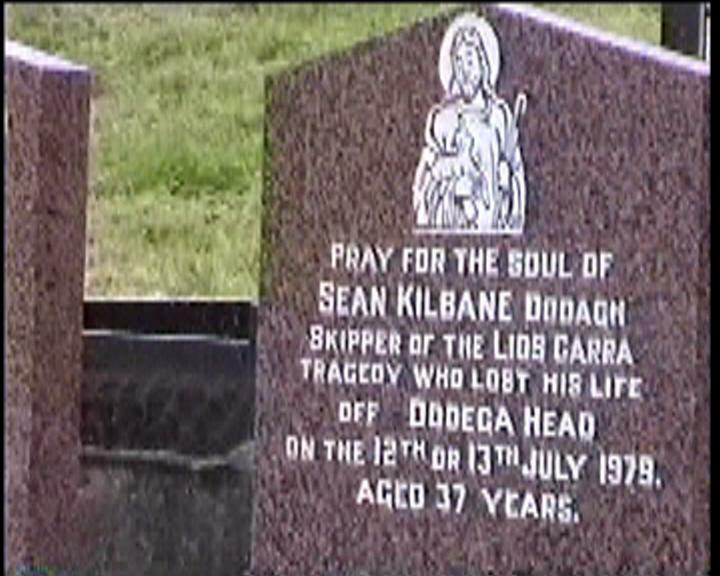 In Loving Memory of SEAN KILBANE Dooagh Skipper of the Lios Carra who lost his life of the coast of Dooega Head July 12th or 13th July 1979 aged 37 years. 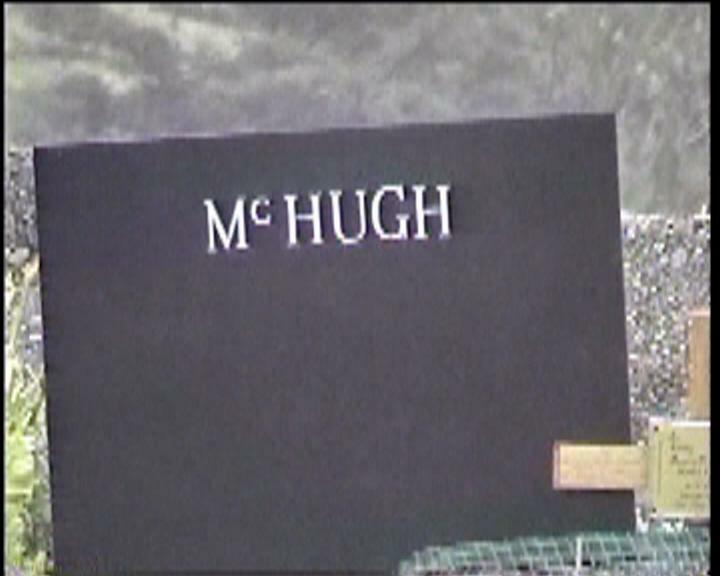 In Loving Memory of MICHAEL KILBANE Dooagh Died 21st Jan. 1987 aged 65 years. 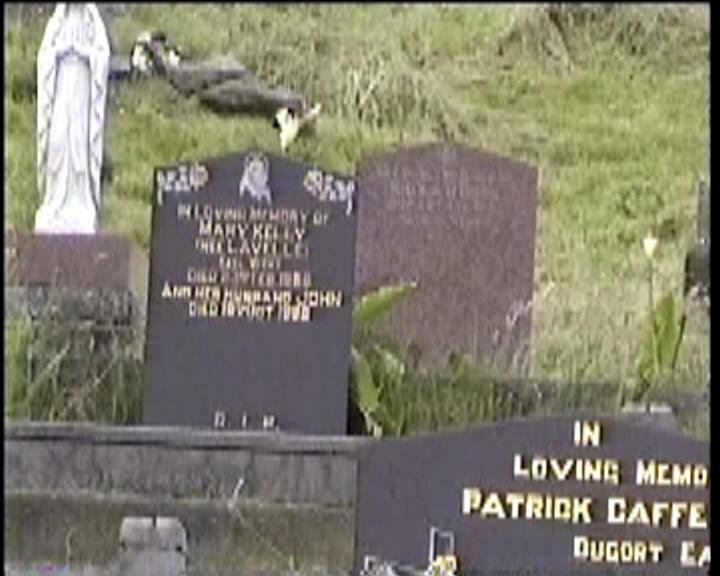 Pray for the soul of PATRICK T. KILCOYNE Dooagh Crew Member of the Lios Carra tragedy who lost his life off Dooega Head July 12th 1979 aged 32 years. In Loving Memory of CELIA SCANLON nee KILCOYNE Dooagh, Achill. Died 21st May 1981. 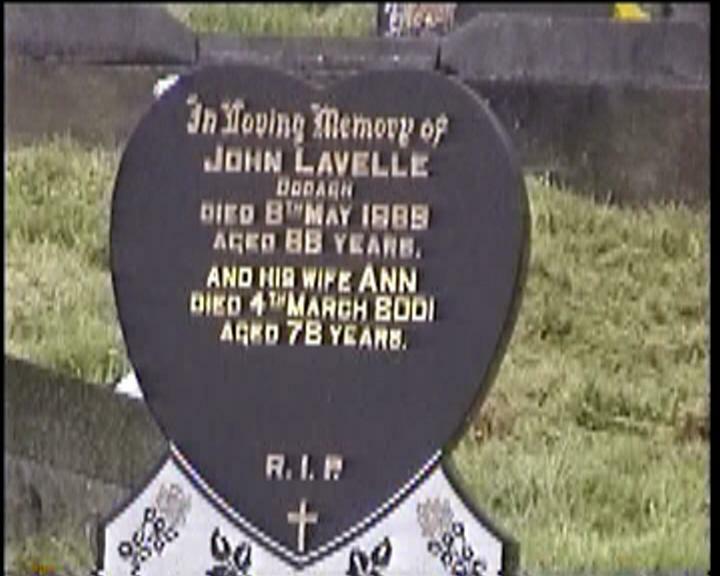 In Loving Memory of JOHN LAVELLE Dooagh Died 8th May 1989 aged 68 years. 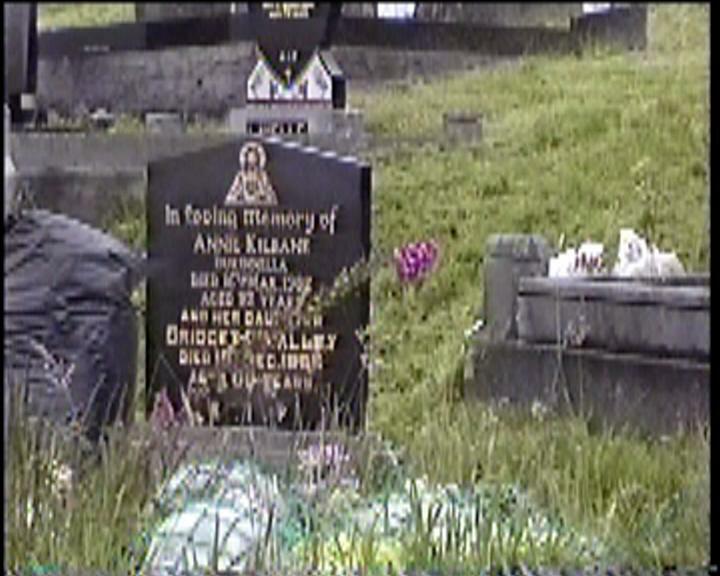 And his wife ANN died 4th March 2001 aged 72 years. 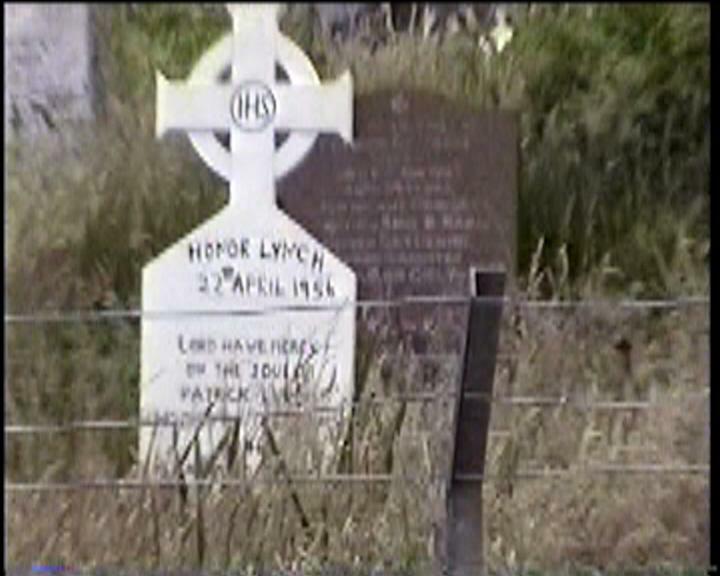 In Loving Memory of PATRICK LAVELLE Dooagh Died 24th Dec. 1948 aged 83 years. And his wife MARIA died 4th Nov. 1956 aged 79 years. 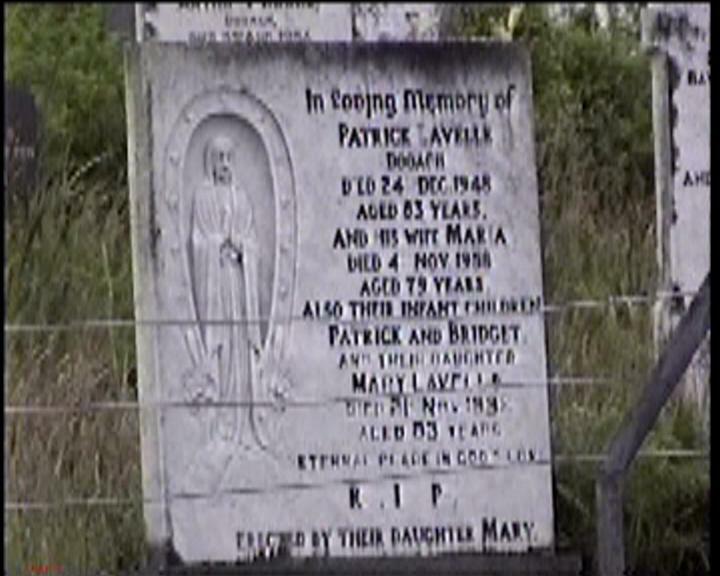 Also their infant children PATRICK and BRIDGET and their daughter MARY LAVELLE died 21st Nov. 1992 aged 83 years. Pray for the souls of MICHAEL LAVELLE Keel. And his wife MARY. Also their son ANTHONY. 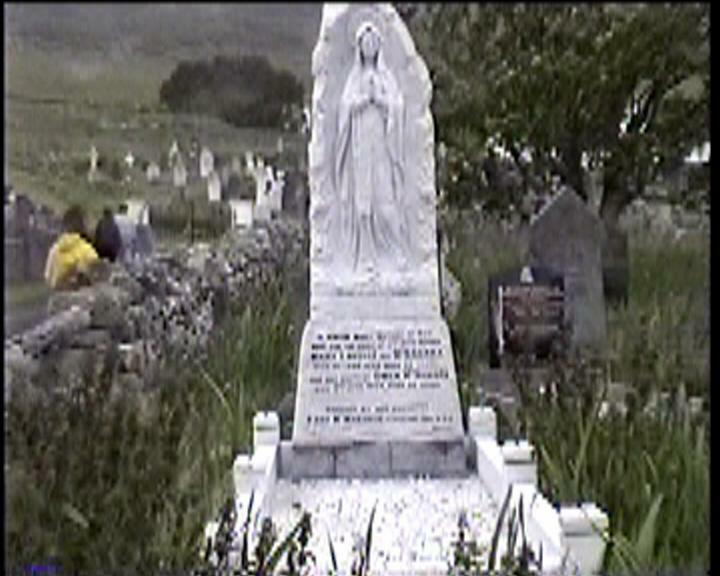 Virgin Mary Mother of God Pray for the soul of my dear mother MARY LAVELLE nee MCNAMARA died 10th Feb. 1898 Aged 22 years. 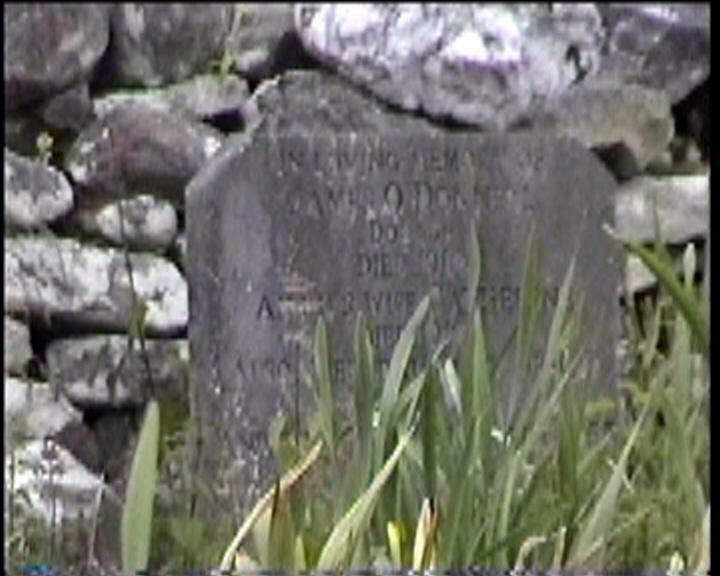 And her brother OWEN MCNAMARA died 8th June 1934 aged 34 years. Erected by her daughter MARY MCMANAMON Cleveland, Ohio U.S.A. 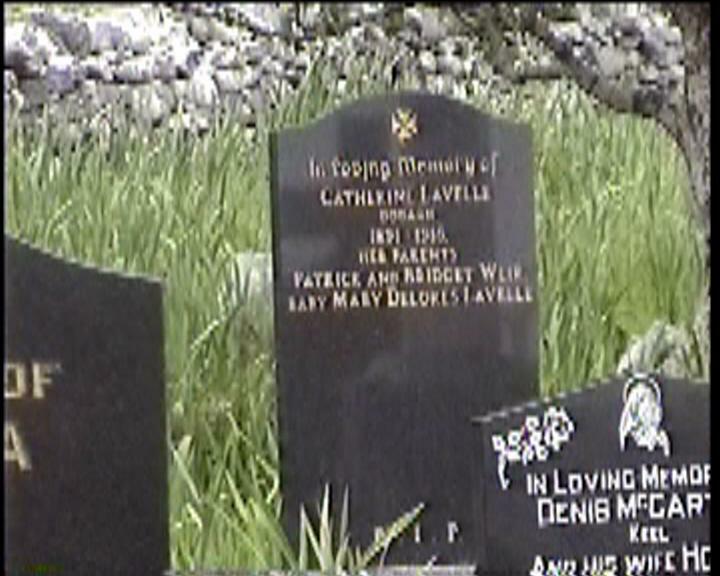 In Loving Memory of CATHERINE LAVELLE Dooagh 1891-1918 Her Parents PATRICK and BRIDGET WEIR. Baby MARY DELORES LAVELLE. 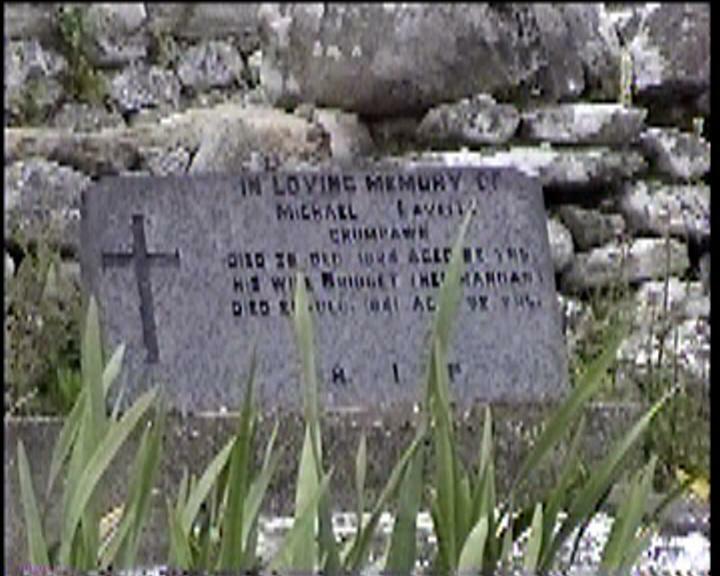 In Loving Memory of MICHAEL LAVELLE Crumpawn. Died 26th Dec. 1824 aged 82 yrs. 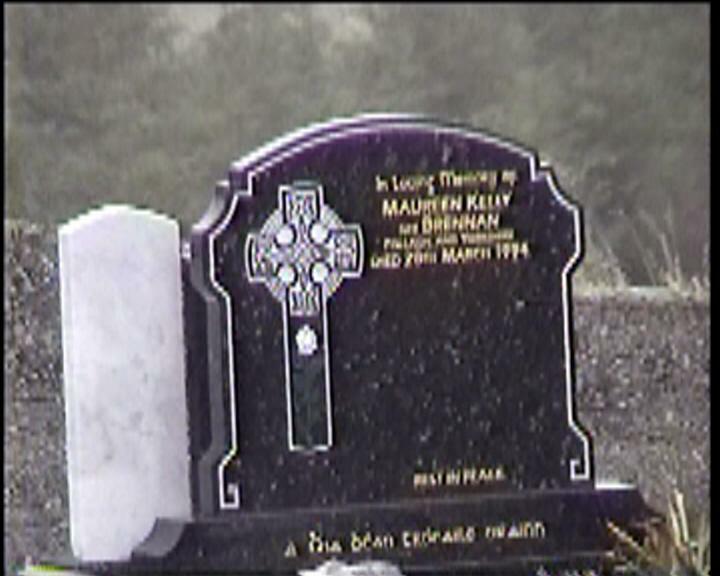 His wife BRIDGET (nee MANGAN) died 28 Dec. 1841 aged 92 years. 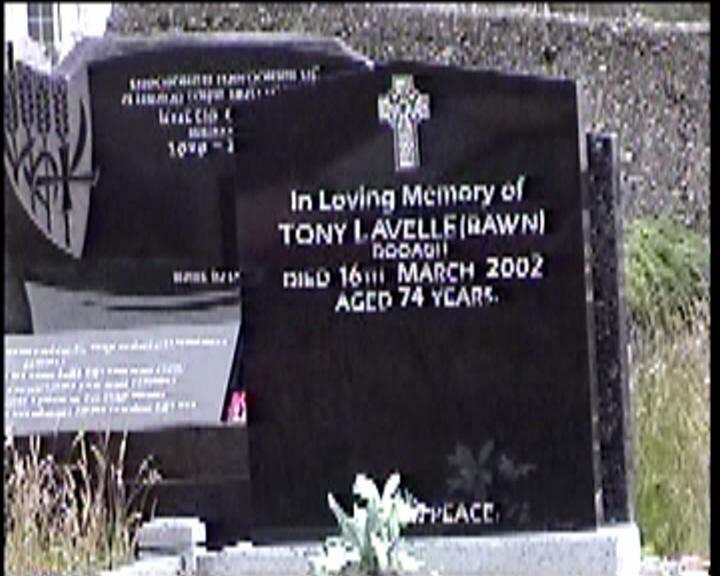 In Loving Memory of TONY LAVELLE (BAWN) Dooagh. Died 16th March 2002 aged 74 years. Sweet Jesus Have Mercy on the Soul of BRIDGIE LAVELLE “Marbrig” Keel. Died 20th April 1986 aged 58 years. 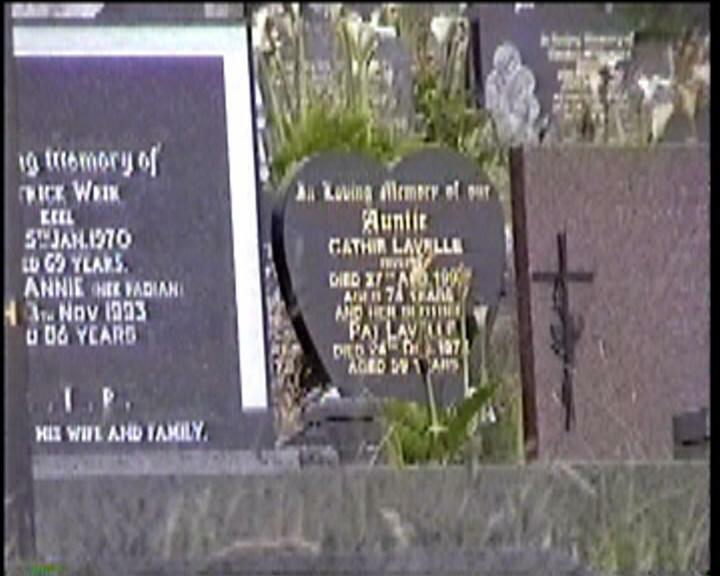 In Loving Memory of Our Auntie CATHIE LAVELLE River Died 27th Aug. 199? Aged 74 years. 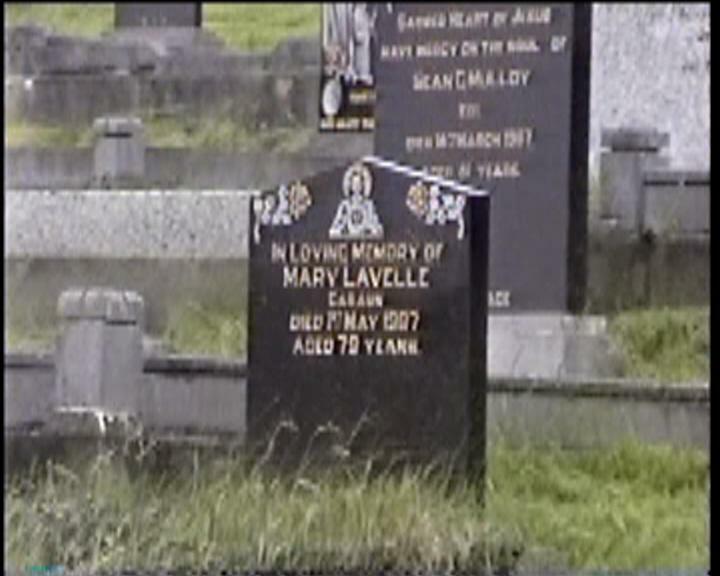 And her brother PAT LAVELLE died 24th Dec. 1972 aged 59 years. 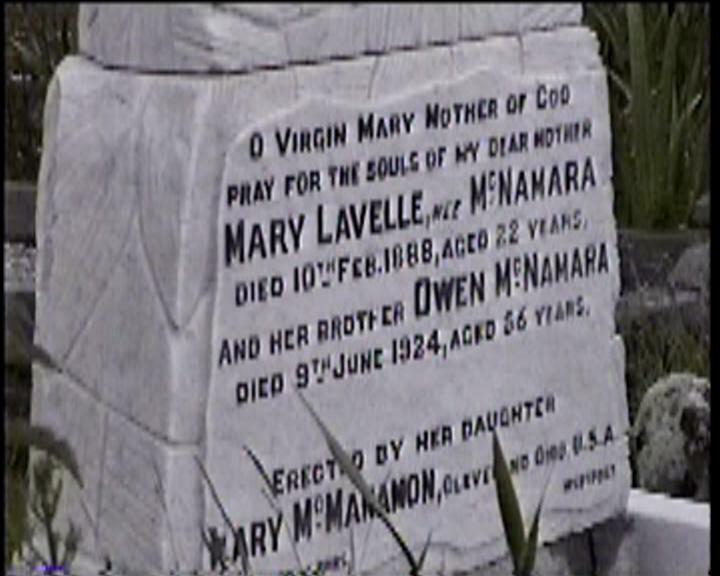 O Virgin Mary Mother of God Pray for the Souls of my Dear Mother MARY LAVELLE nee MCNAMARA. Died 10th Feb. 1888, aged 22 years. 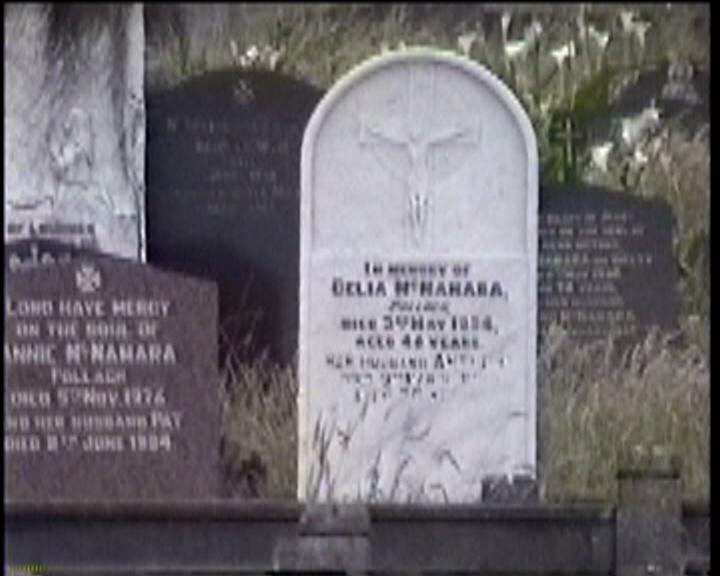 And her brother OWEN MCNAMARA died 9th June 1924, aged 56 years. 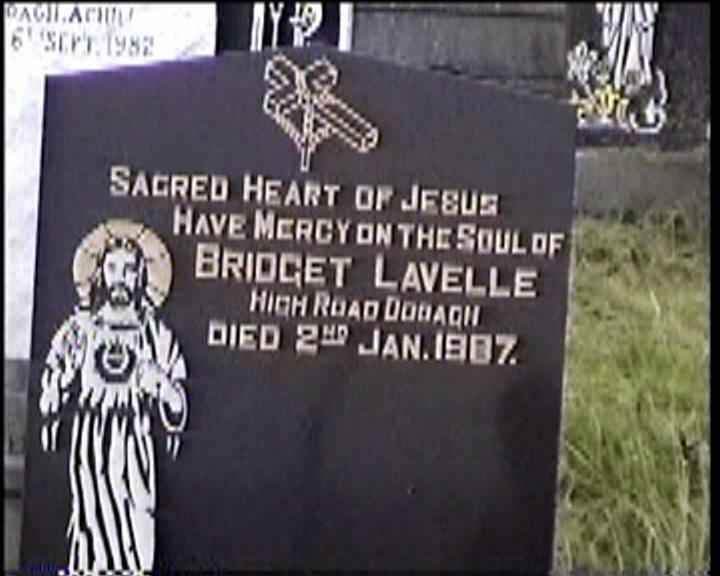 Erected by her daughter MARY MCNAMARA, Cleveland, Ohio, U.S.A.
Sacred Heart of Jesus Have Mercy on the Soul of BRIDGET LAVELLE High Road Dooagh. Died 2nd Jan. 1987. 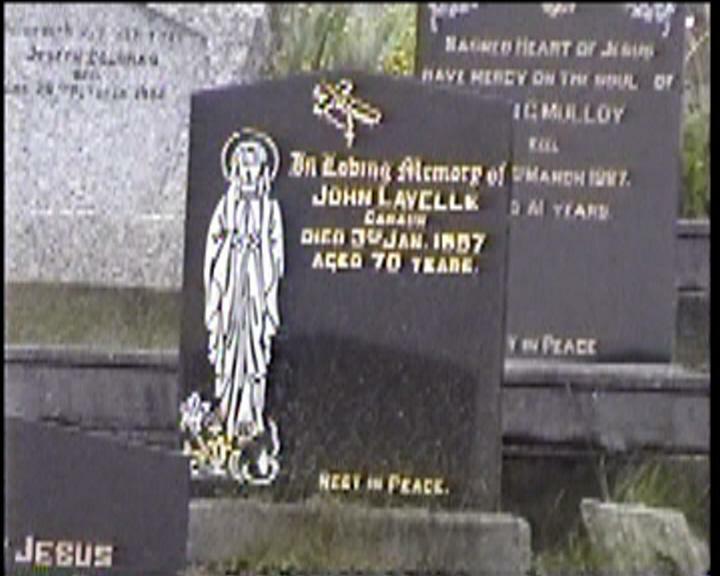 In Loving Memory of JOHN LAVELLE Cabaun Died 3rd Jan. 1987 aged 70 years. 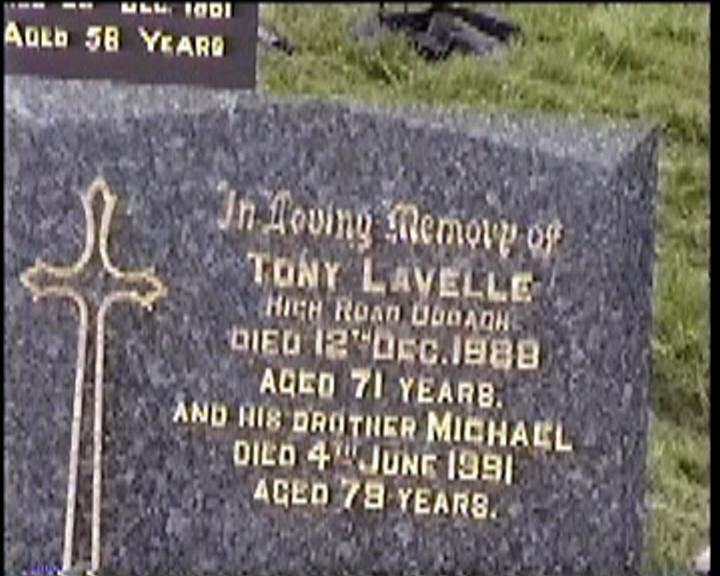 In Loving Memory of TONY LAVELLE High Road Dooagh Died 12th Dec. 1988 aged 71 years. 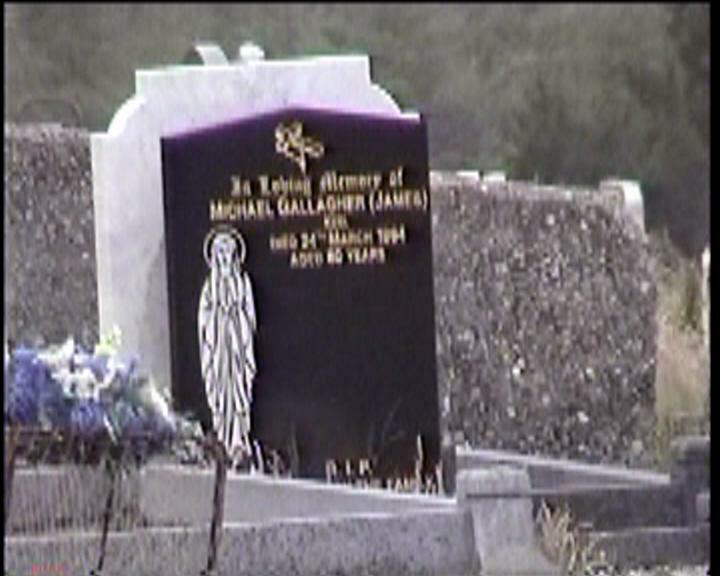 And his brother MICHAEL died 4th June 1991 aged 79 years. 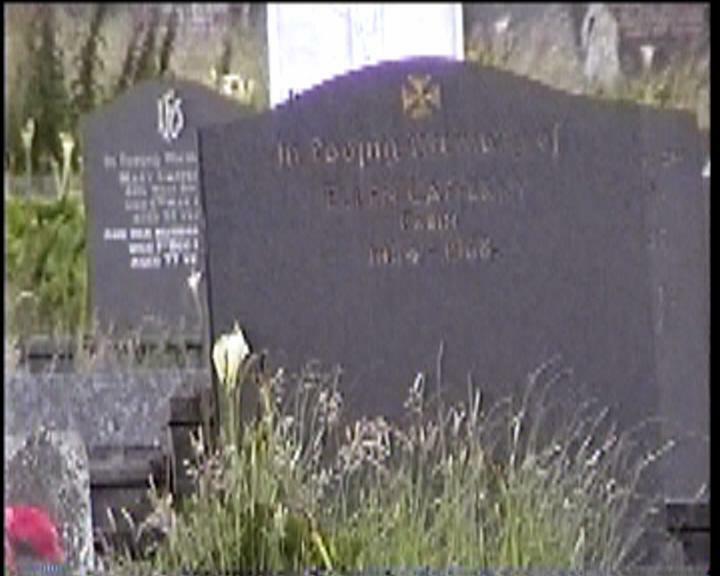 In Loving Memory of MARY LAVELLE Cabaun Died 1st May 1987 aged 79 years. 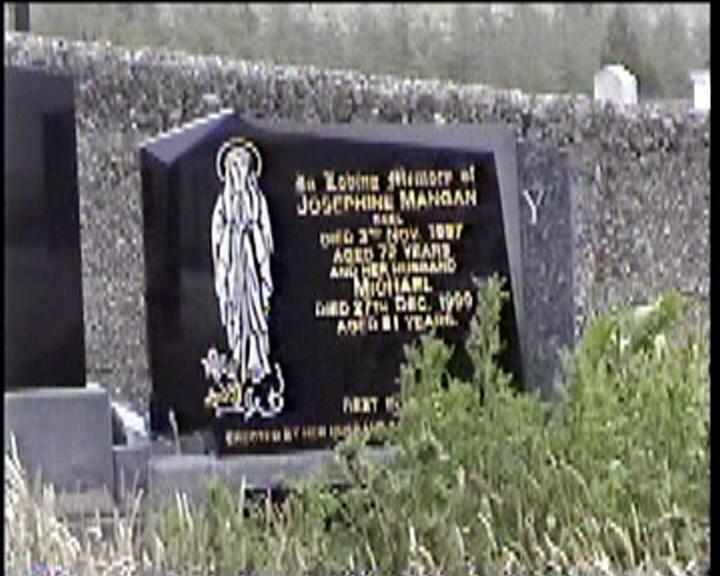 In Loving Memory of JOSEPHINE MANGAN Keel Died 3rd Nov. 1997 aged 72 years. And her husband MICHAEL died 27th Dec. 1999 aged 81 years. Pray for the souls of PATRICK MASTERSON Cabin. Died 18th Mar. 1946, and his wife BRIDGET died 25th Feb. 1917. Also their son MICHAEL died 30th Mar. 1915. 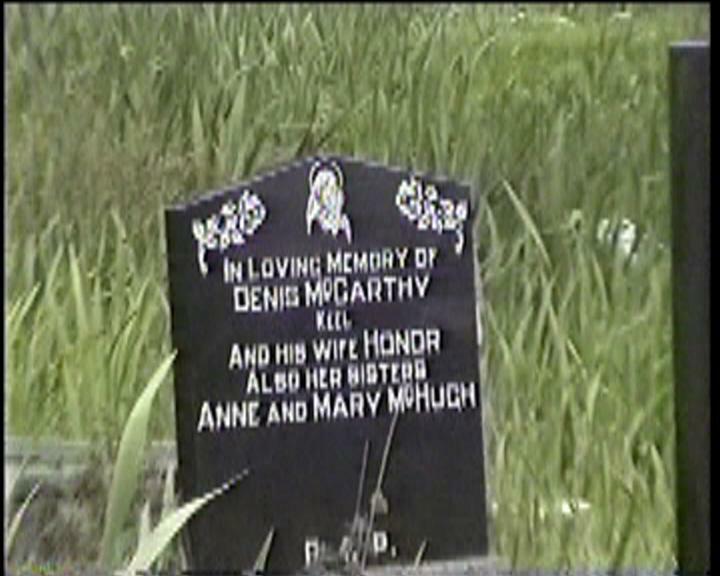 In Loving Memory of DENIS MCCARTHY Keel and his wife HONOR. 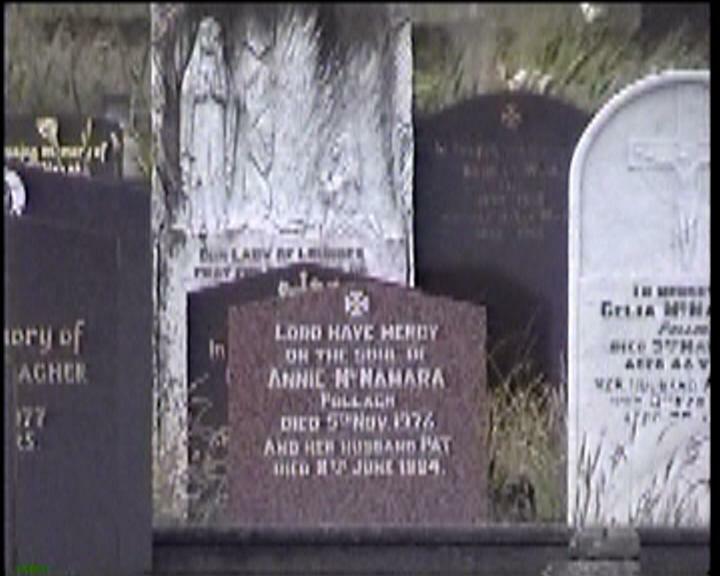 Also her sisters ANNE and MARY MCHUGH. 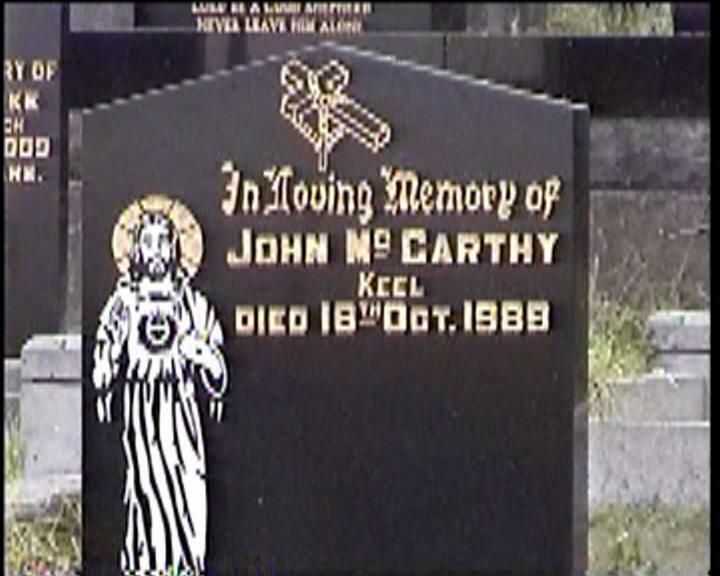 In Loving Memory of JOHN MCCARTHY Keel Died 16th Oct. 1989. 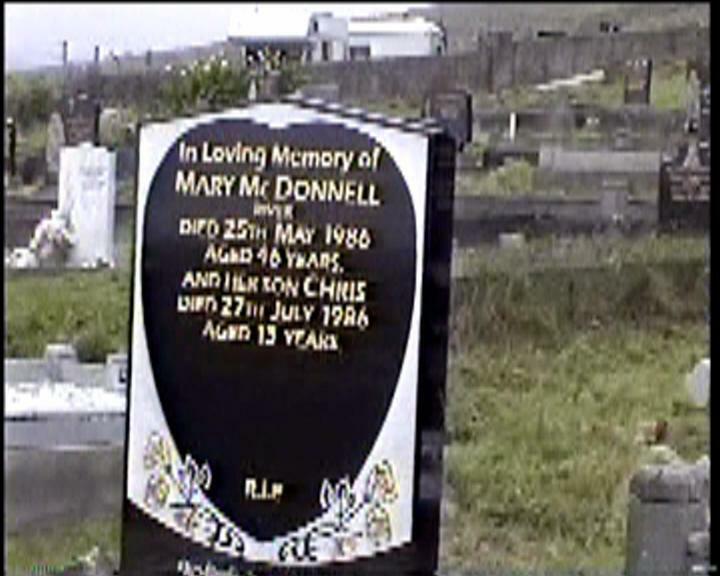 In Loving Memory of MARY MCDONNELL River Died 25th May 1986 aged 46 years, and her son CHRIS died 27th July 1986 aged 13 years. 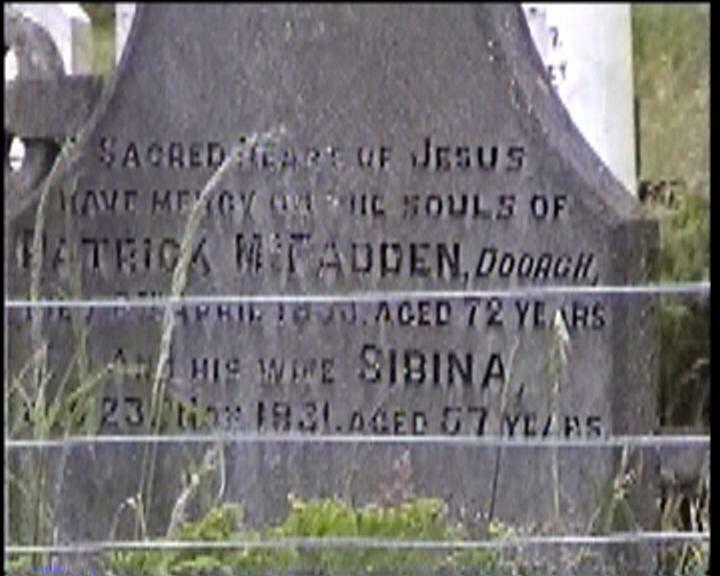 Pray for the soul of PATRICK MCFADDEN Dugort Died 12 Feb. 1942 Aged 43 years. 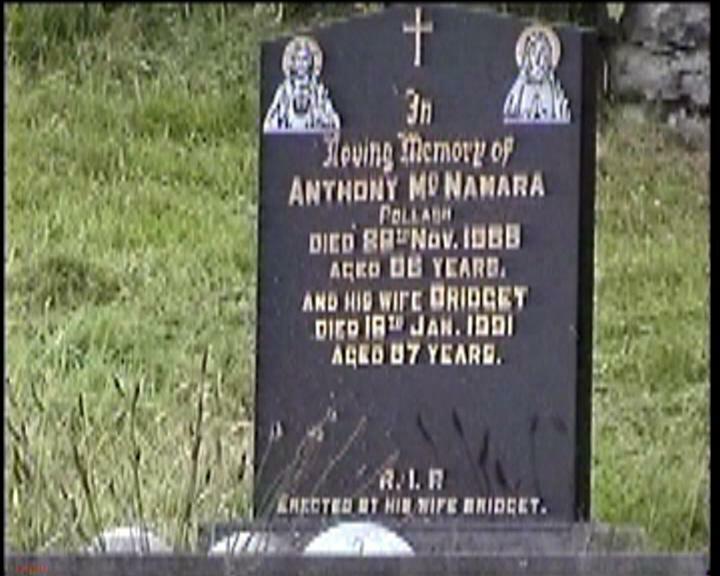 And his brothers ANTHONY died May 1983 MARTY died June 1970 and their sister ? 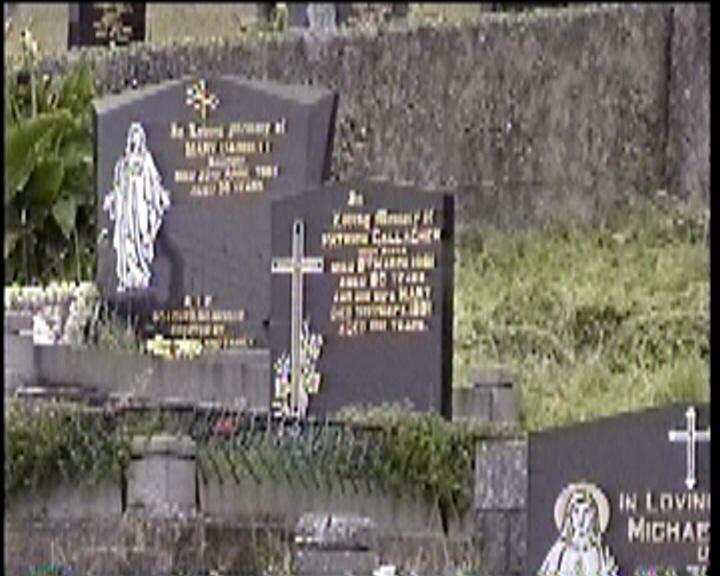 Sacred Heart of Jesus have mercy on the souls of PATRICK MCFADDEN, Dooagh who died 8th April 1933 aged 72 years. And his wife SIBINA who died 23rd Nov. 1931 aged 57 years. 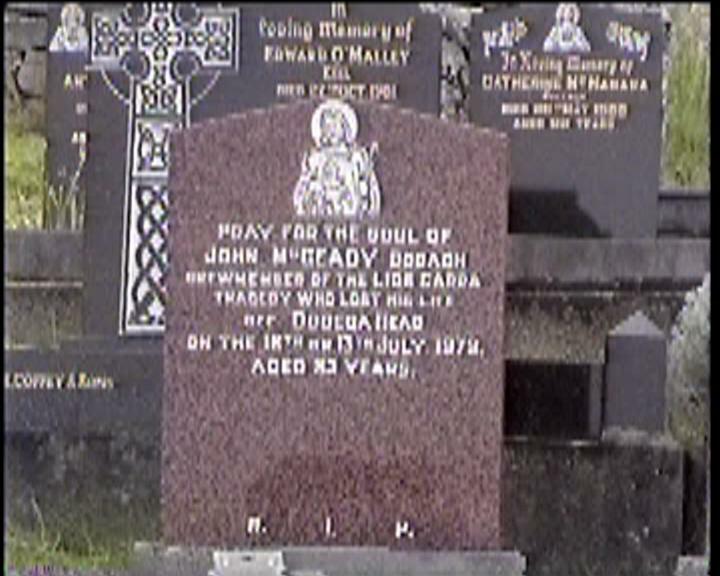 Pray for the soul of JOHN MCGEADY Dooagh. 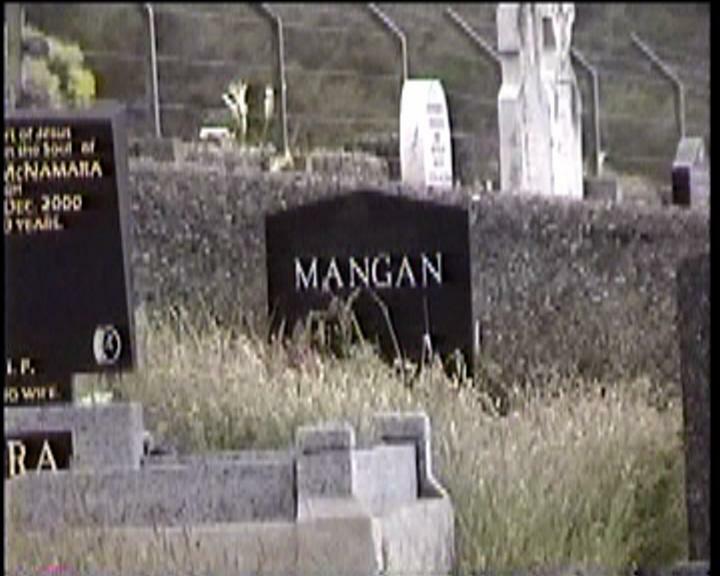 Crewmember of the Lios Carra tragedy who lost his life off Dooega Head on the 12th or 13th July 1979, aged 23 years. 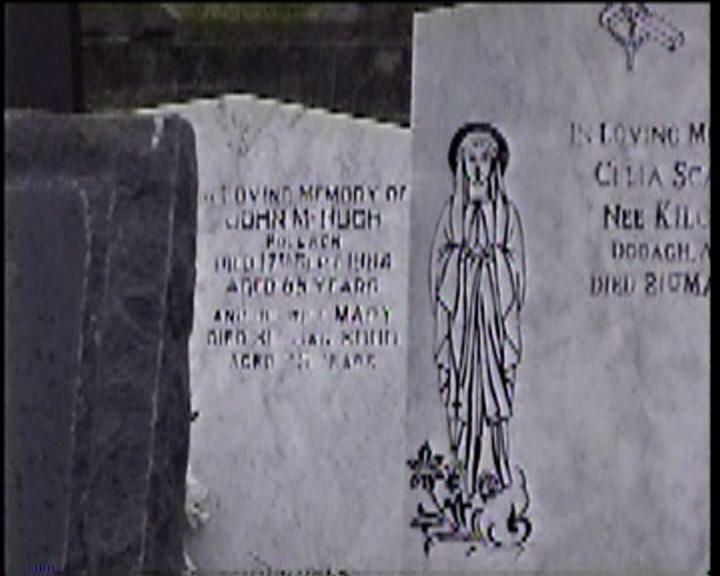 In Loving Memory of JOHN MCHUGH Pollagh Died 17th Sept. 1984 aged 65 years. 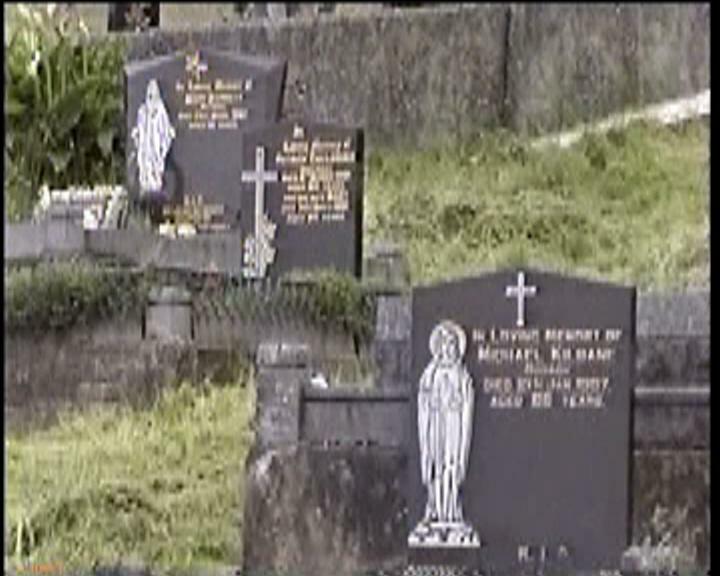 And his wife MARY died 31st Jan. 2000 aged 75 years. 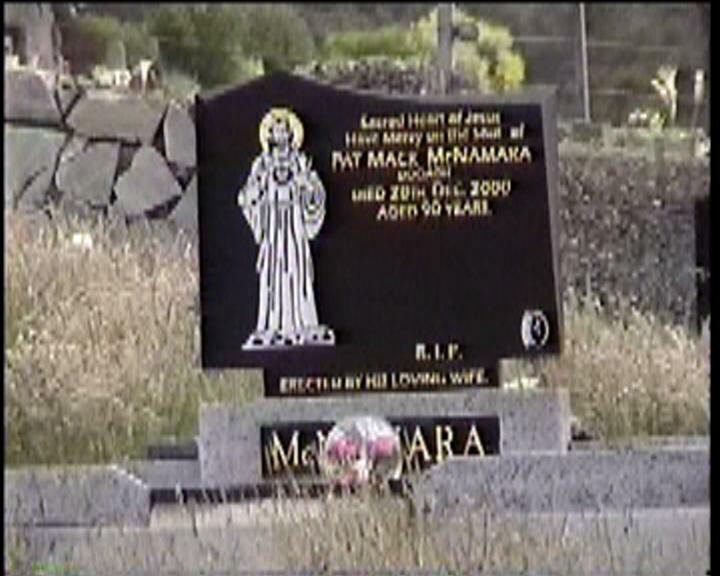 Sacred Heart of Jesus Have Mercy on the Soul of PAT MACK MCNAMARA Dooagh, Died 28th Dec.2000 aged 90 years. 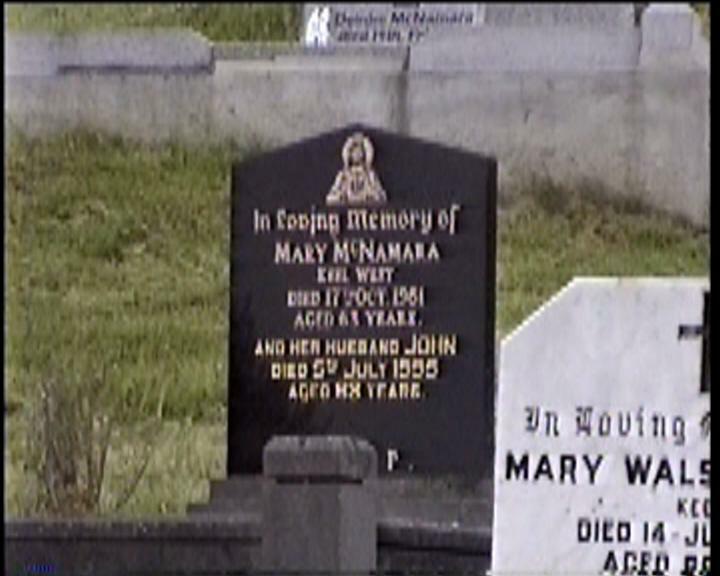 In Loving Memory of MARY MCNAMARA Keel West Died 17th Oct. 1981 aged 63 years. And her husband JOHN died 5th July 1995 aged 83 years. 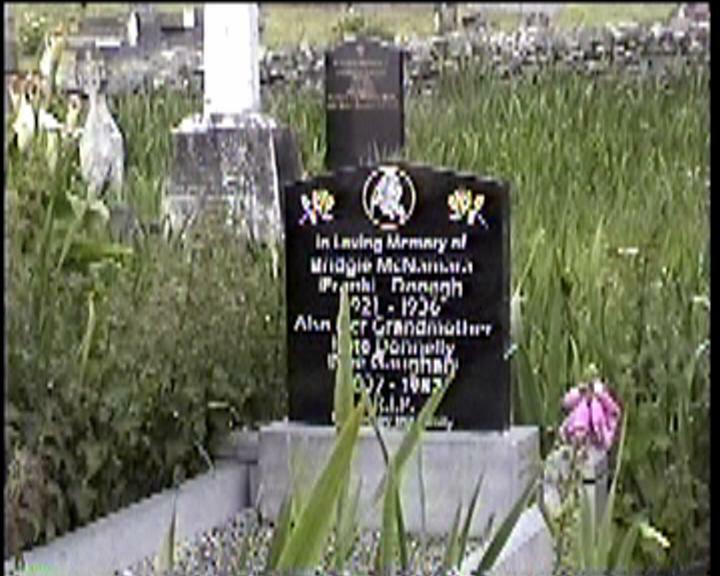 In Loving Memory of CATHERINE MCNAMARA Pollagh Died 28th May 1980 aged 98 years. 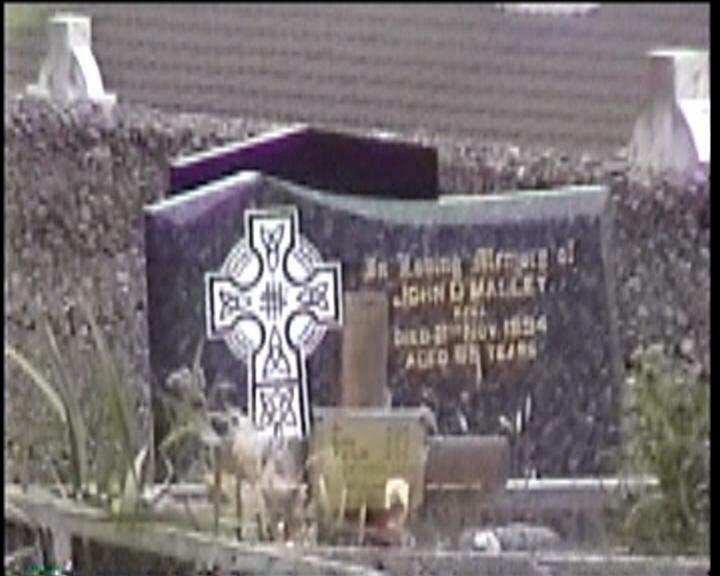 In Loving Memory of JOHN T. MACNAMARA Dooagh Who died 13th Jan. 1939 aged 91 years. 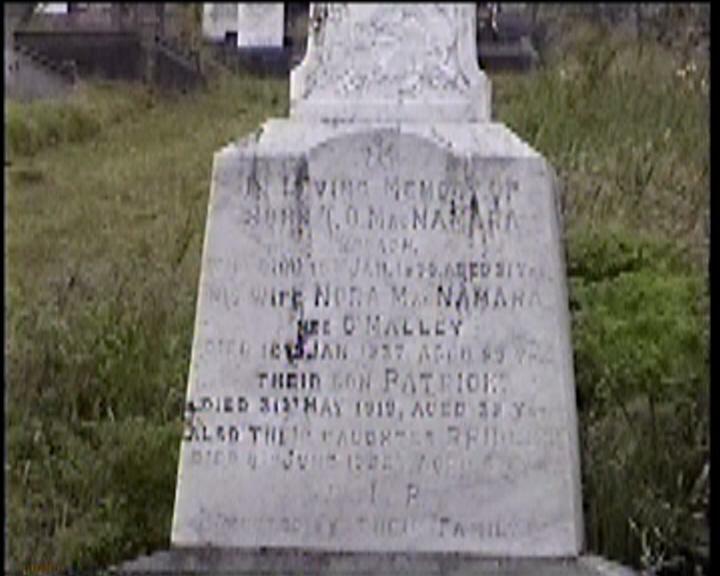 And his wife NORA MACNAMARA nee OMALLEY died 12th Jan. 1937 aged 83 years. 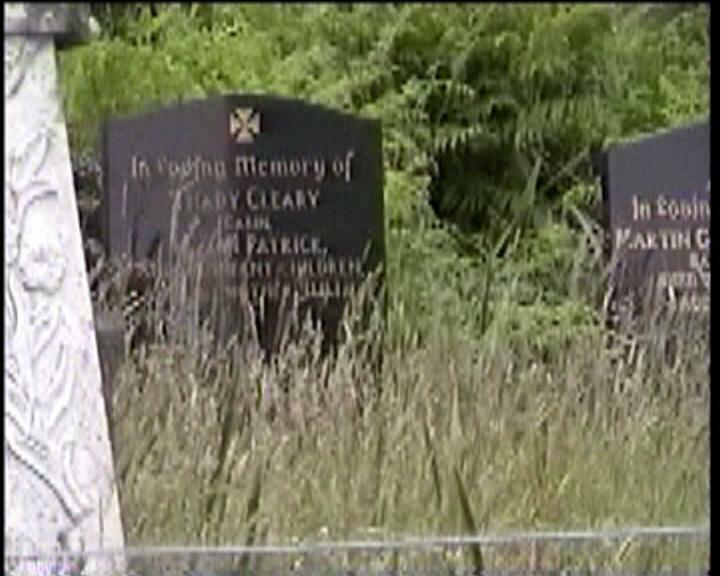 Their son PATRICK died 31st May 191 aged 39 years. 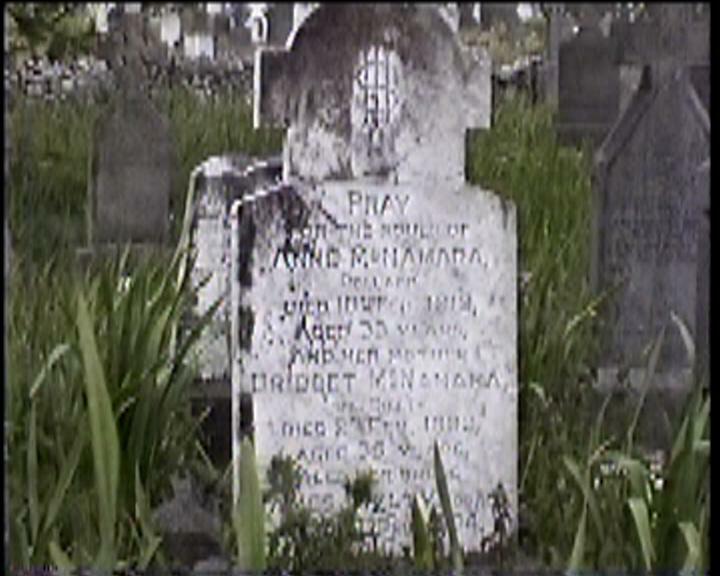 Also their daughter BRIDGET died 8th June 1932 Aged 57 years. 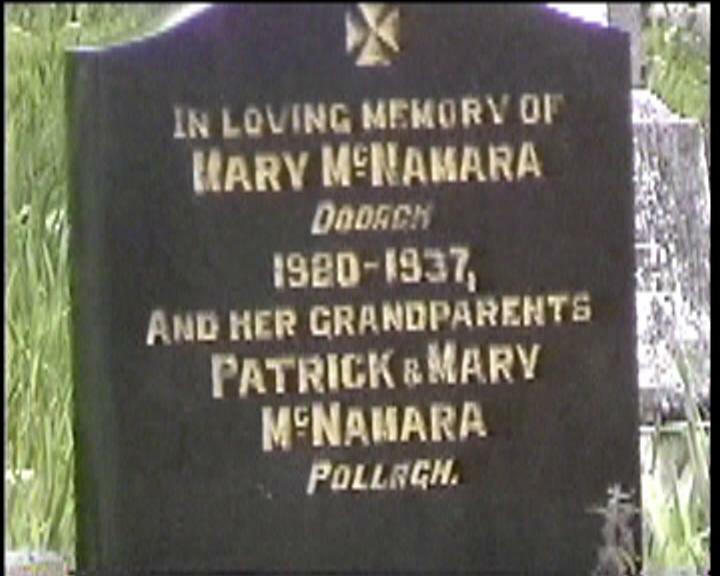 In Loving Memory of MARY MCNAMARA Dooagh 1920-1937, and her grandparent PATRICK and MARY MCNAMARA Pollagh. 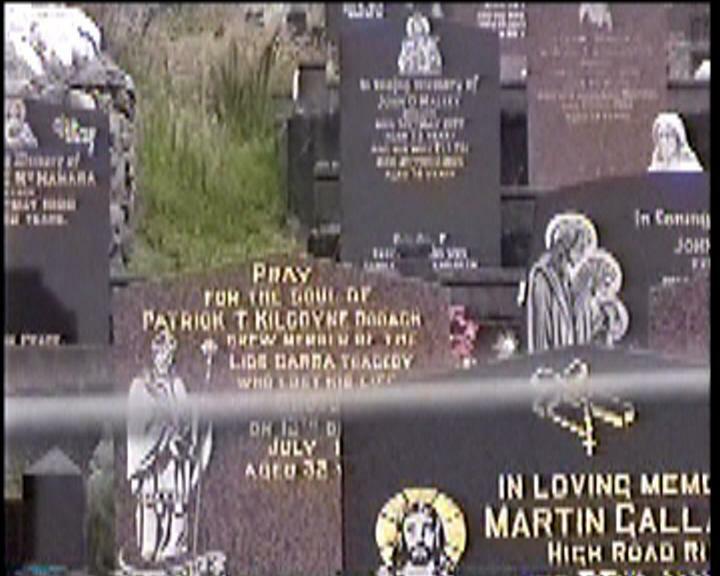 Pray for the souls of ANNE MCNAMARA Pollagh. Died 18th Feb. 1919 aged 33 years. And her mother BRIDGET MCNAMARA nee GIELTY Died 23 Feb. 1893 aged 35 years. 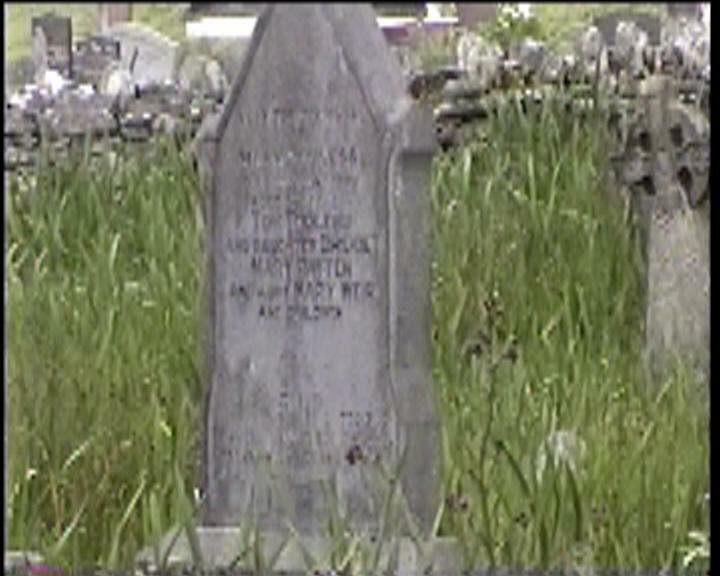 Also her uncle JAMES GIELTY Dooagh died Dec. 1894. 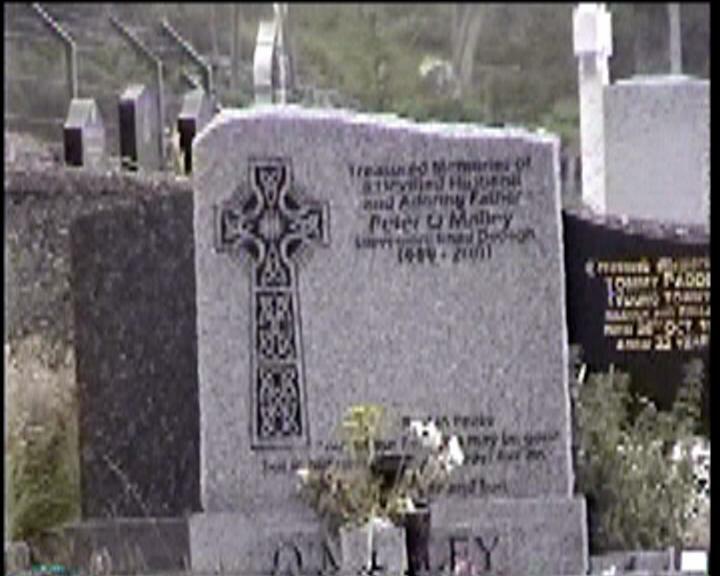 In Loving Memory of ANTHONY MCNAMARA Pollagh Died 28th Nov. 1989 aged 86 years. 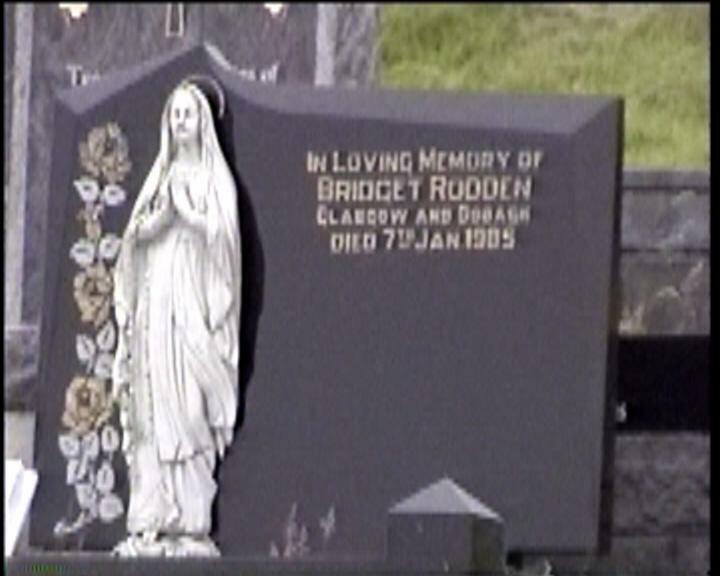 And his wife BRIDGET Died 16th Jan. 1991 aged 87 years. In Memory of CELIA MCNAMAR Pollagh. Died 3rd May 1954 aged 46 years. 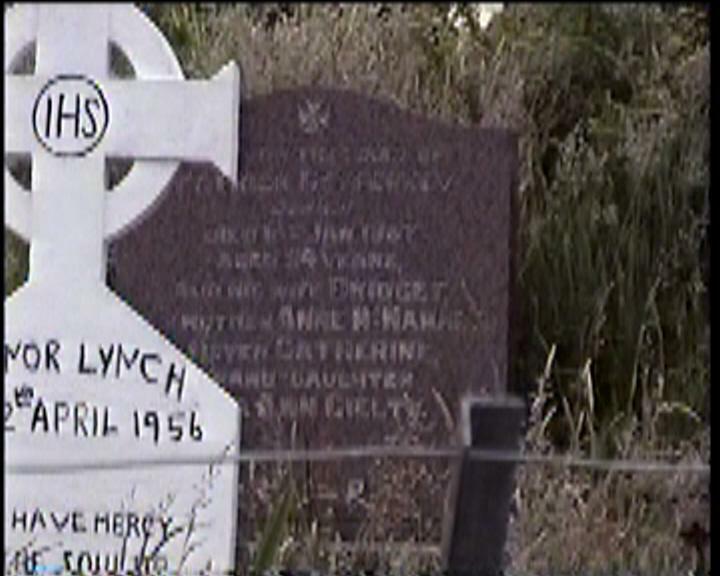 Her husband ANTHONY Died 3rd March 1985 aged 75 years. In Loving Memory of ANNIE MCNAMARA Keel West Dooagh. Died 22nd Feb. 1973 aged 55 years. 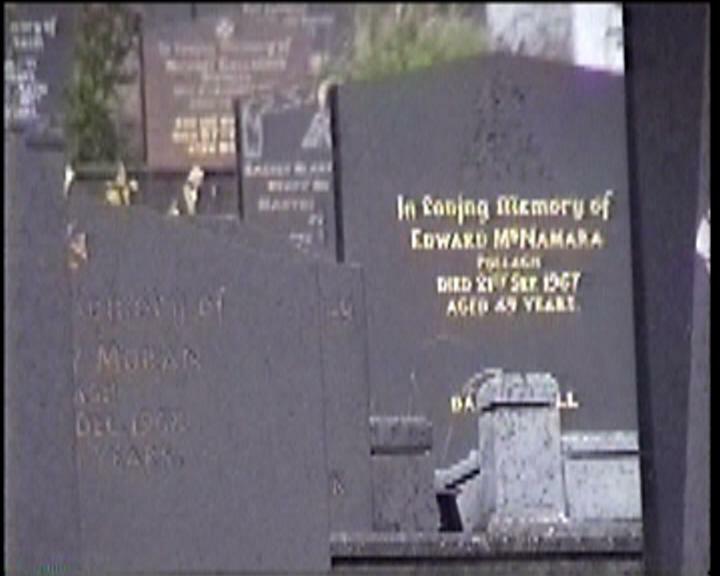 In Loving Memory of EDWARD MCNAMARA Pollagh. Died 21st Sep. 1967 aged 49 years. 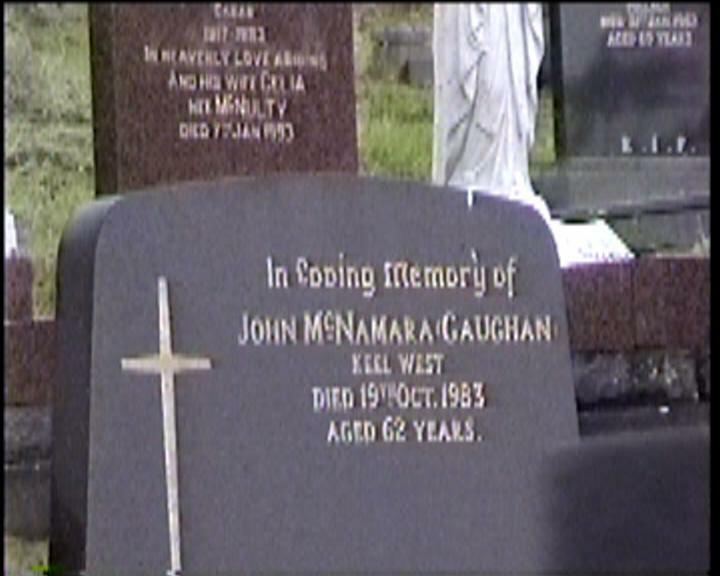 In Loving Memory of JOHN MCNAMARA (Gaughan) Keel West. Died 19th Oct. 1983 aged 62 years. 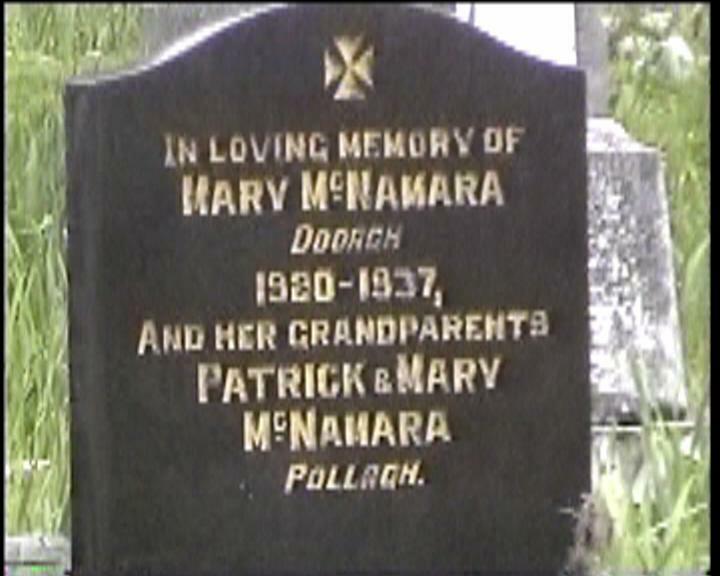 In Loving Memory of MARY MCNAMARA Dooagh, 1920-1937 And her Grandparents PATRICK and MARY MCNAMARA Pollagh. 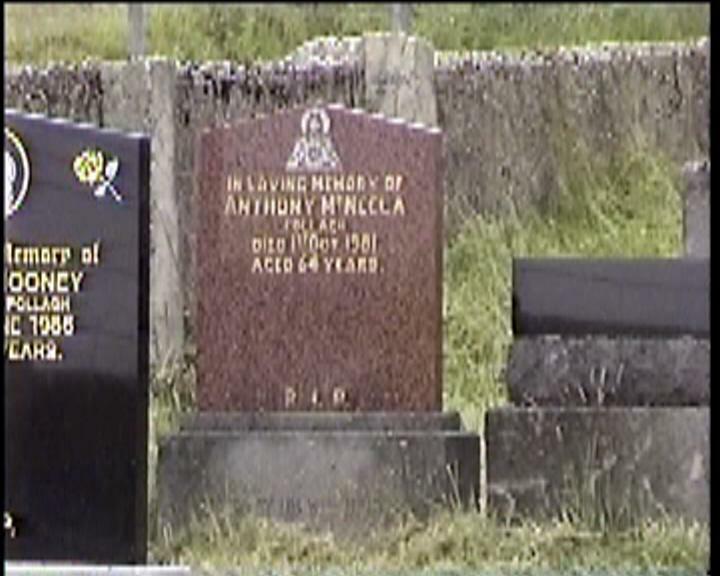 In Loving Memory of ANTHONY MCNEELA Pollagh Died 1st Oct. 1981 aged 64 years. JOSEPH “JOE” MULLIGAN Caban 1917-1983. In Heavenly Love Abiding. 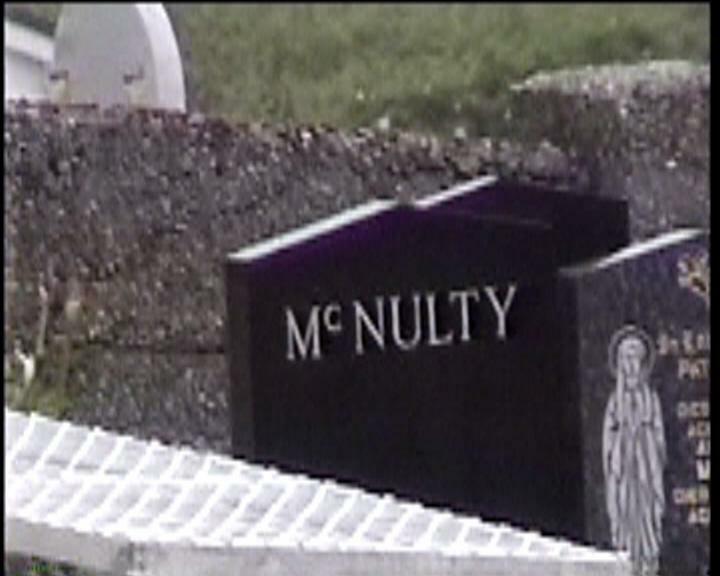 And his wife CELIA nee MCNULTY died 7th Jan. 1993. 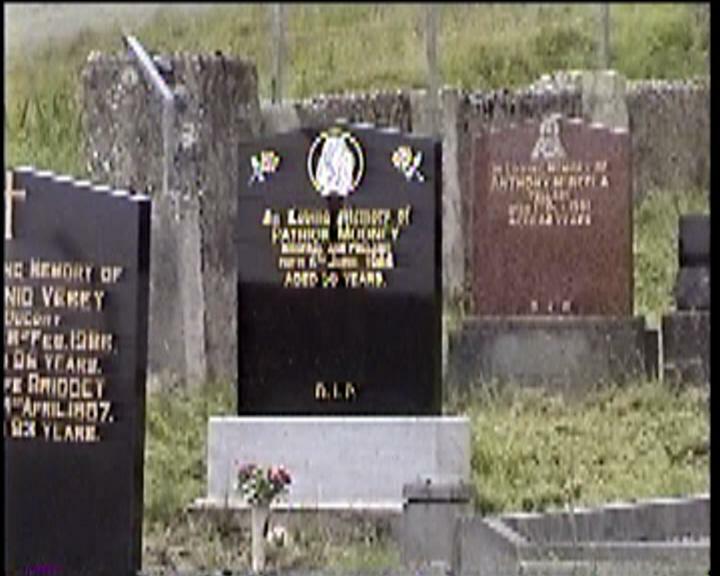 In Loving Memory of PATRICK MOONEY Donegal and Pollagh. Died 6th June 1986 aged 56 years. 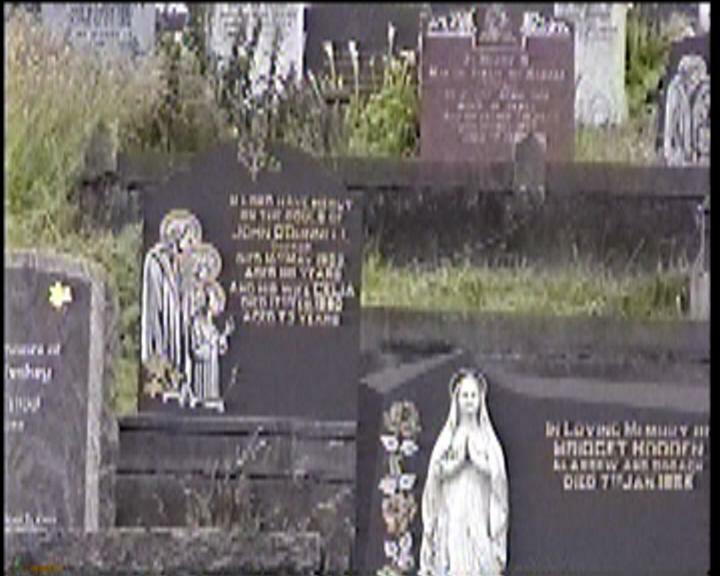 Sacred Heart of Jesus Have Mercy on the souls of JOSEPH MORAN Dooagh Died 7th May 1932 aged 76 years. And his daughter MARGARET died 21st Jan. ? aged 47 years. 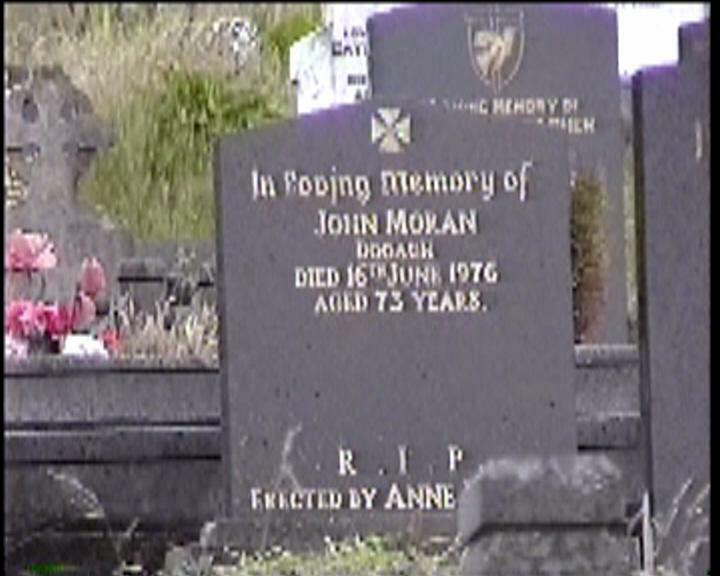 In Loving Memory of JOHN MORAN Dooagh Died 16th June 1976 aged 73 years. RIP. Erected by Anne ? 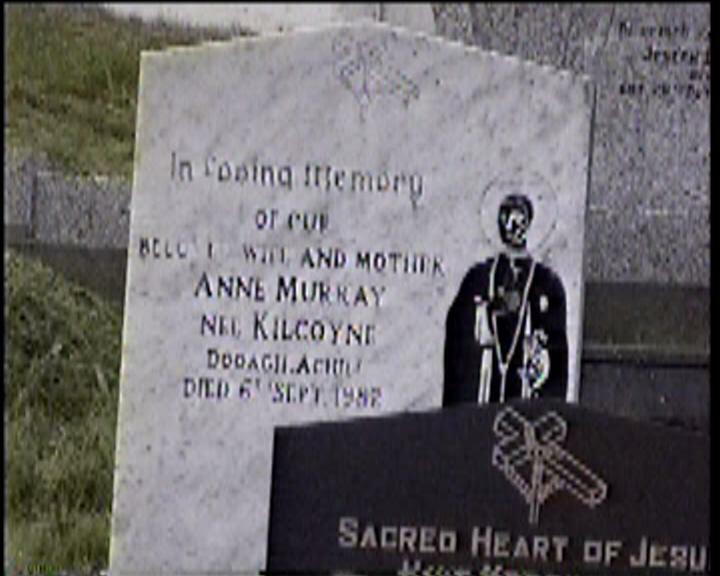 Sacred Heart of Jesus Have Mercy on the Soul of SEAN G. MULLOY Keel Died 16th March 1987 aged 61 years. 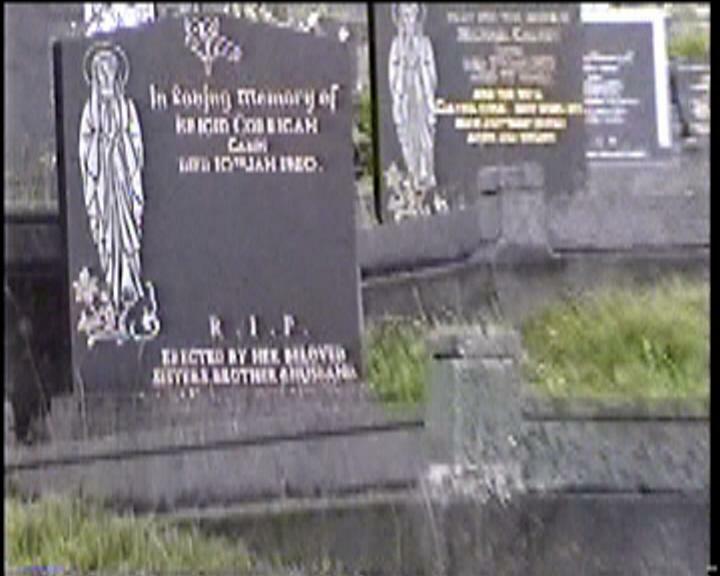 Pray for the soul of BRIDGET MCHUGH nee NOLAN Died 22nd Aug. 1898 aged 88 years. And her daughter CELIA FADIAN died 13th April 1944 aged 87 years. Erected by her daughter CELIA MCFADDEN nee MCHUGH. In Loving Memory of JAMES O’DONNELL Dooagh. Died 1910. And his wife CATHERINE Died 1910. 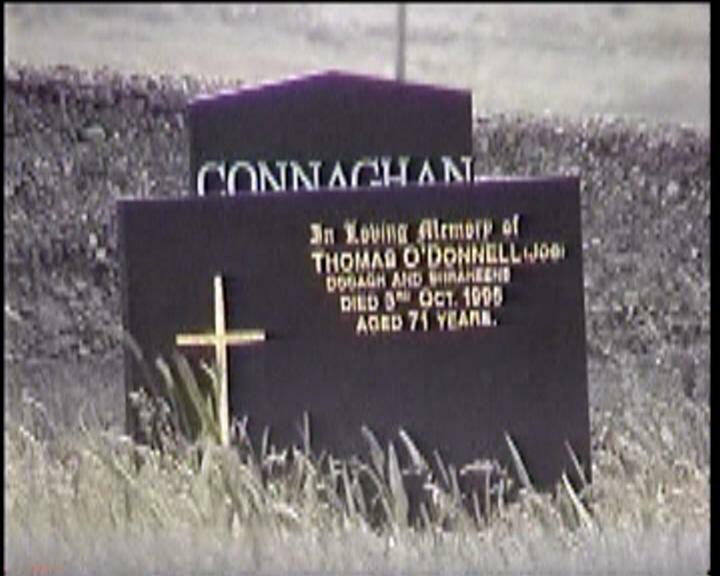 In Loving Memory of THOMAS O’DONNELL (JOE) Dooagh and Shraheens Died 3rd Oct. 1995 aged 71 years. 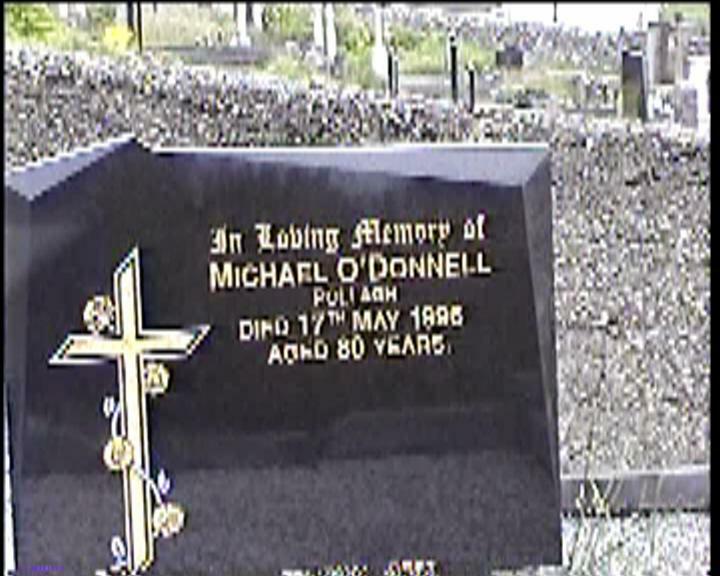 In Loving Memory of MICHAEL O’DONNELL Pollagh. Died 17th May 1996 aged 80 years. 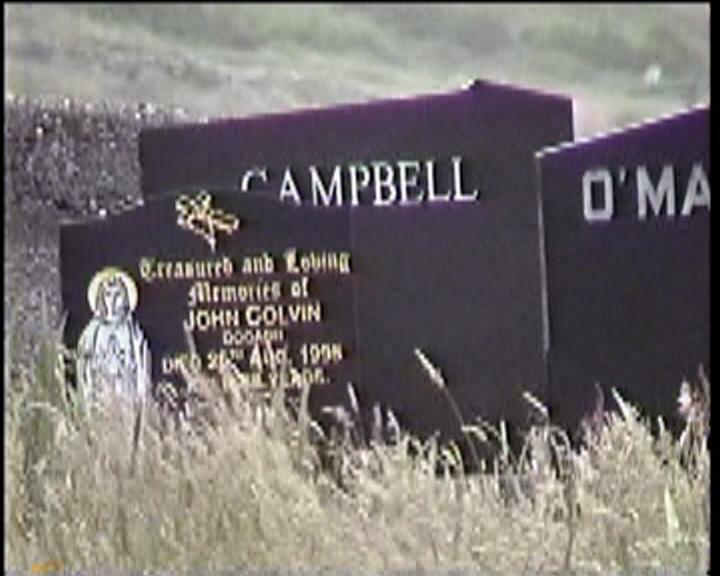 O Lord Have Mercy on the Souls of JOHN O’DONNELL Dooagh died 16th May 1985 aged 80 years. And his wife CELIA died 17th Feb. 1990 aged 75 years. 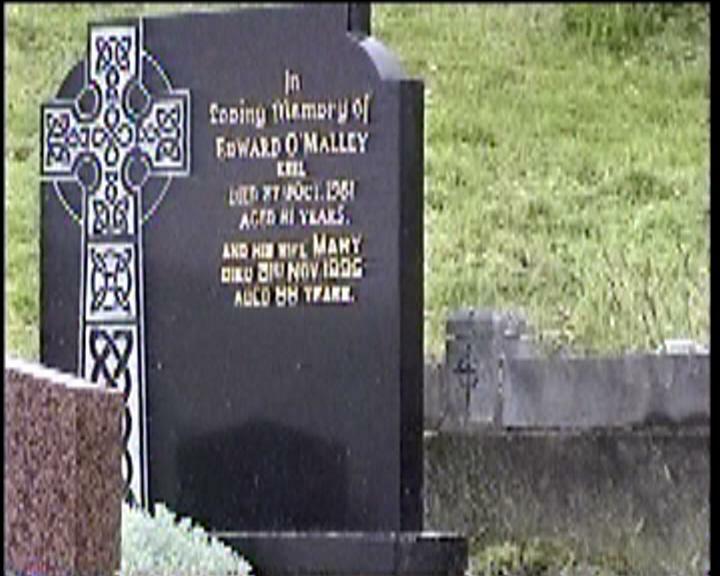 In Loving Memory of EDWARD O’MALLEY Keel Died 27th Oct. 1981 aged 51 years. And his wife MARY ? 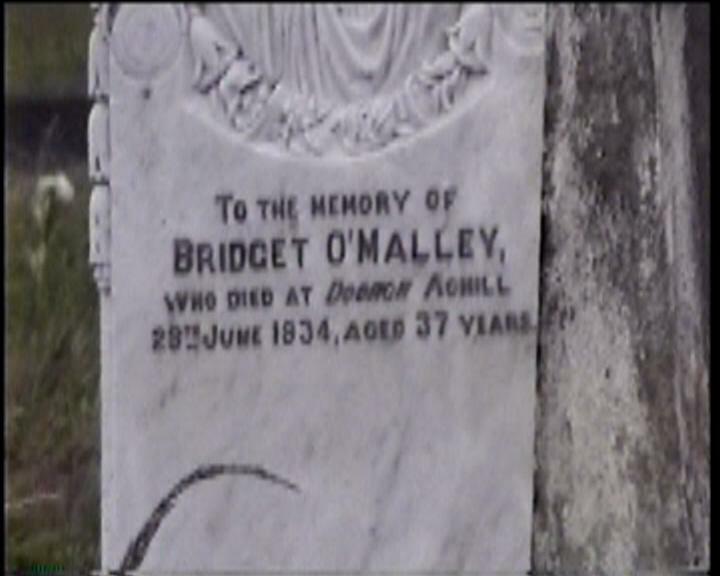 To the Memory of BRIDGET O’MALLEY who died at Dooagh Achill 29th June 1934 aged 37 years. 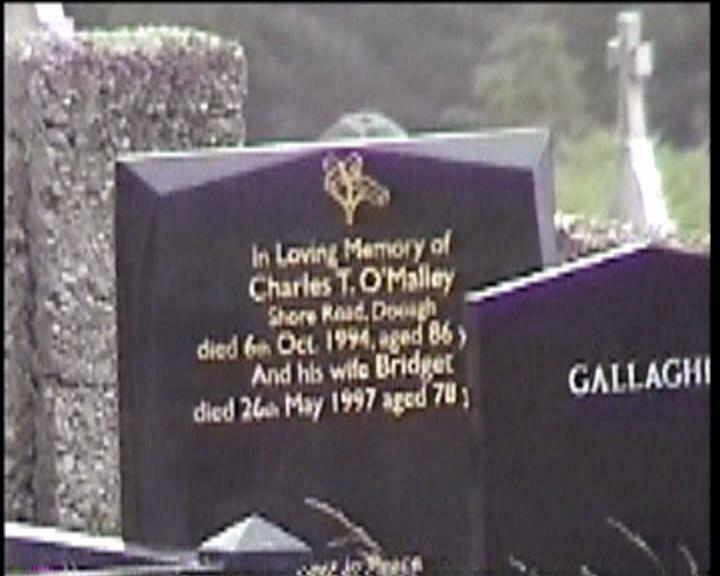 In Loving Memory of CHARLES T. O’MALLEY Shore Road, Dooagh. Died 6th Oct. 1994 aged 86 years. 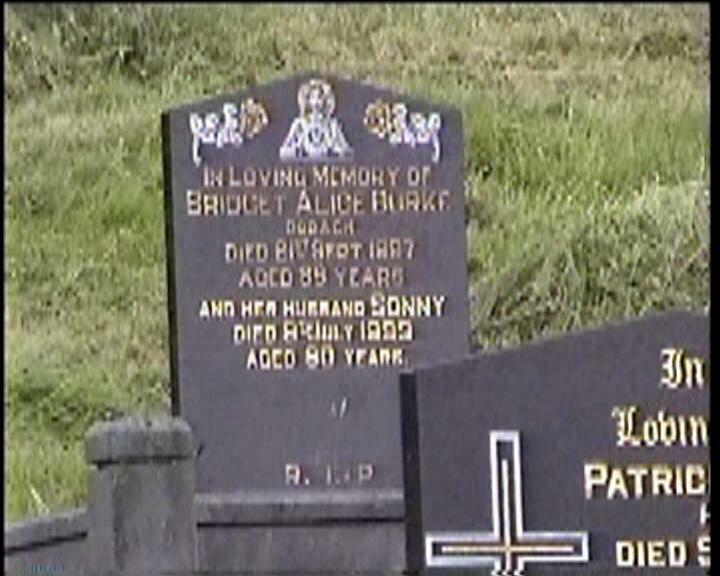 And his wife BRIDGET died 26th May 1997 aged 78 years. 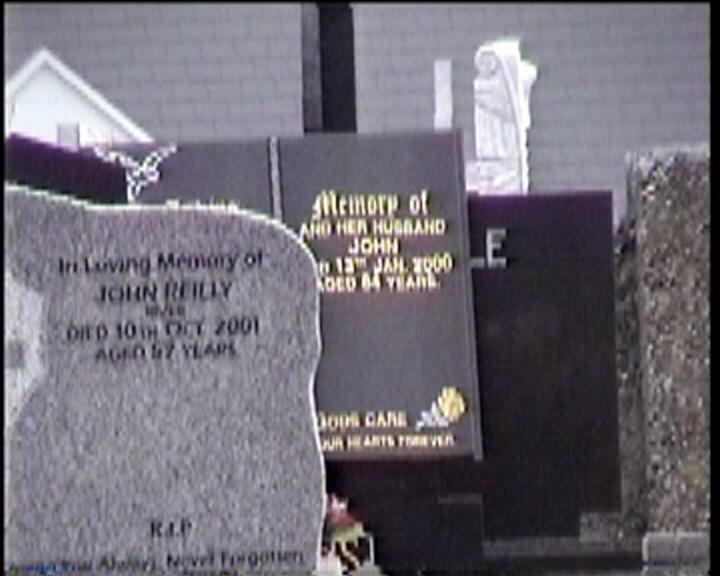 In Loving Memory of JOHN O’MALLEY Keel Died 2nd Nov. 1994 aged 85 years. In Loving Memory of JOHN O’MALLEY Dooagh. Died 30th May 1979 aged 73 years. And his wife ELLEN died 30th Nov. 1985 aged 76 years. 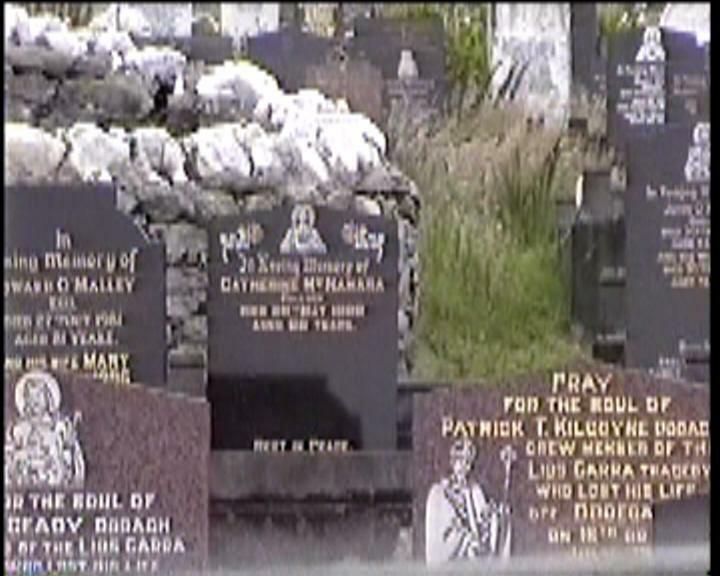 Treasured Memories of a Devoted Husband and Adoring Father PETER O’MALLEY, Slievemore Road, Dooagh. 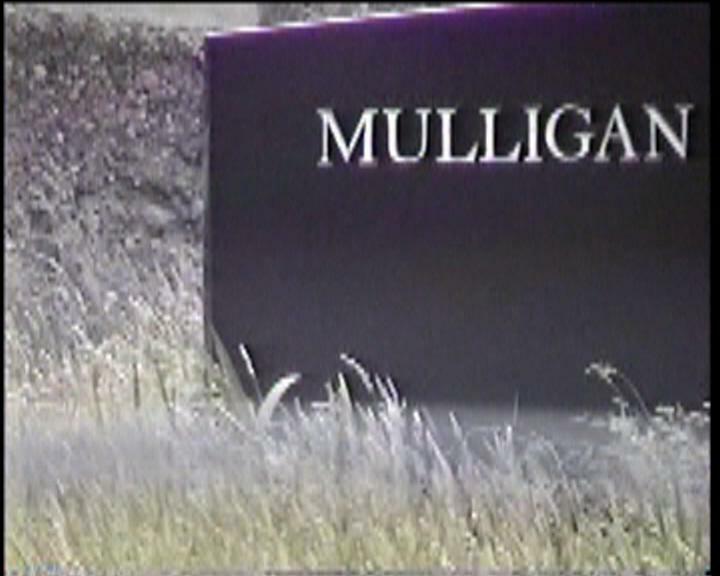 1959-2001. 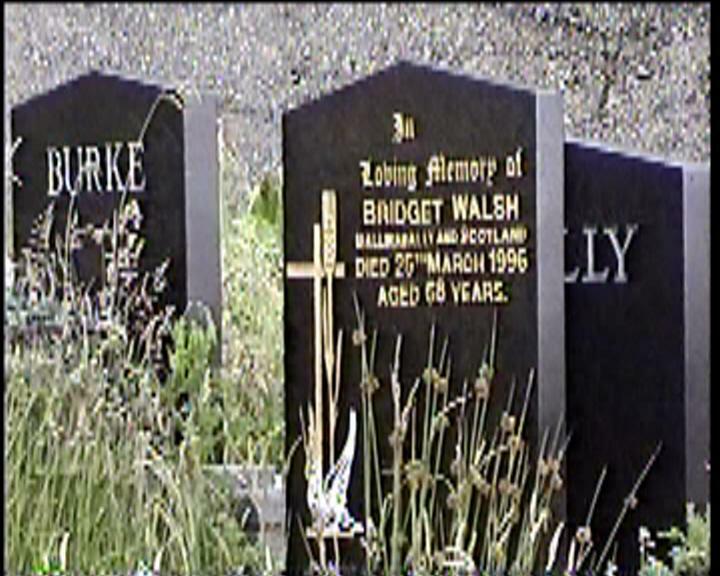 In Loving Memory of BRIDGET O’MALLEY Keel, West Dooagh Died 27th July 1997. 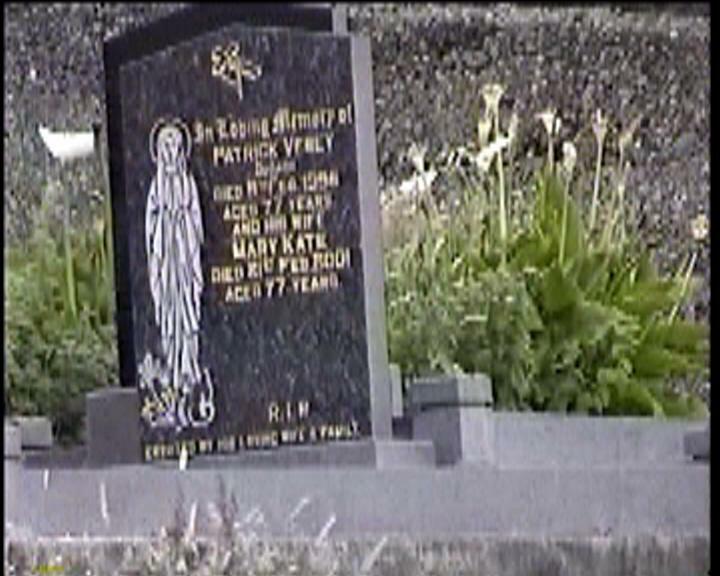 And her husband PAT died 26th March 1998. 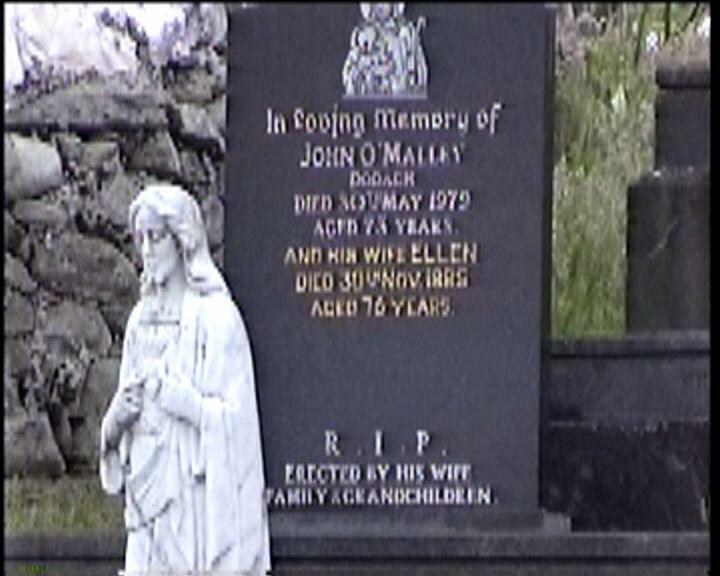 In Loving Memory of JOHN O’MALLEY Keel Died 20th Aug. 1989 aged 89 years. 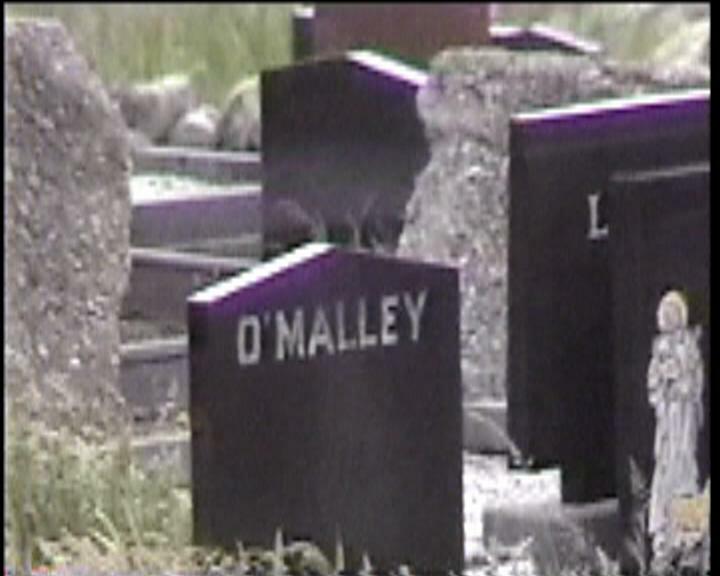 Have Mercy O Lord on the Soul of CHARLES O’MALLEY Died 23 Dec. 1890 Aged ? years. 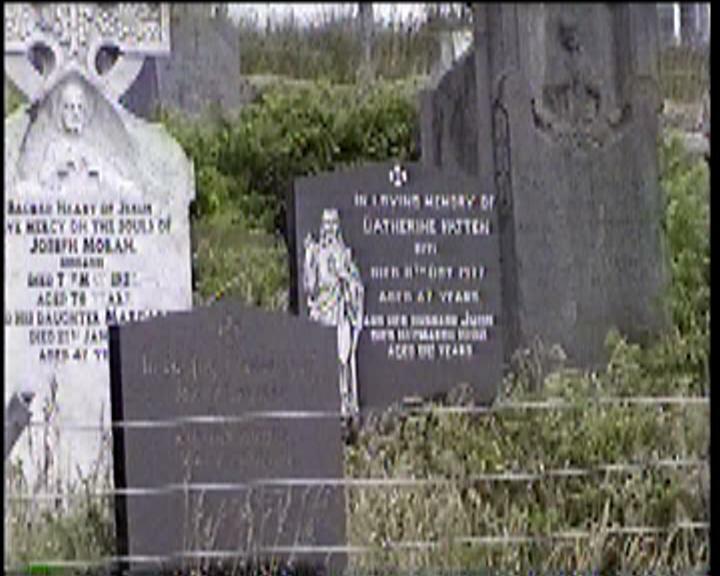 And his daughter CATHERINE PATTEN Died 20th Jan. 1954. 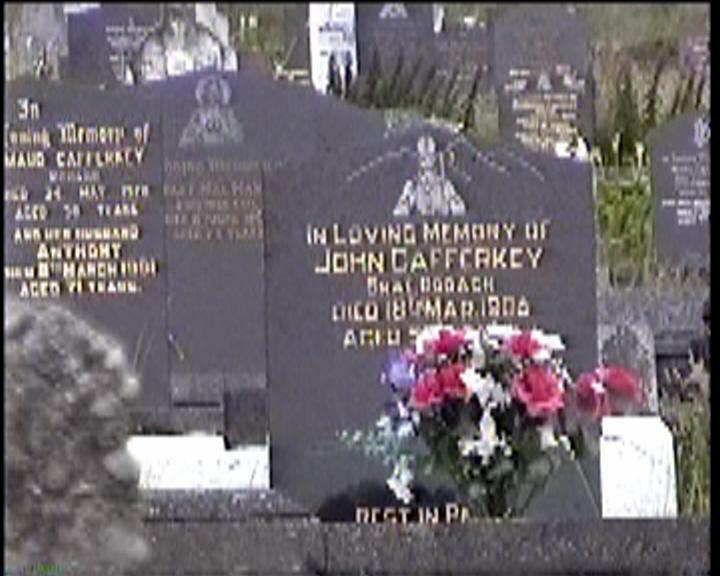 And her son JOHN died 31st Jan. 1979. 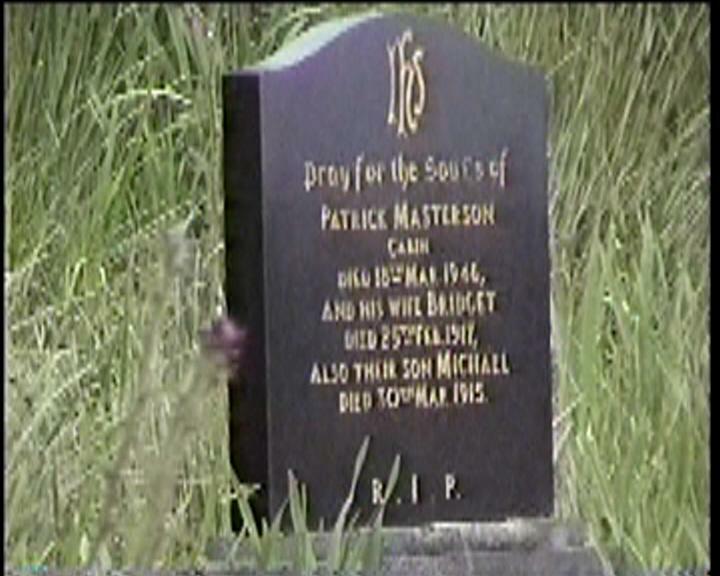 Also her daughter MARY PATTERSON died 19th Jan. 199?. Erected by his sons ANTHONY MICHAEL & PATRICK O’MALLEY. 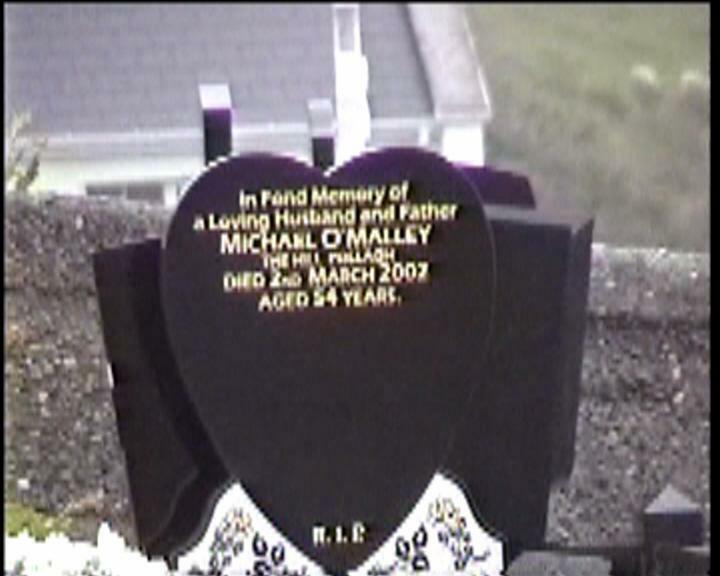 In Fond Memory of a Loving Husband and Father MICHAEL O’MALLEY The Hill, Poolagh. Died 2nd March 2002 aged 54 years. 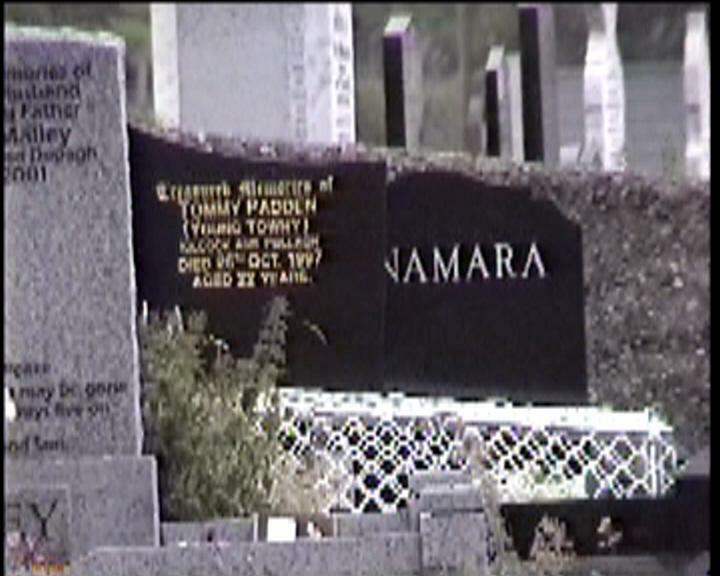 Treasured Memories of TOMMY PADDEN (YOUNG TOWNY) Kilcock and Pollagh. 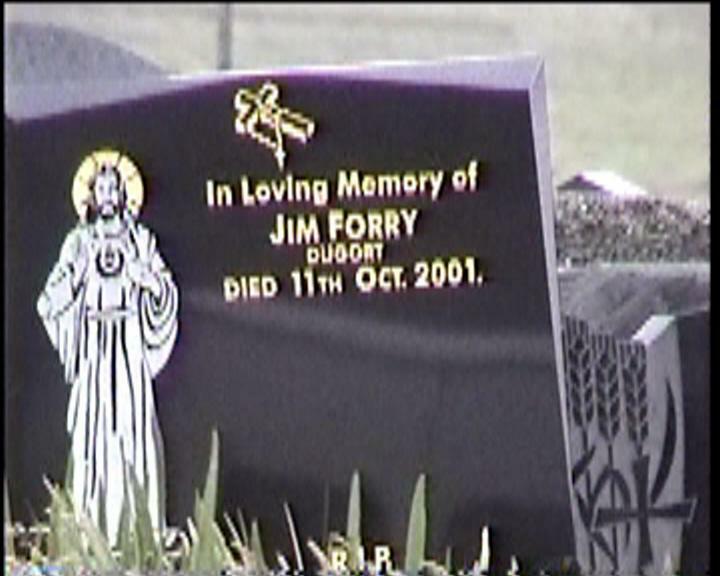 Died 26th Oct. 1997 aged 22 years. 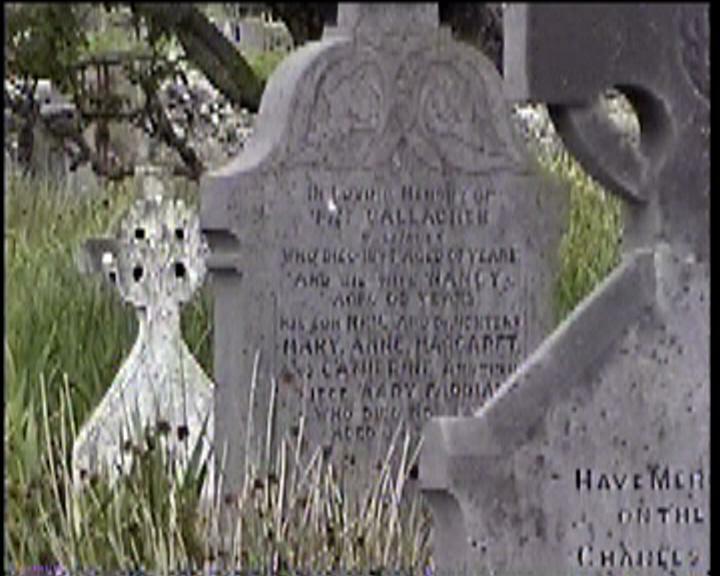 Have Mercy O Lord on the Soul of CHARLES O’MALLEY Died 23 Dec. 1890 Aged 45 years. 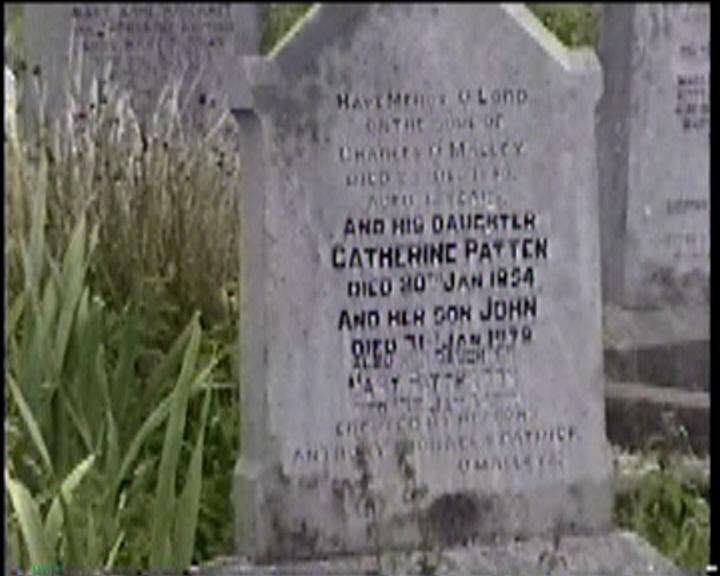 And his daughter CATHERINE PATTEN Died 20th Jan. 1954. 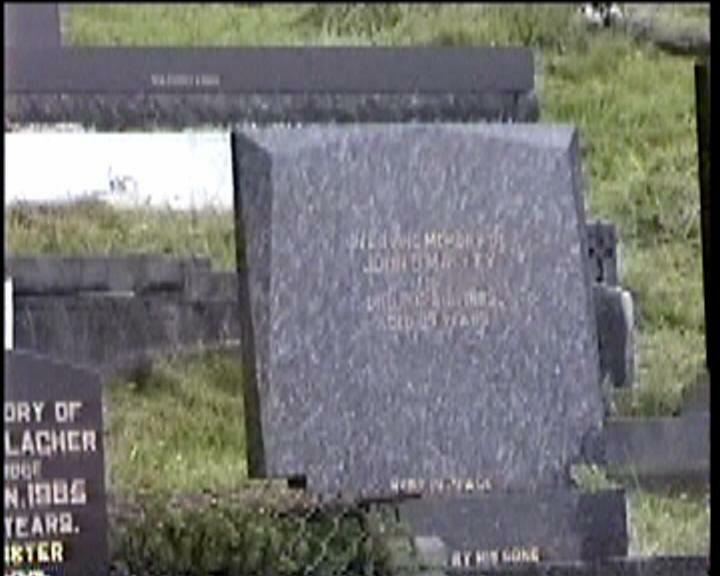 And her son JOHN died 31st Jan. 1979. 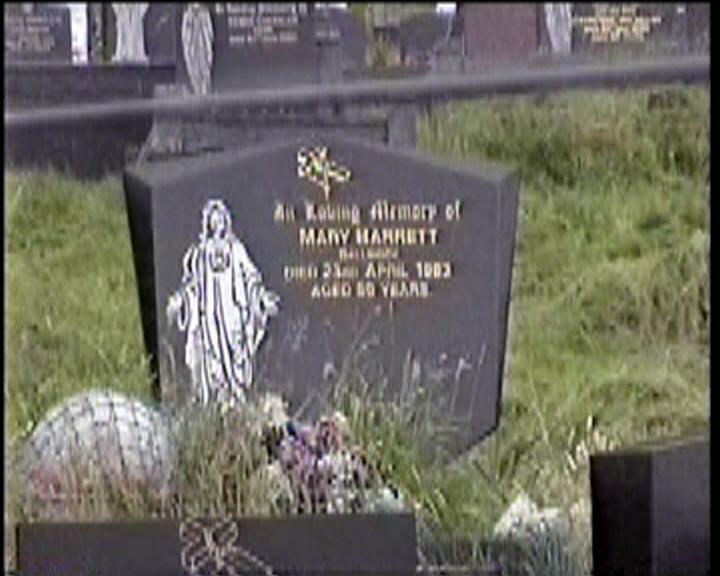 Also her daughter MARY PATTERSON died 19th Jan. 199?. Erected by his sons ANTHONY MICHAEL & PATRICK O’MALLEY. In Loving Memory of CATHERINE PATTON Keel Died 11th Oct. 1977 aged 67 years. And her husband JOHN died 10th March 1992 aged 82 years. In Loving Memory of ANTHONY J. RUDDY Dooagh 27.11.1938 – 19.12.1954? 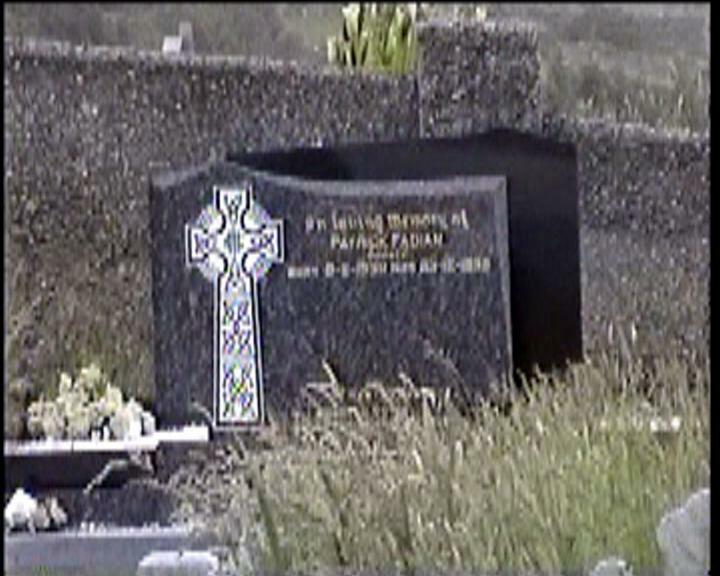 In Loving Memory of PATRICK VESEY Dooagh Died 9th Feb. 1995 aged 77 years. And his wife MARY KATE died 21st Feb. 2001 aged 77 years. In Loving Memory of DOMINIC VESEY Dugort Died 20th Feb. 1986 aged 86 years. 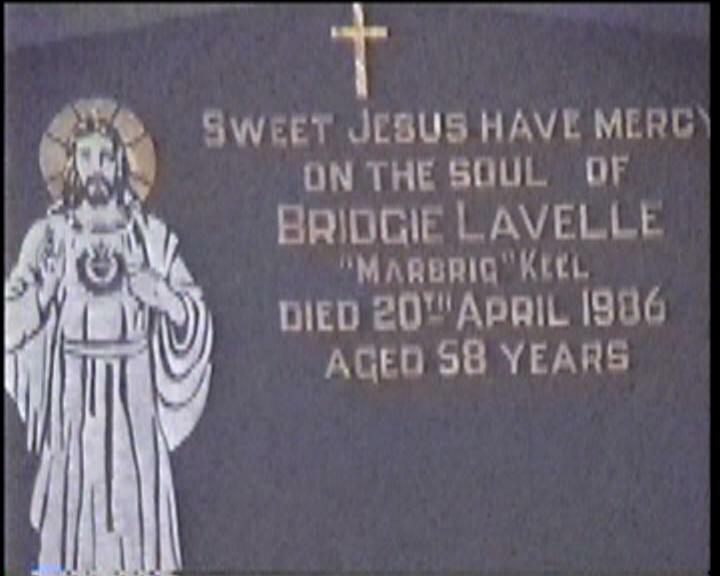 His wife BRIDGET died 24th April 1987, aged 83 years. In Loving Memory of BRIDGET WALSH Ballinasally and Scotland. Died 25th March 1996 aged 68 years. 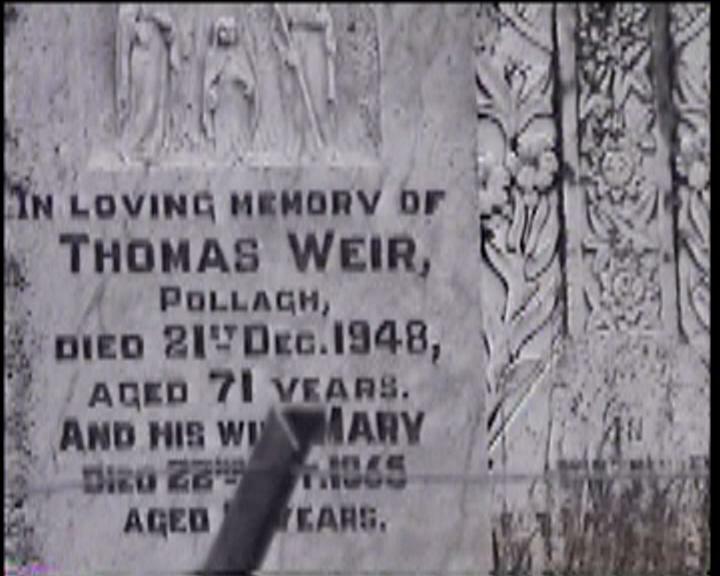 In Loving Memory of THOMAS WEIR Poolagh Died 21st Dec. 1948 aged 71 years. And his wife MARY died 22nd ? 1965 aged ? years.